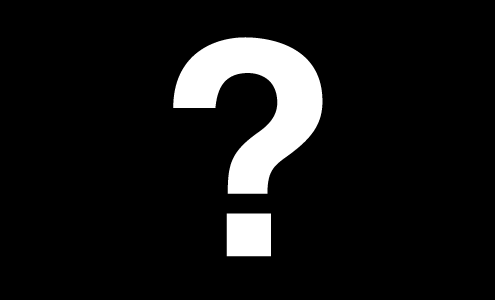 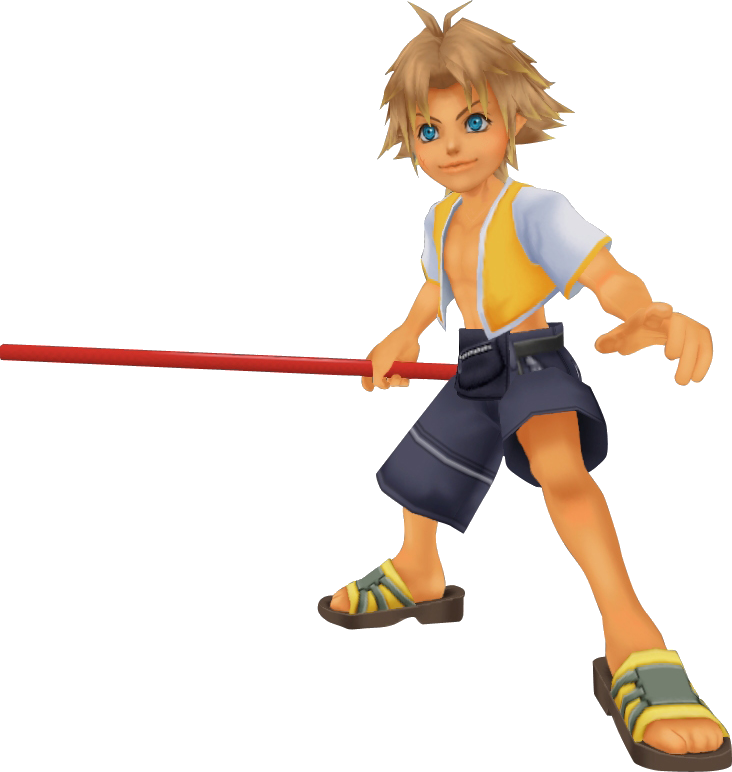 A normal kid that gets swept into an interesting little journey due to circumstances beyond his control. 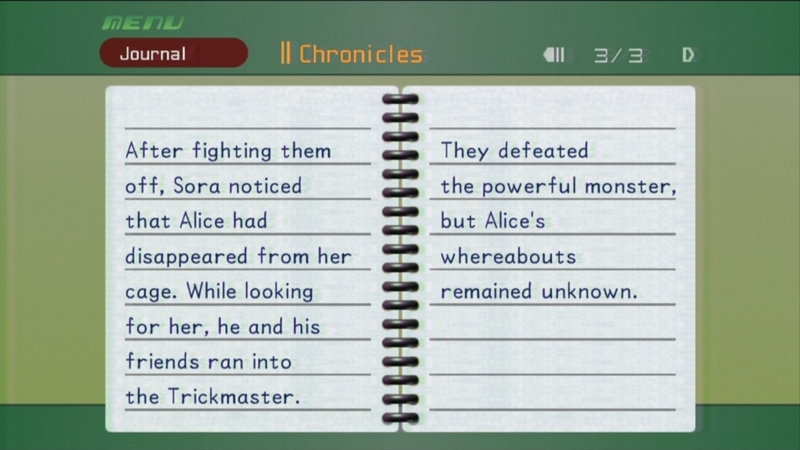 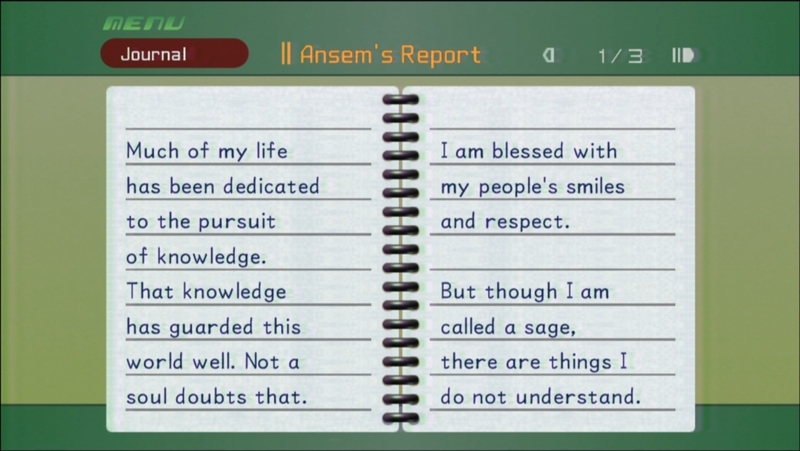 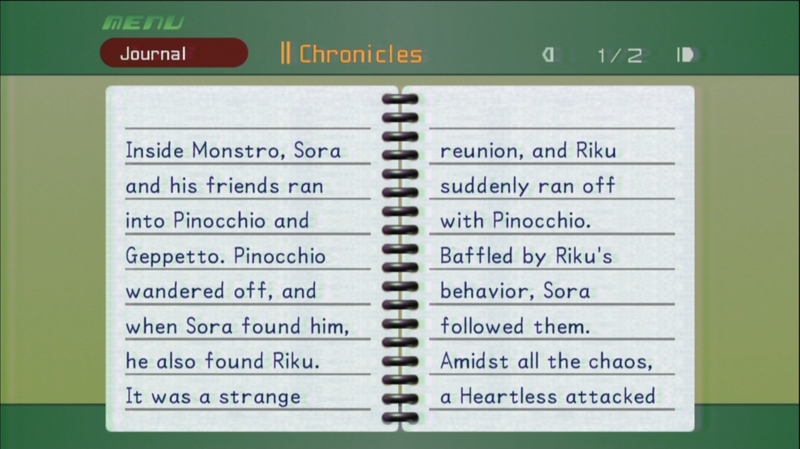 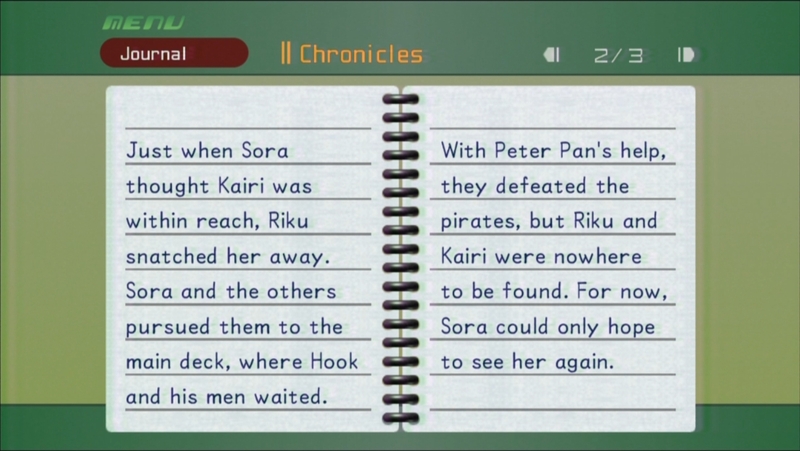 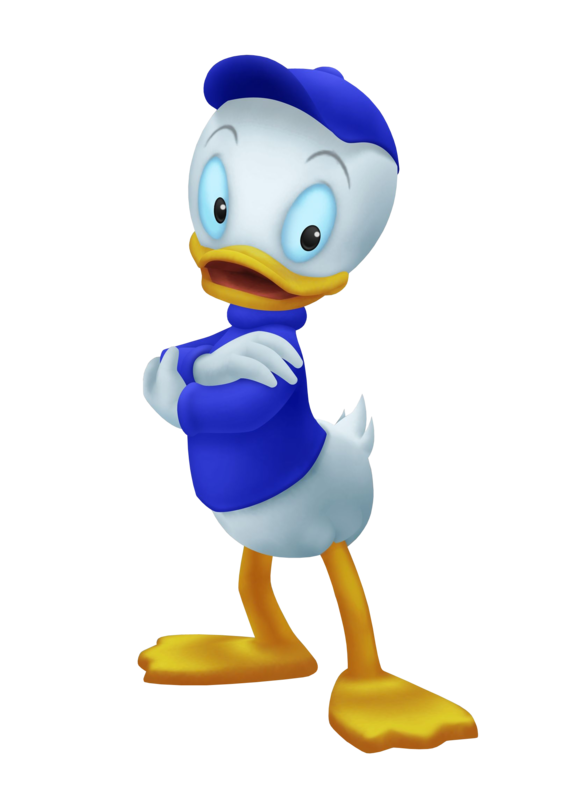 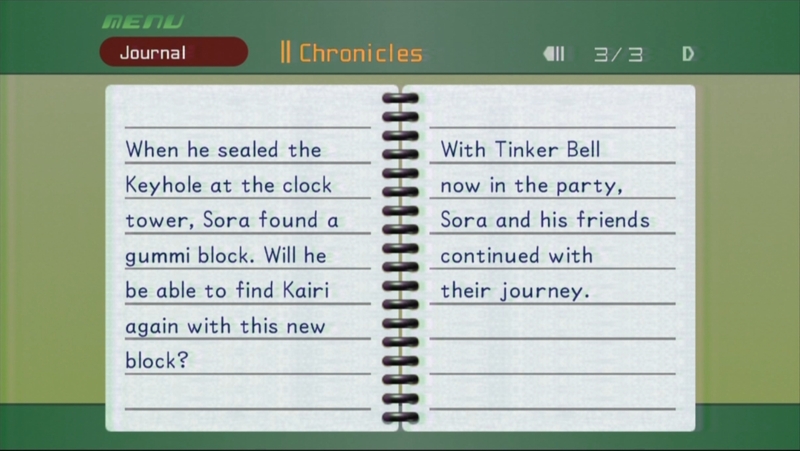 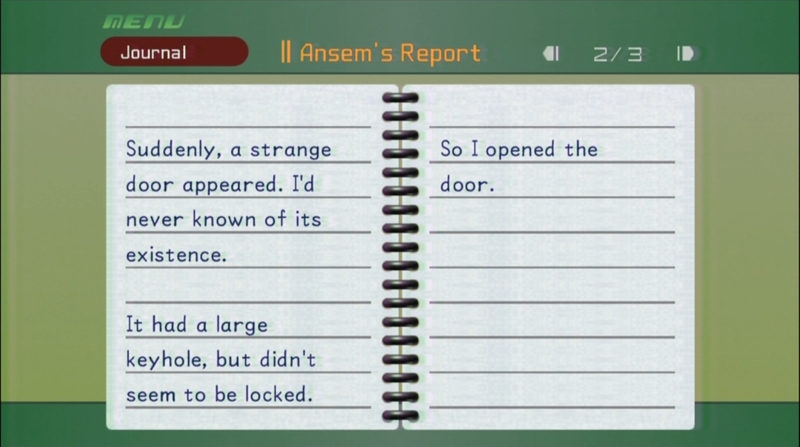 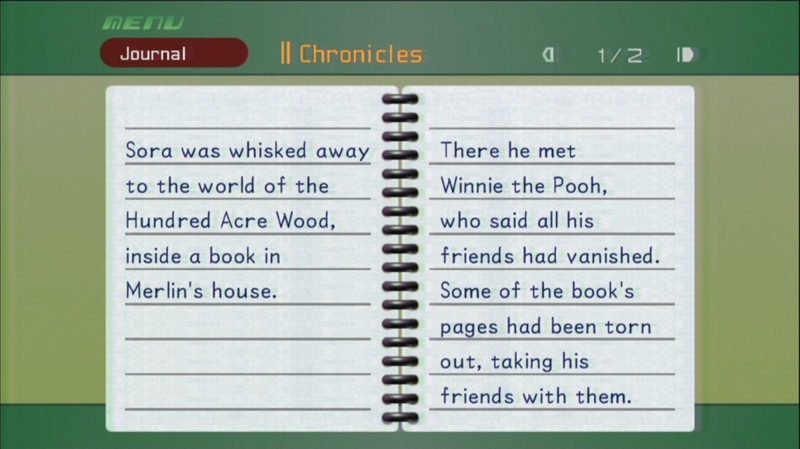 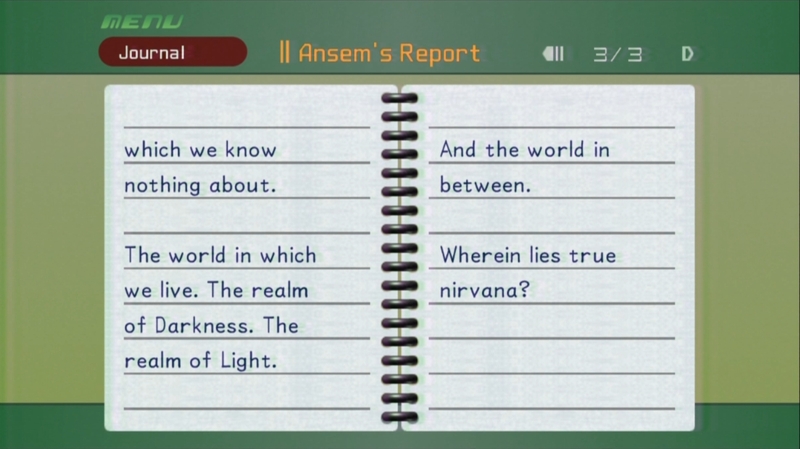 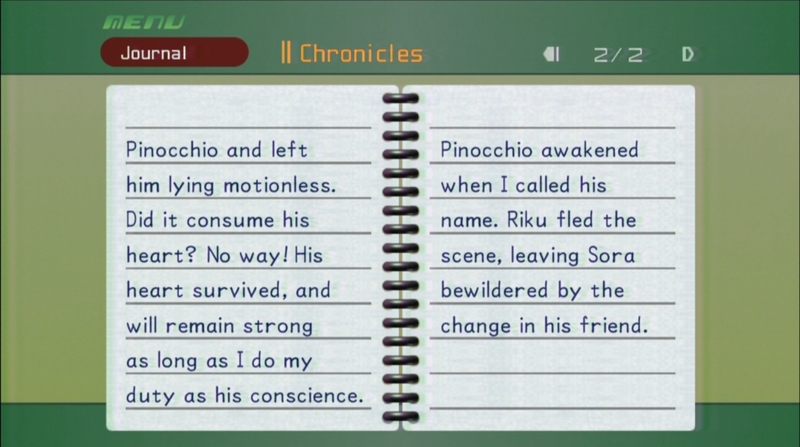 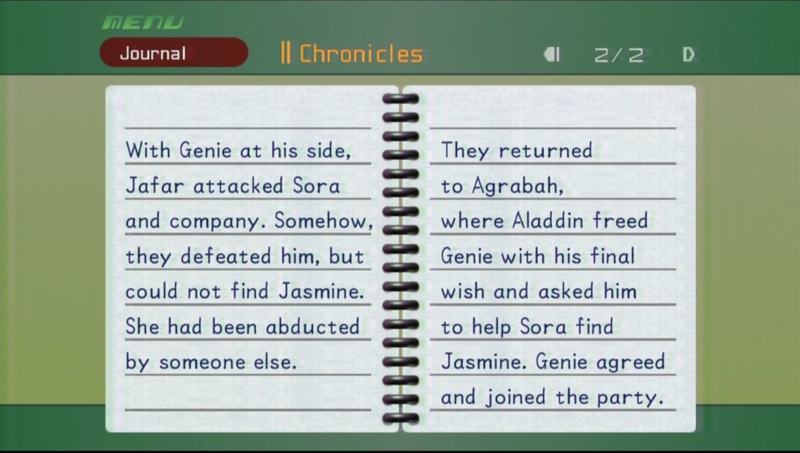 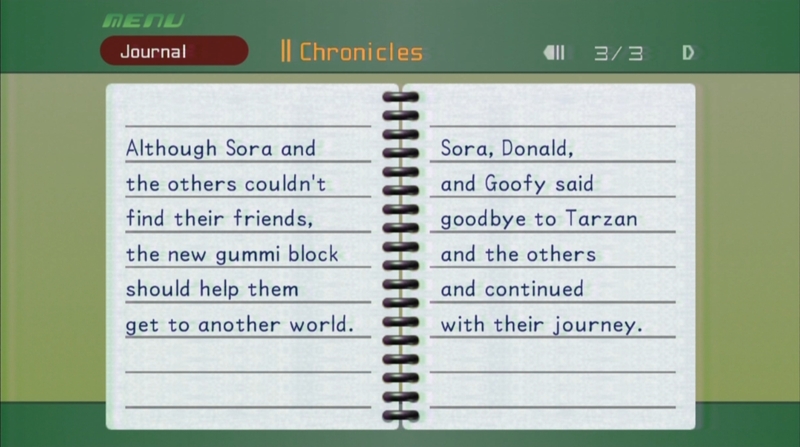 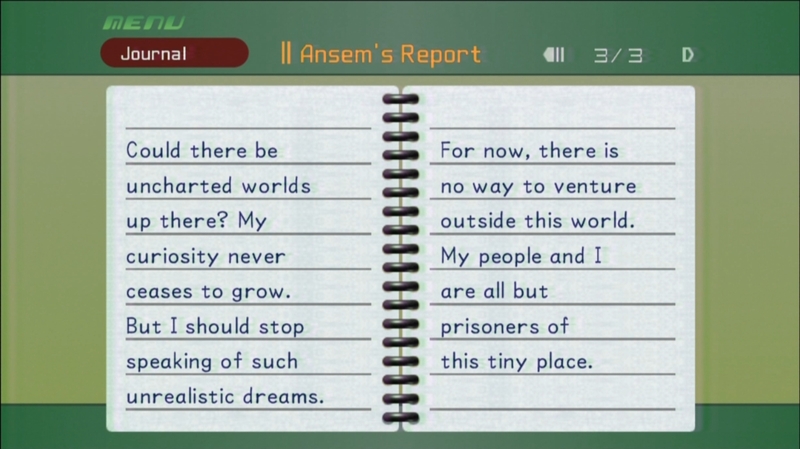 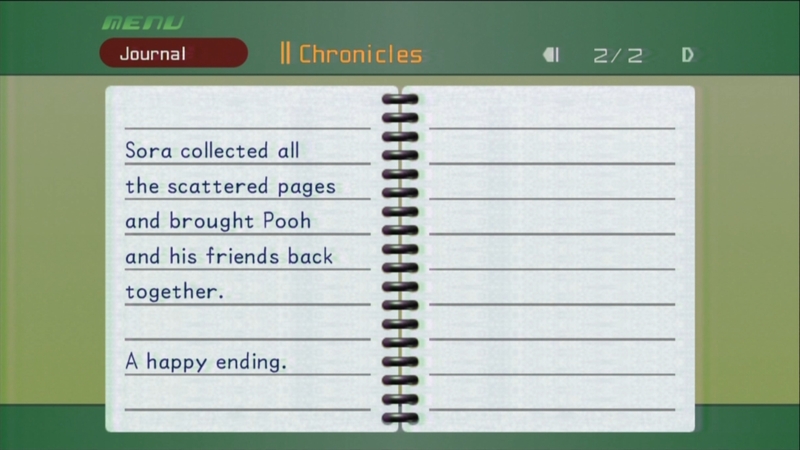 Sora's best friend since like forever. 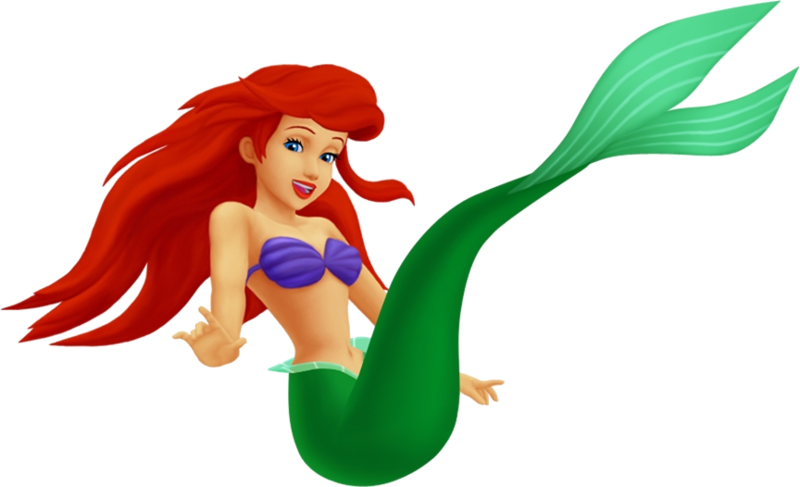 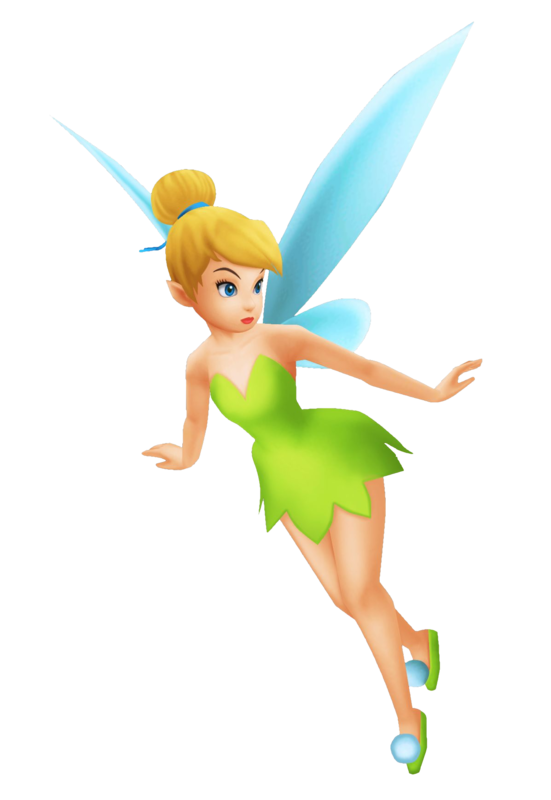 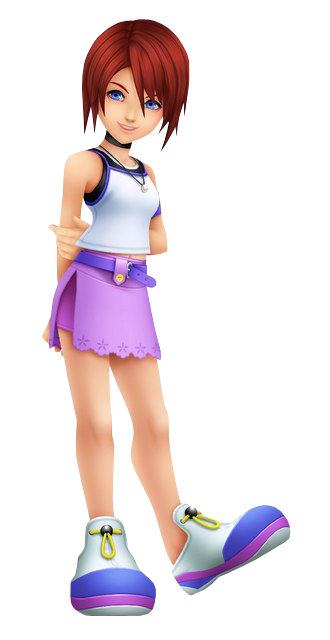 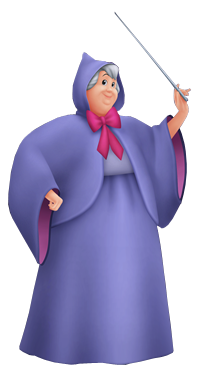 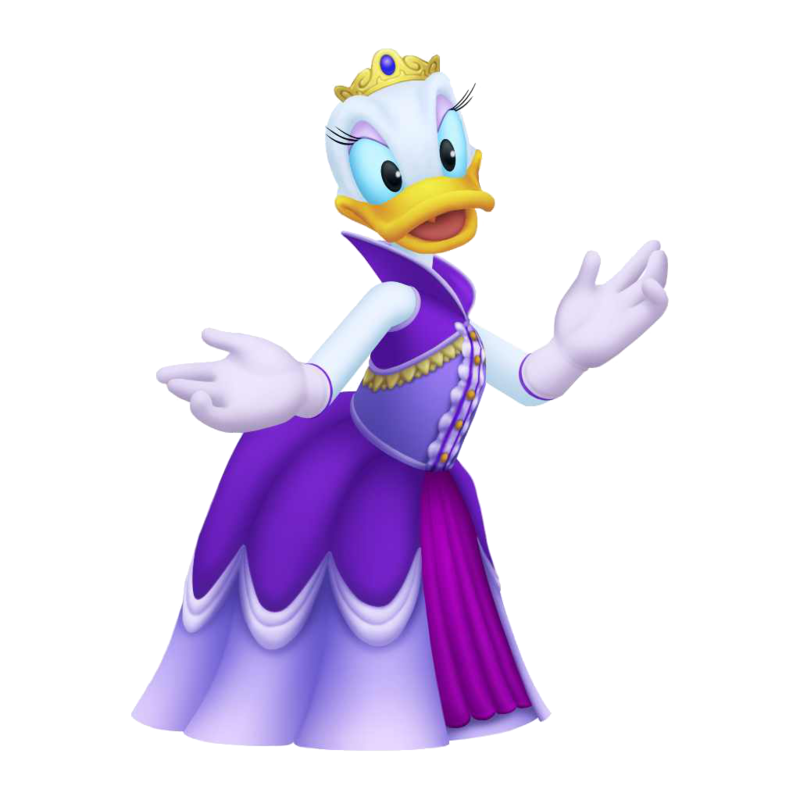 The girl next door that Sora and Riku hang out with all the time. 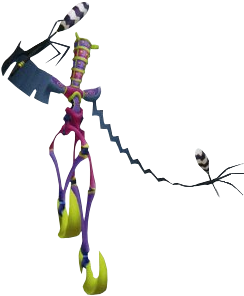 Enchanted brooms with a life of their own. 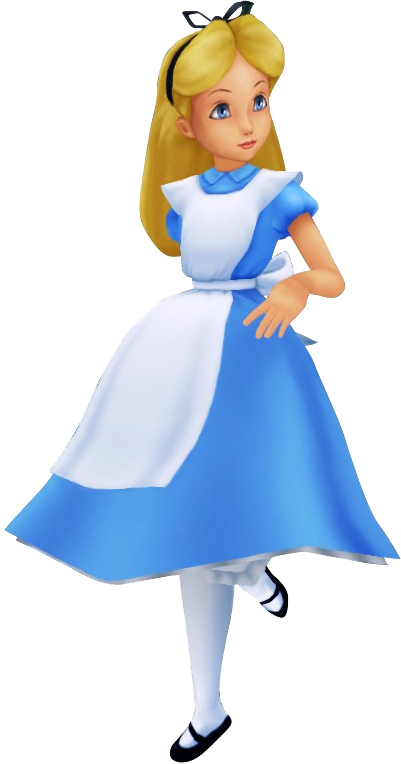 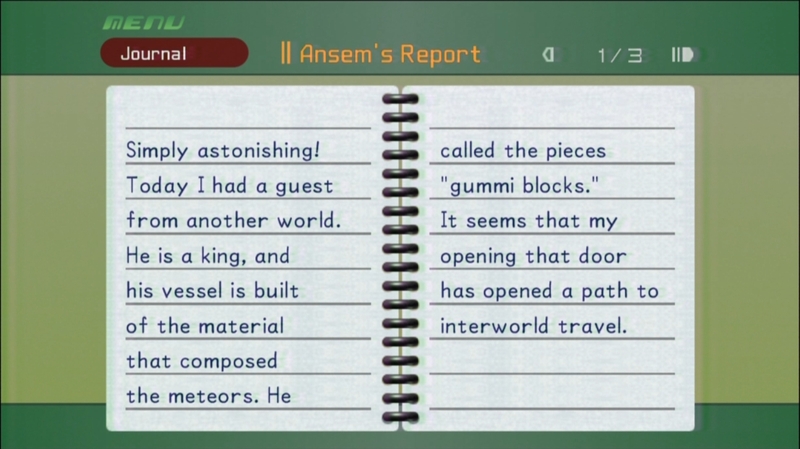 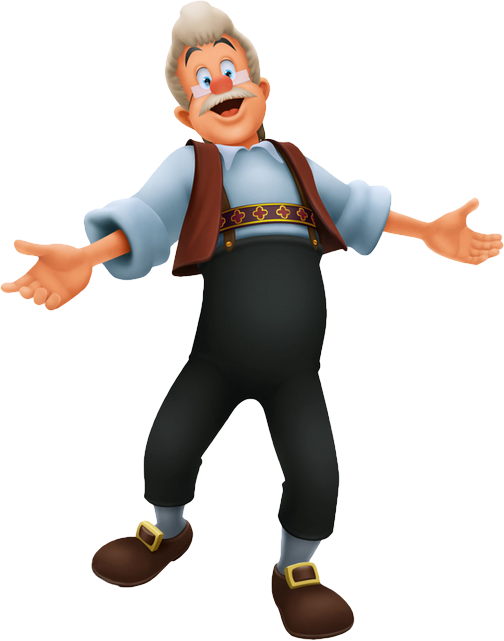 They tidy up, maintain the gummi ship, do house repairs, wait on others and just about any other useful tasks. 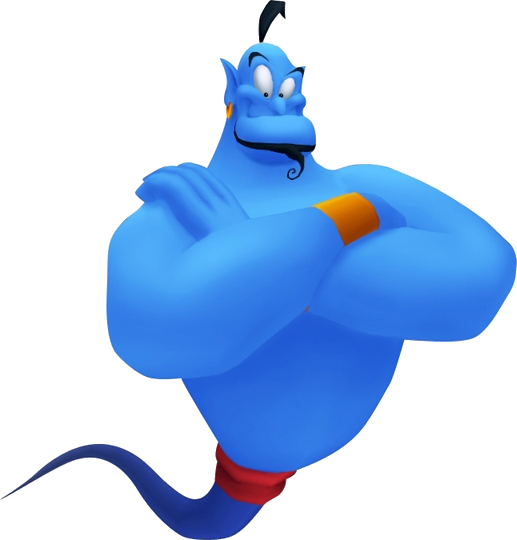 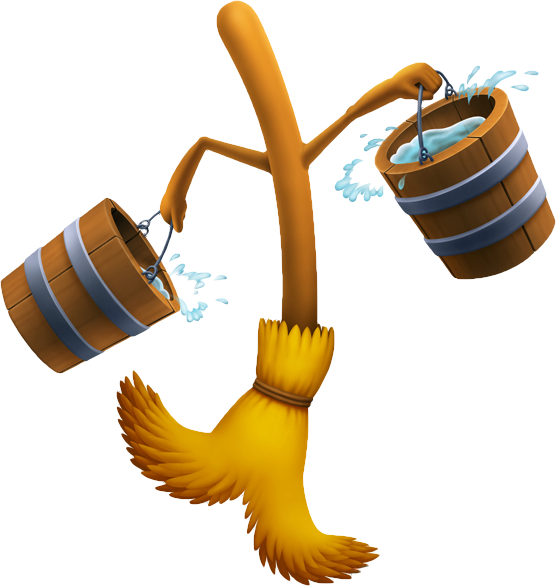 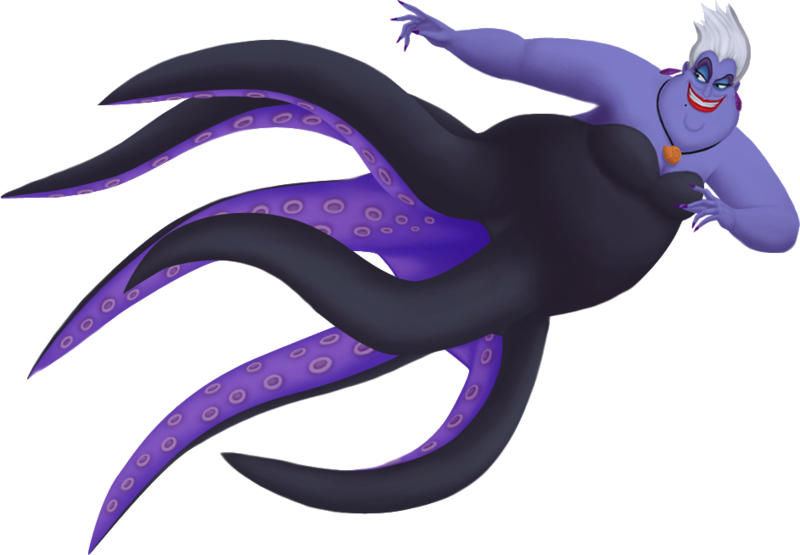 They swept onto the screen in "Fantasia" (1940). 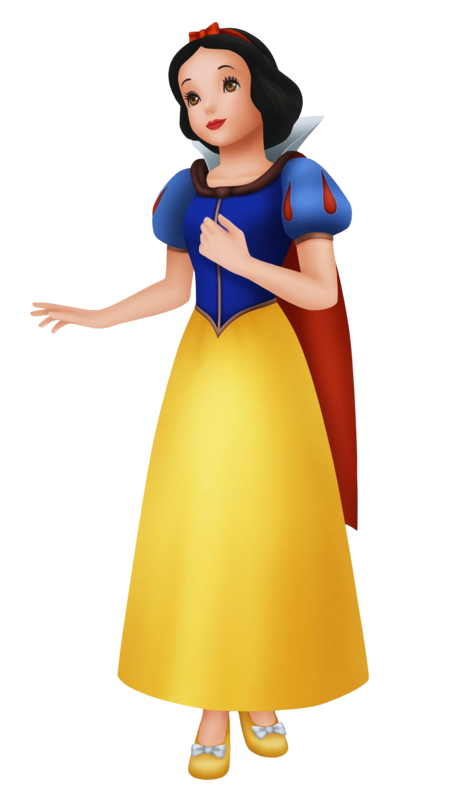 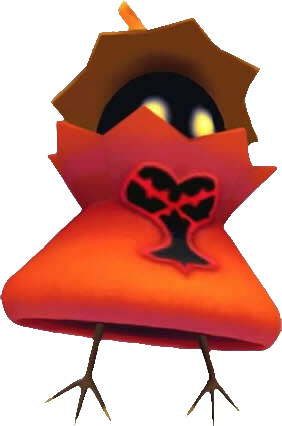 Loyal servant to the Queen of Hearts. 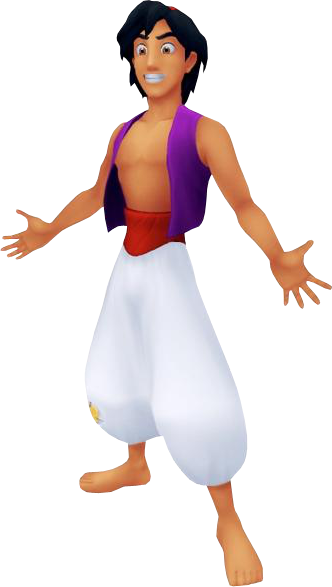 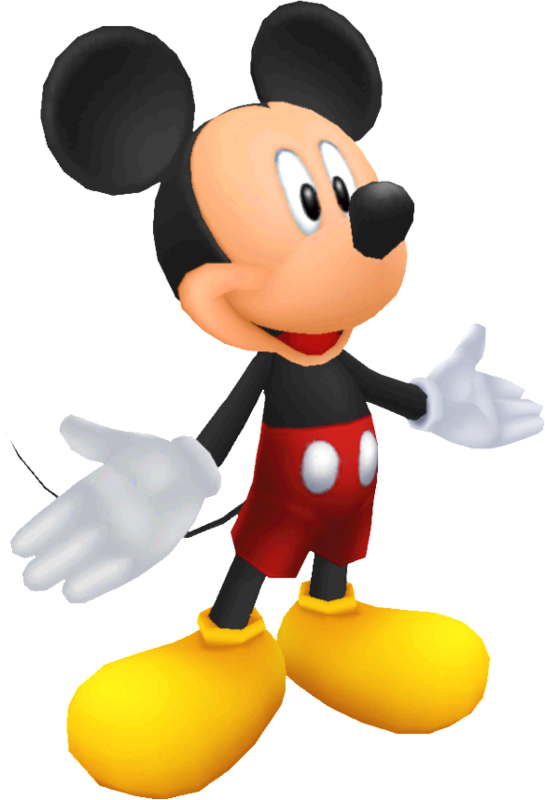 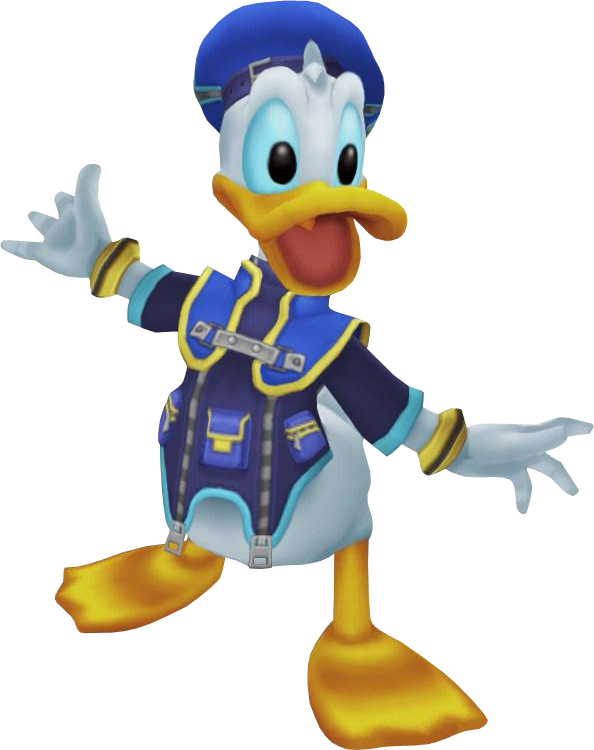 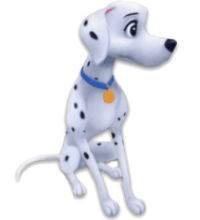 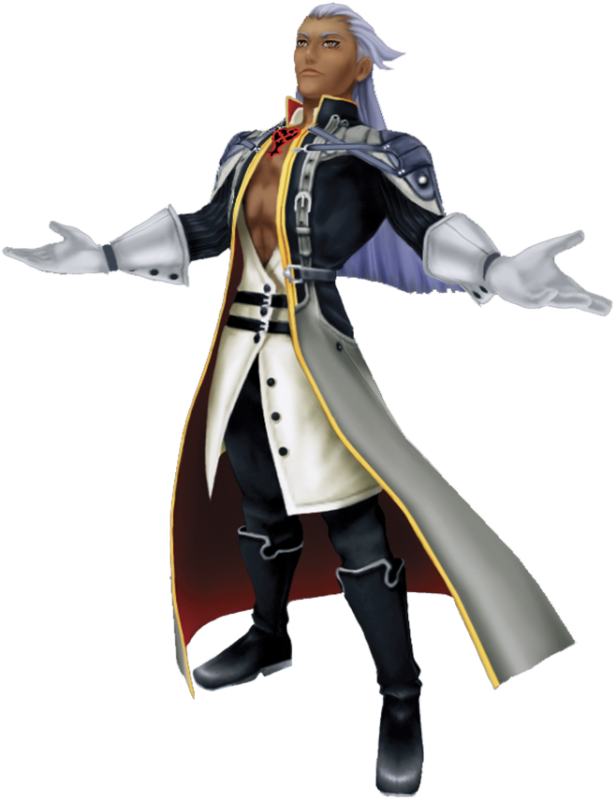 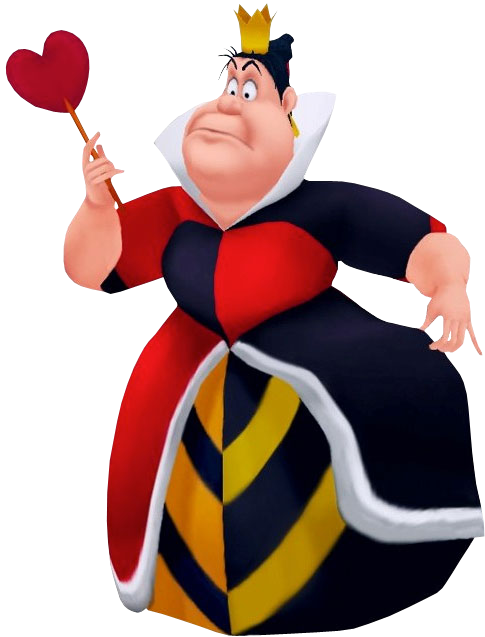 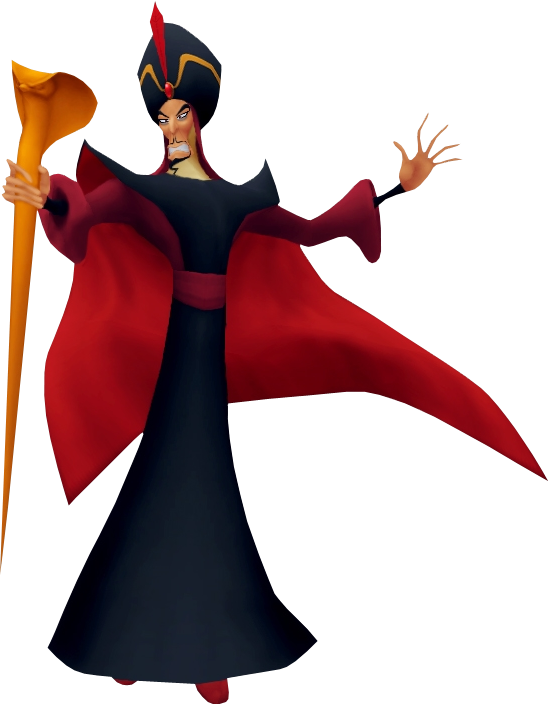 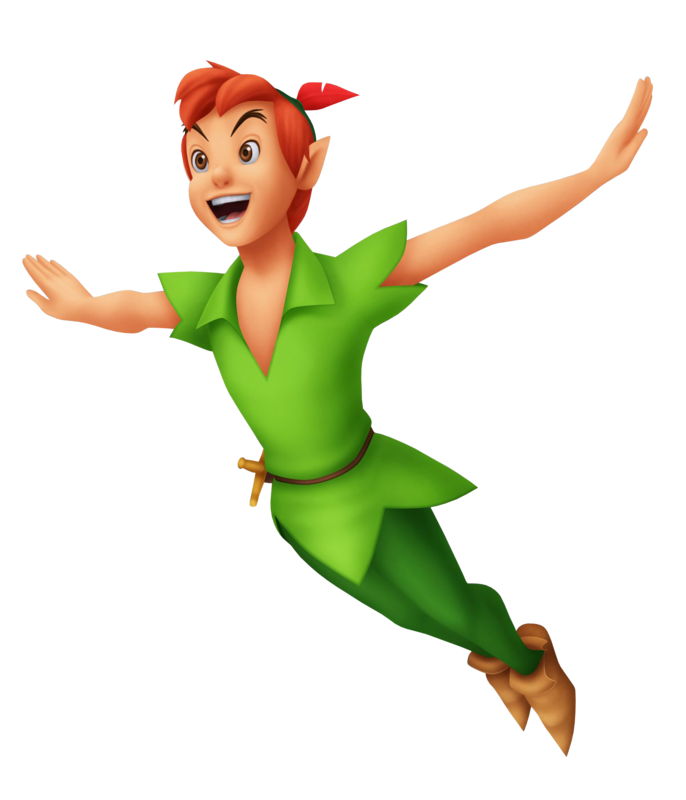 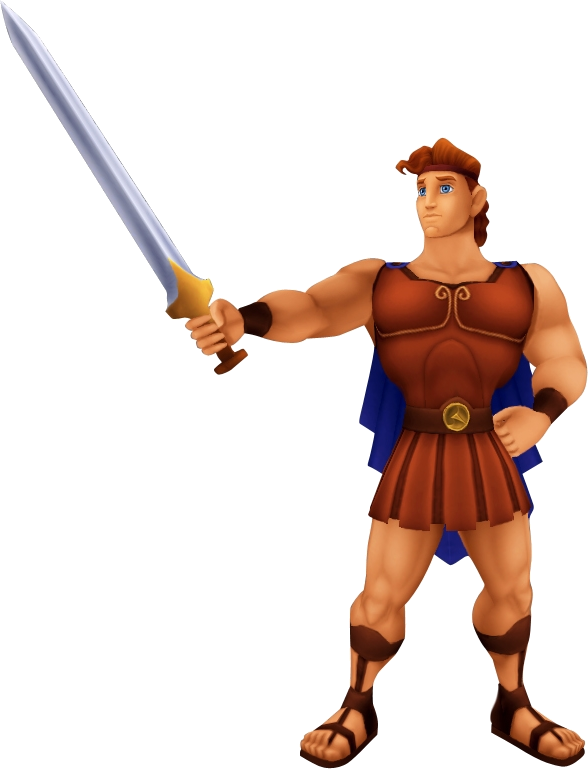 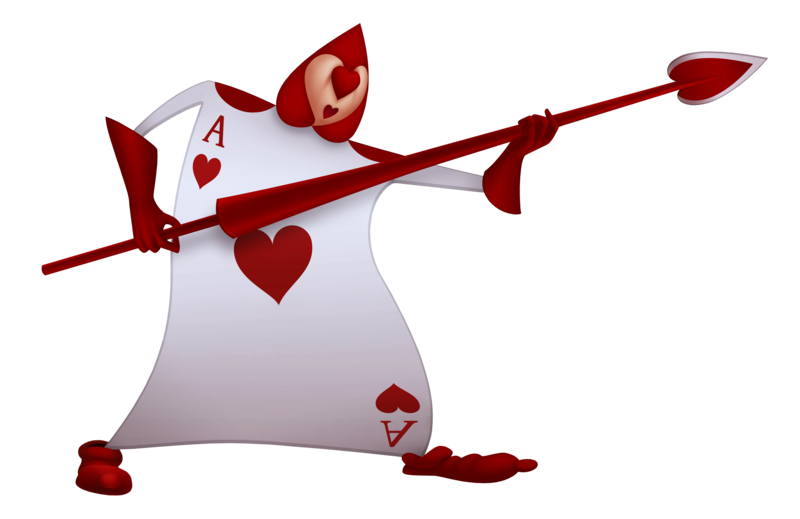 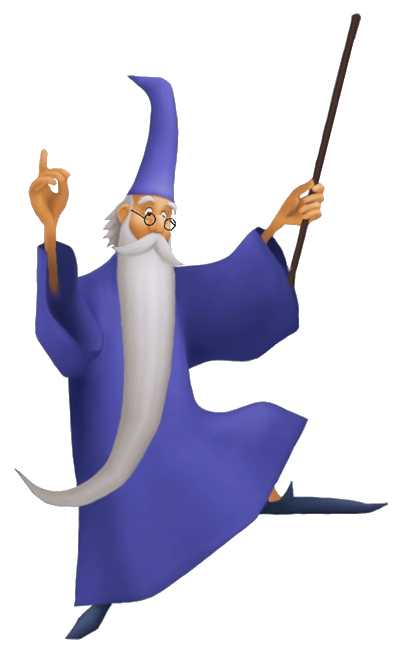 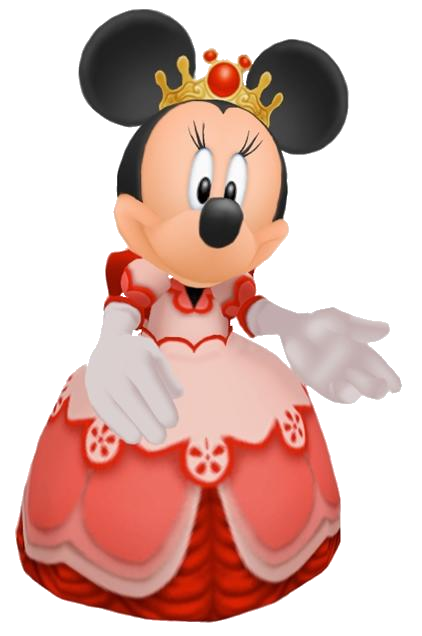 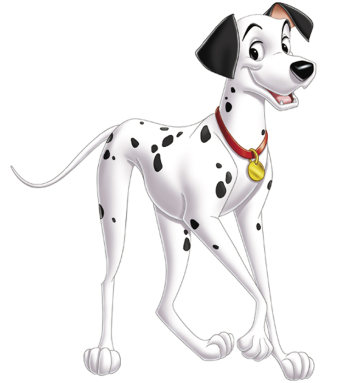 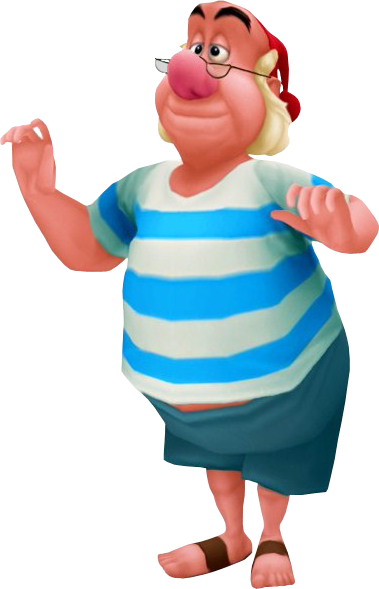 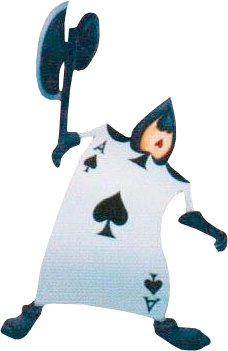 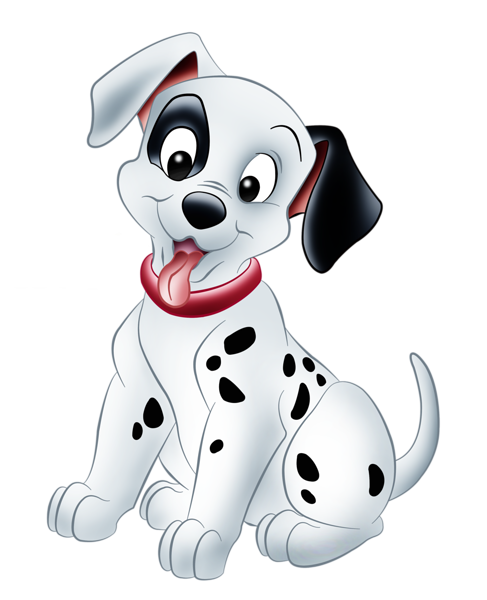 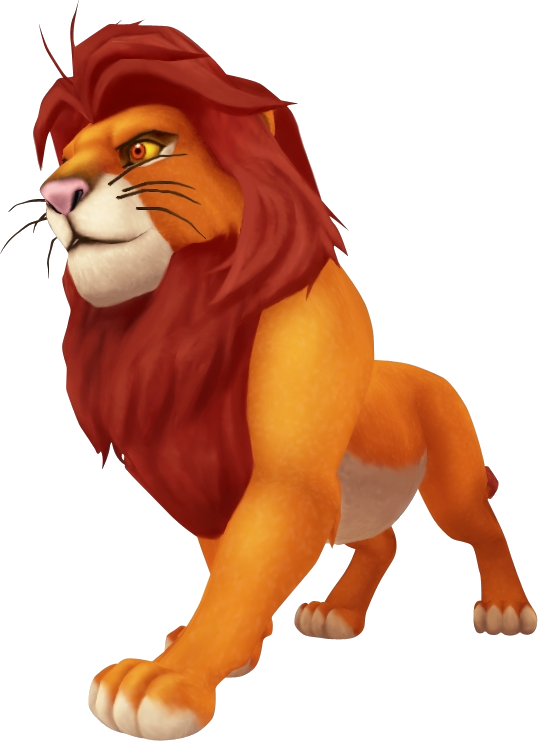 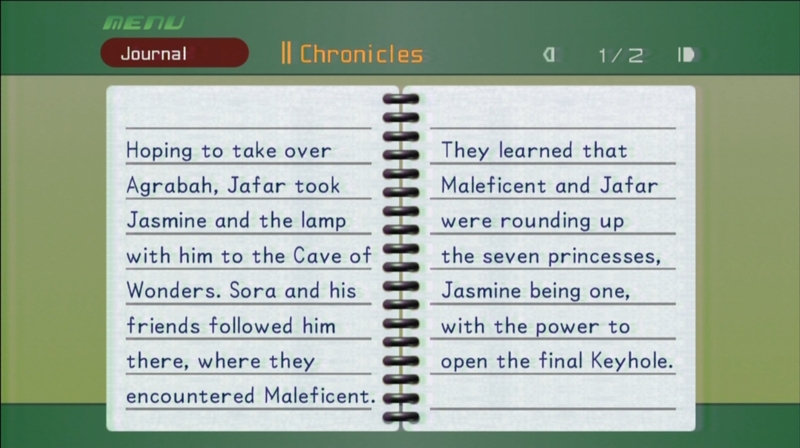 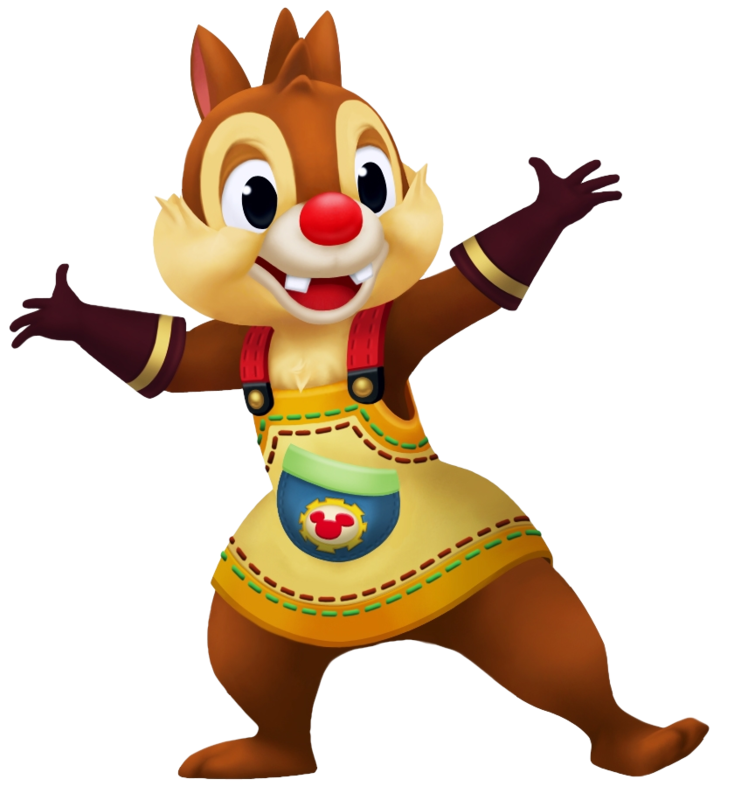 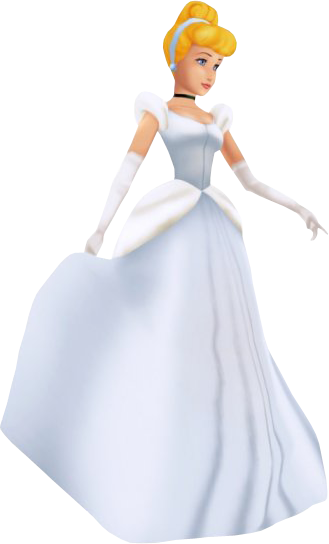 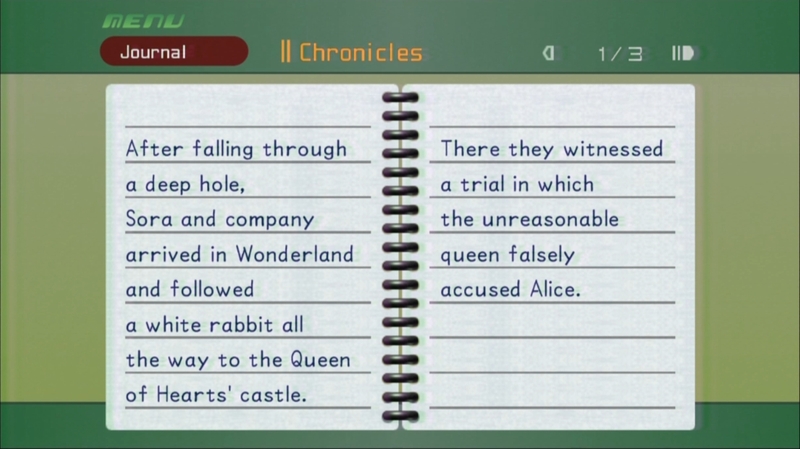 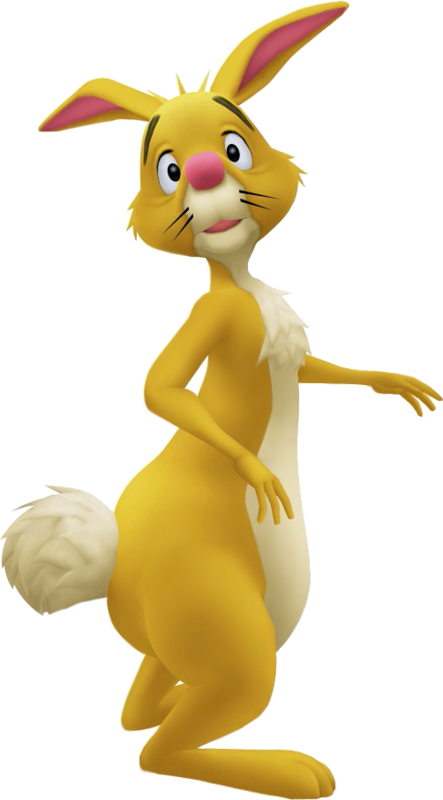 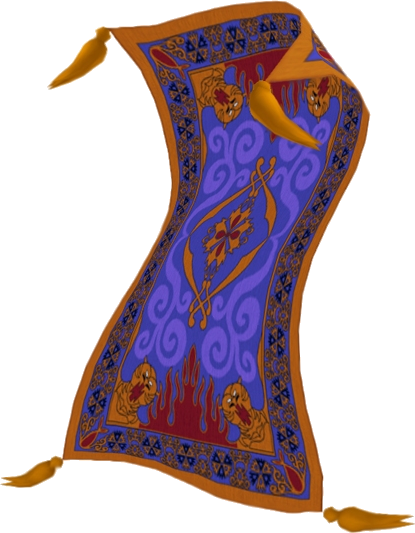 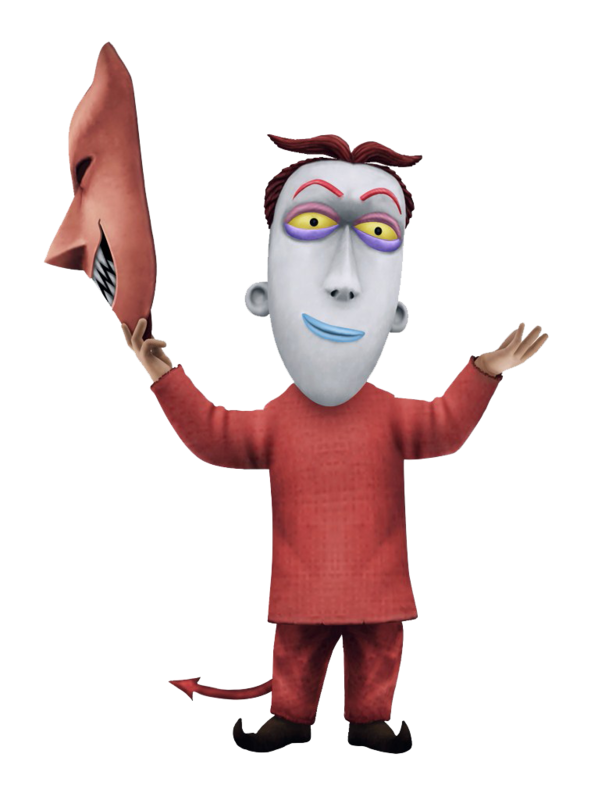 He led Sora and his friends to the Queen of Hearts' castle. 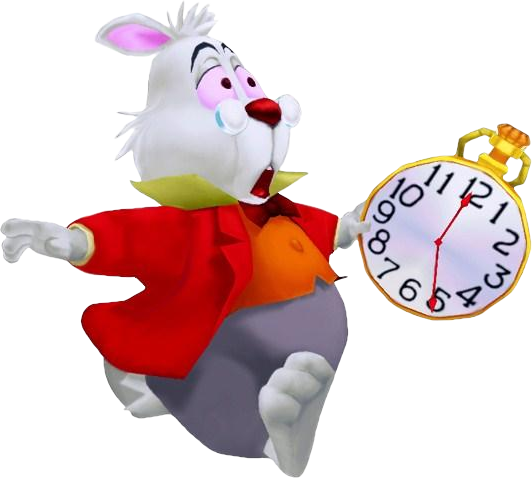 He wasn't late for appearance in "Alice in Wonderland" (1951). 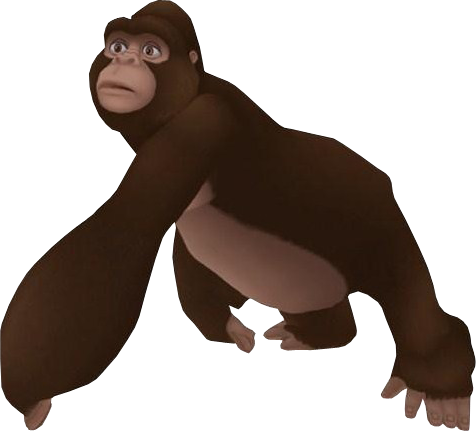 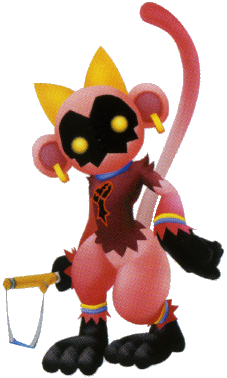 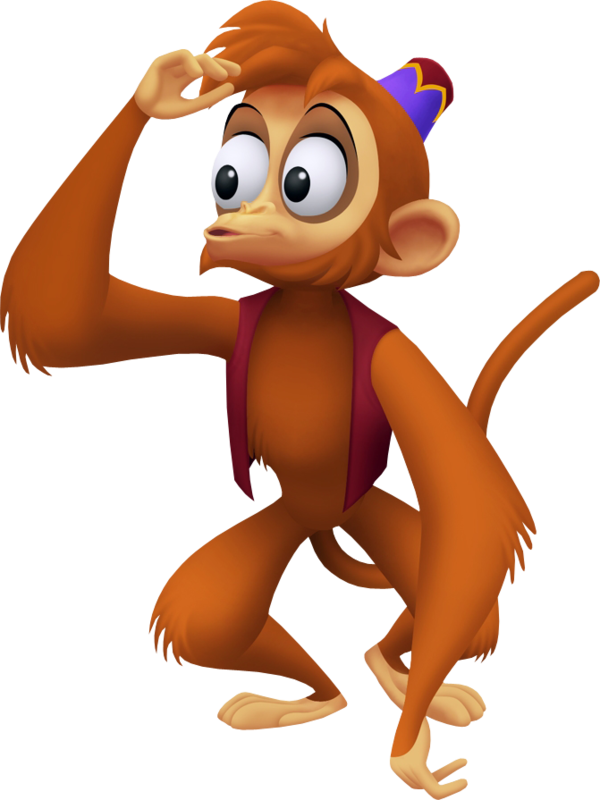 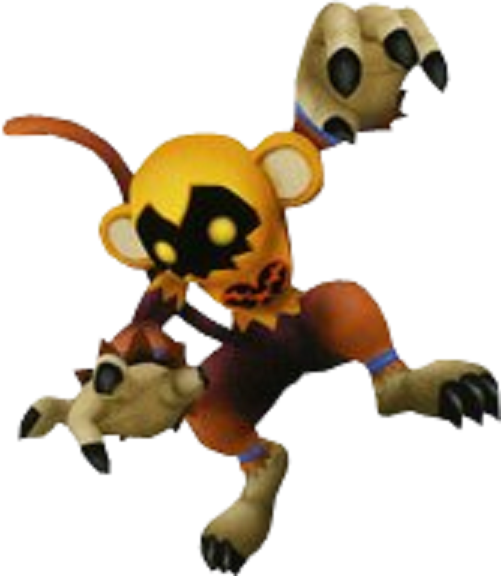 A Heartless resembling a monkey. 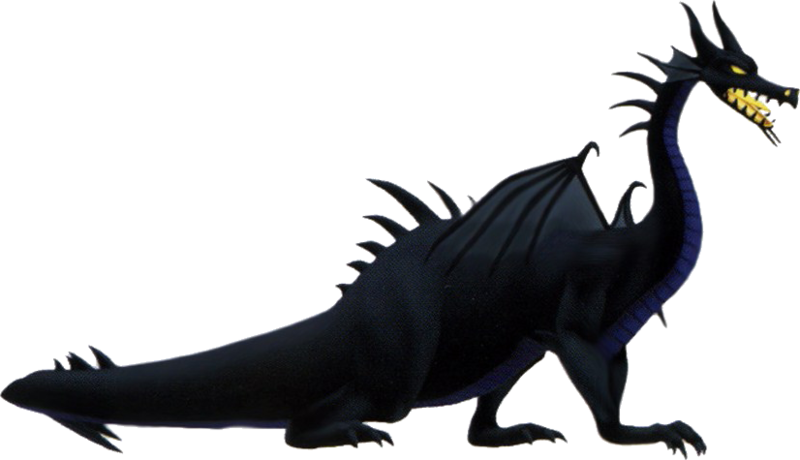 It roams as it pleases, rarely paying attention to its surroundings. 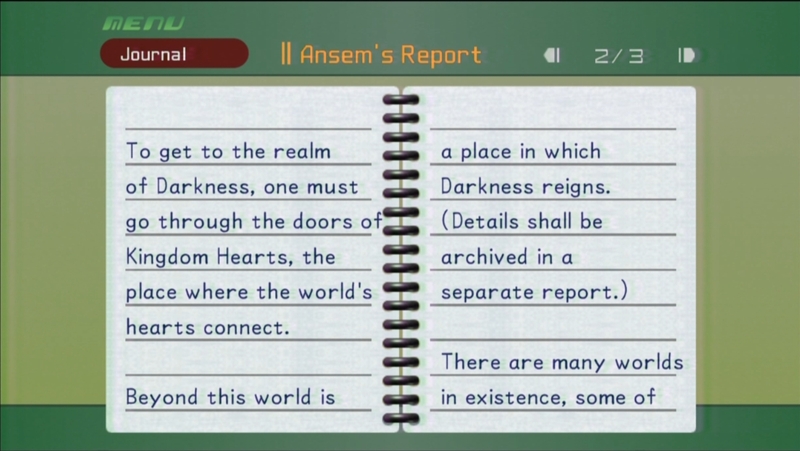 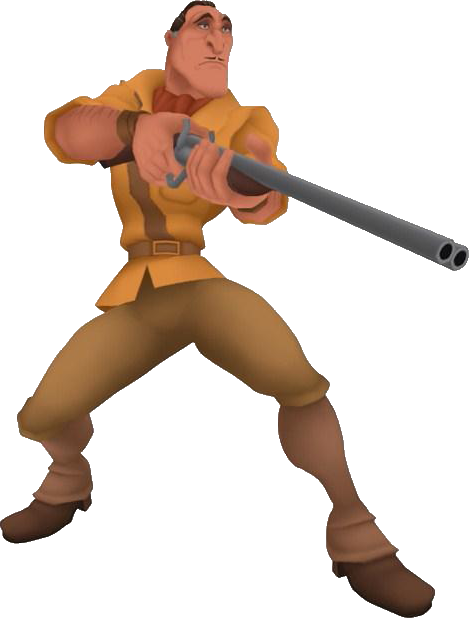 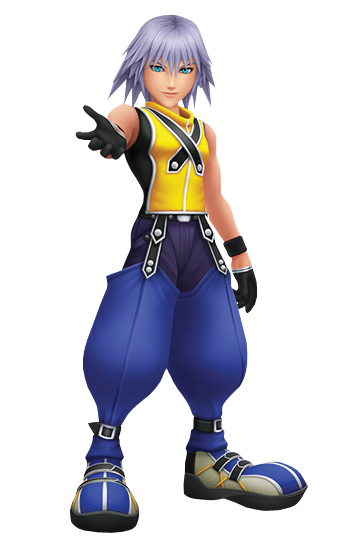 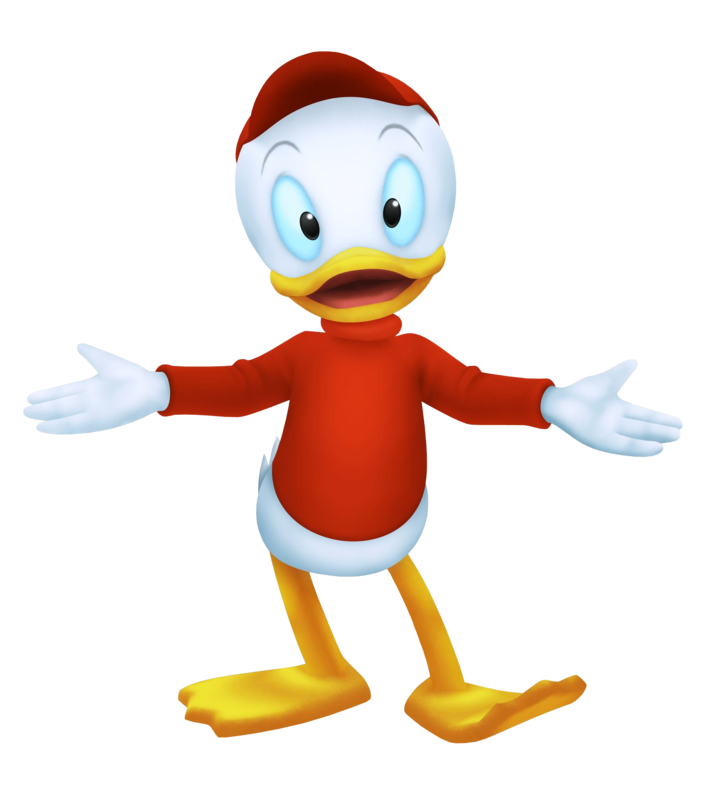 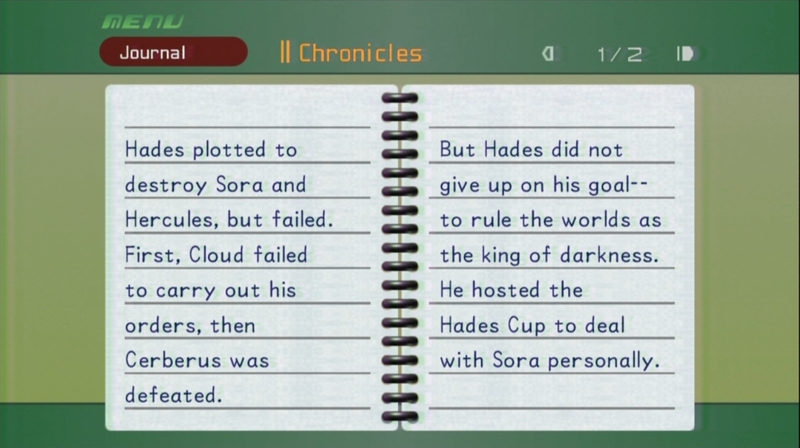 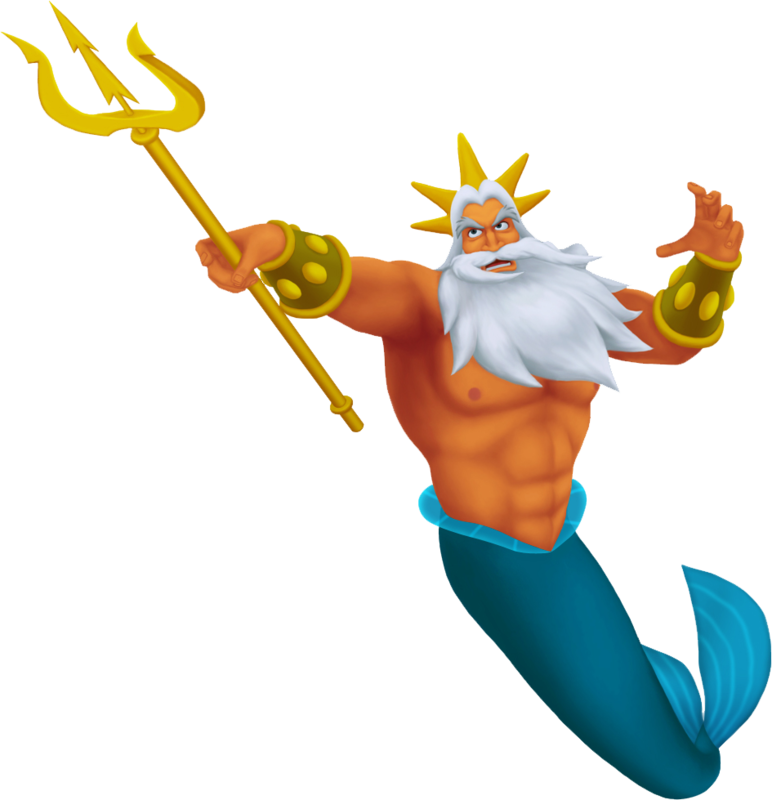 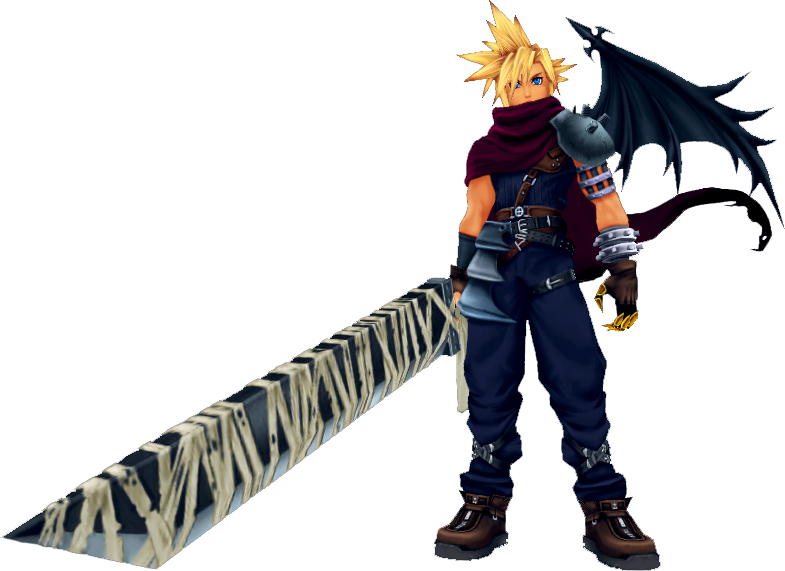 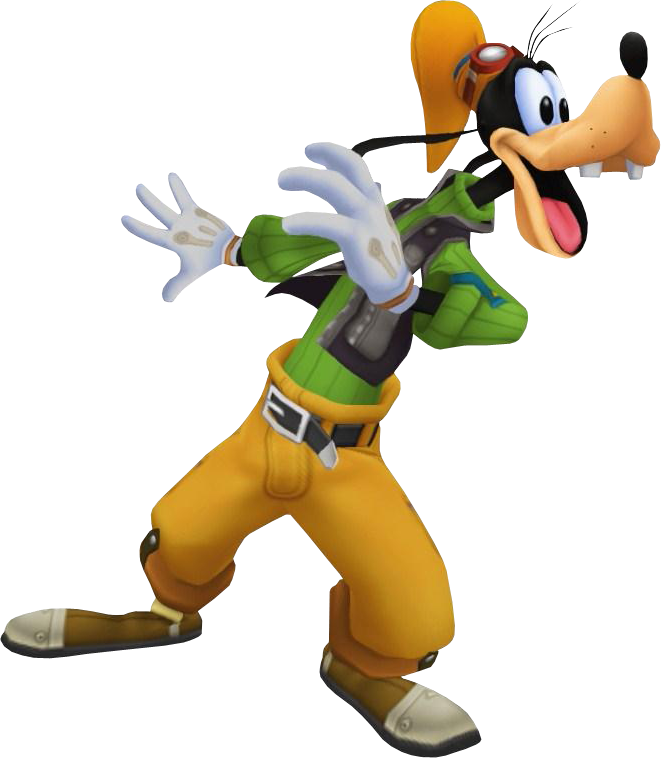 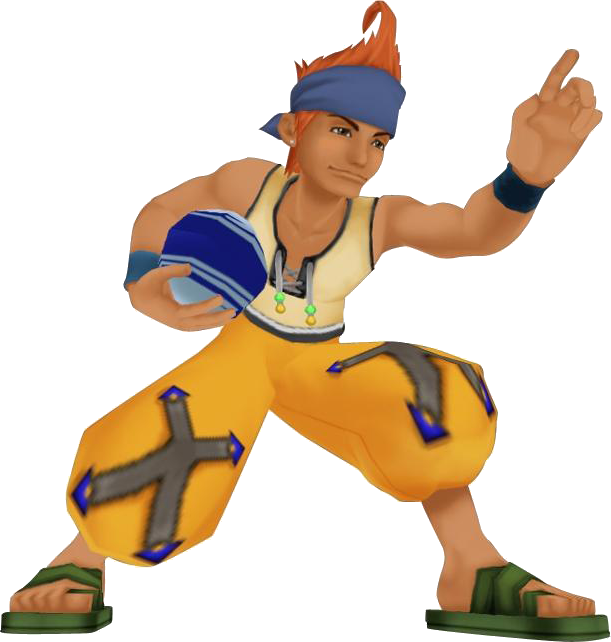 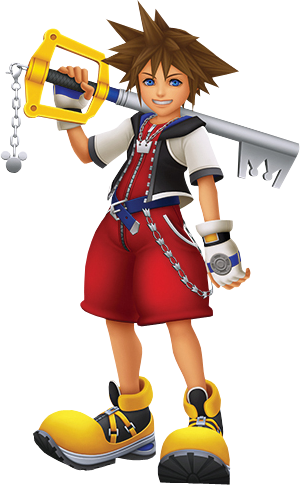 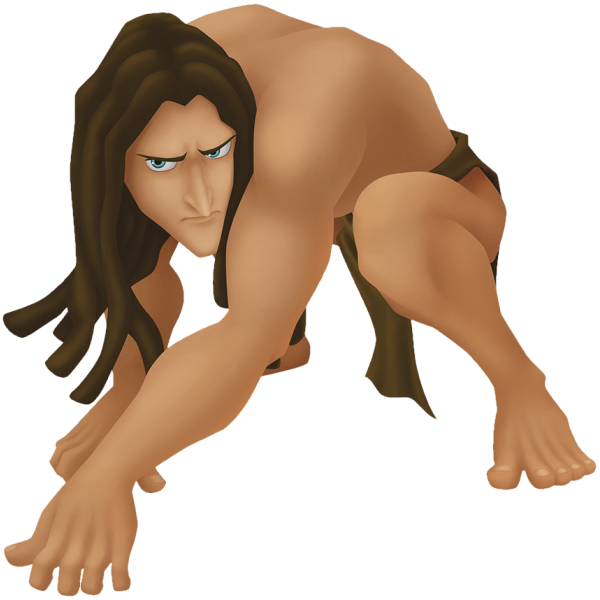 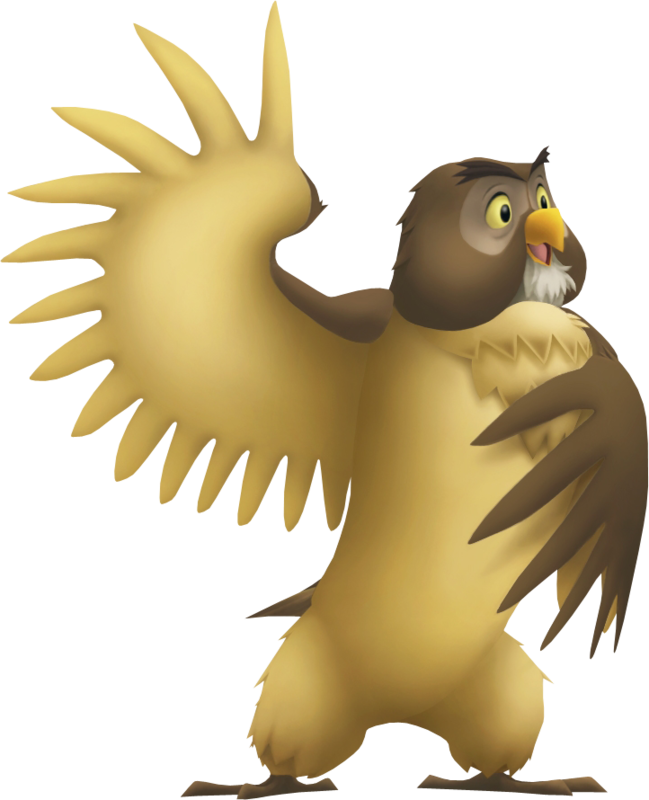 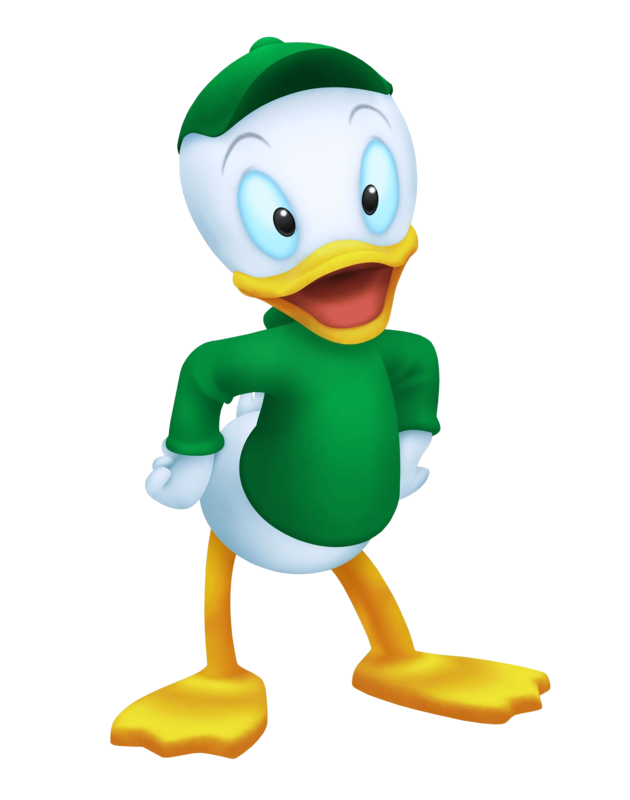 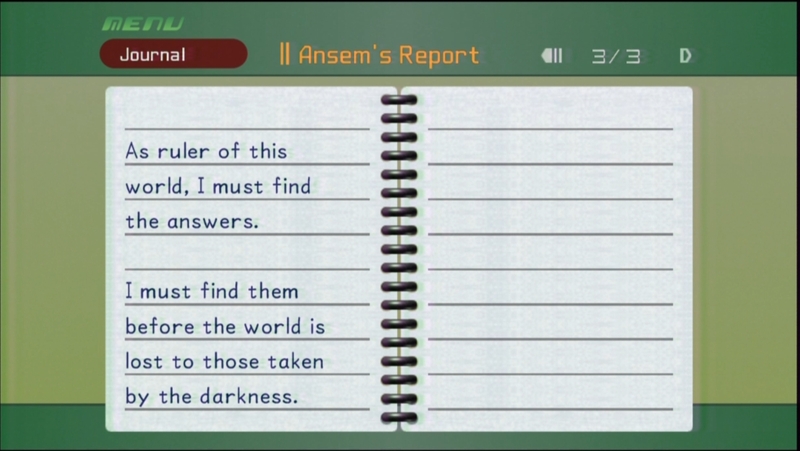 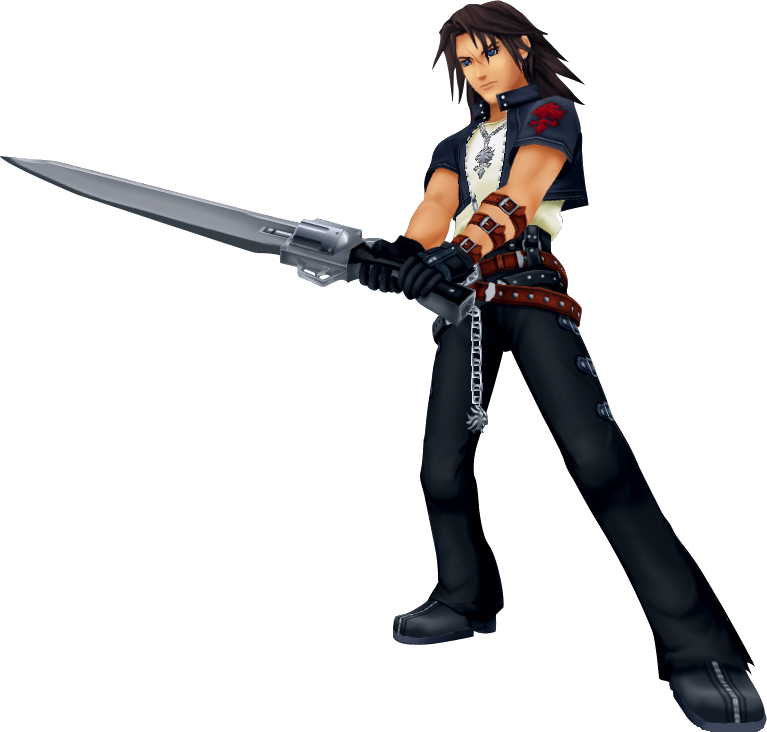 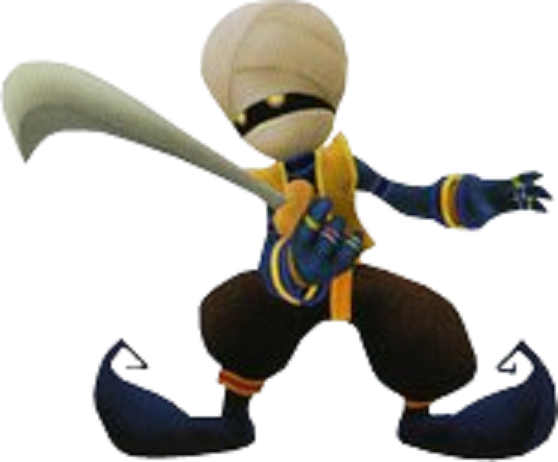 If Sora is spotted, it will call forth numerous allies, all armed with slingshots. 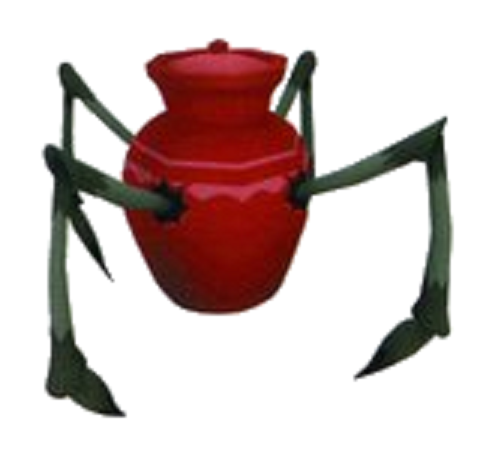 Item drops start at the sixth sniperwild killed. 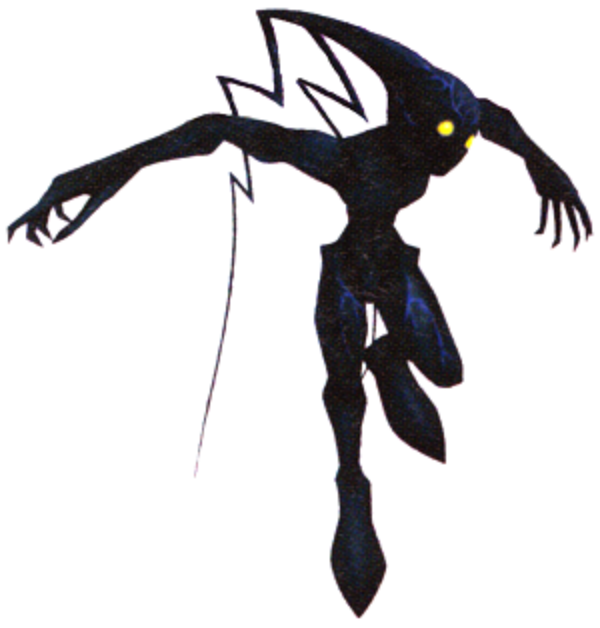 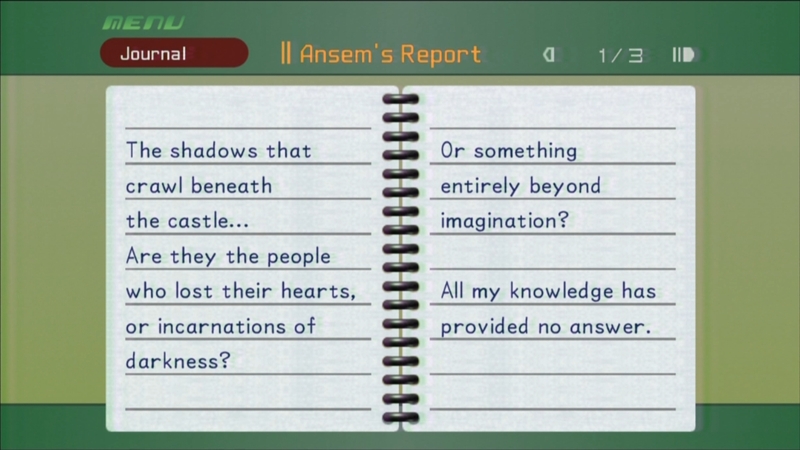 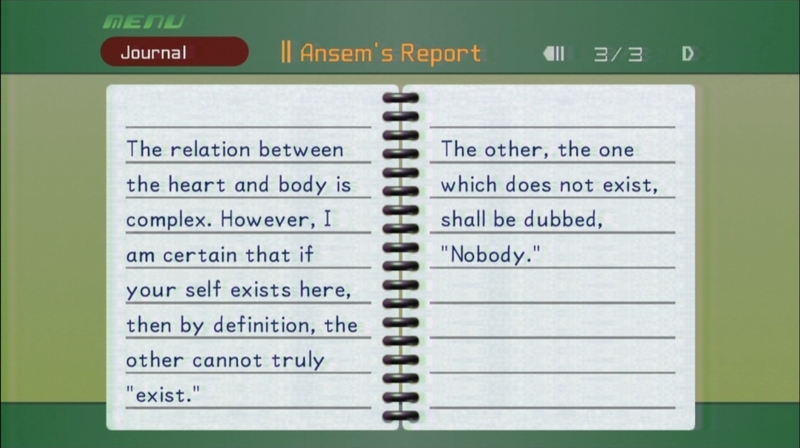 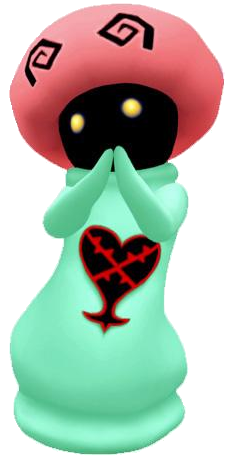 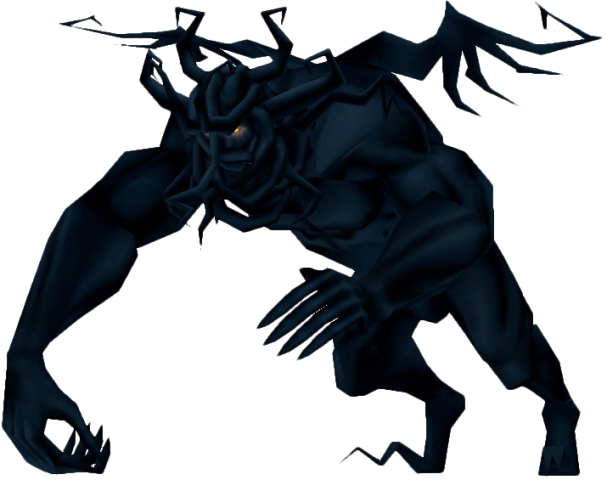 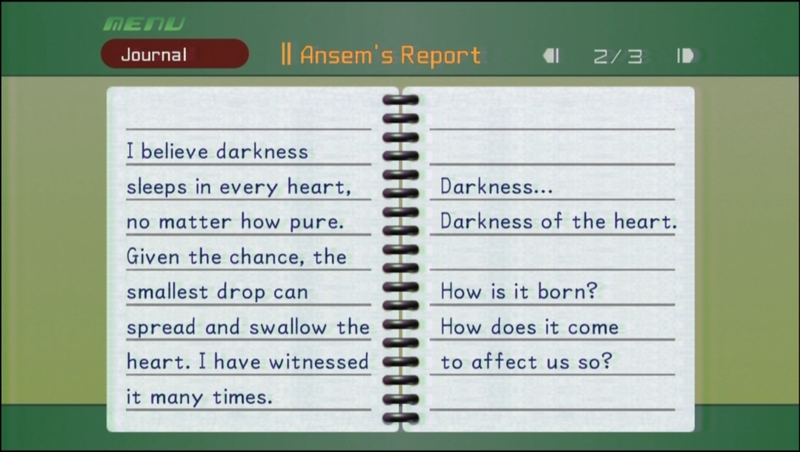 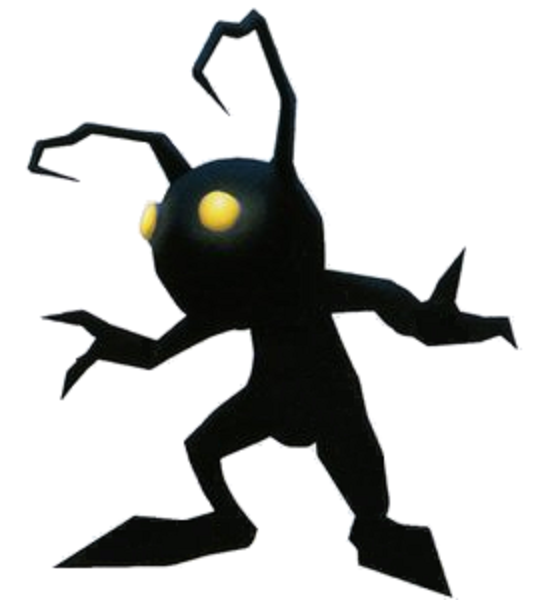 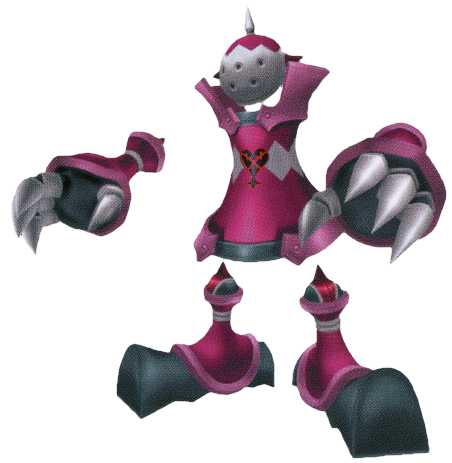 A large Heartless similar to a Shadow. 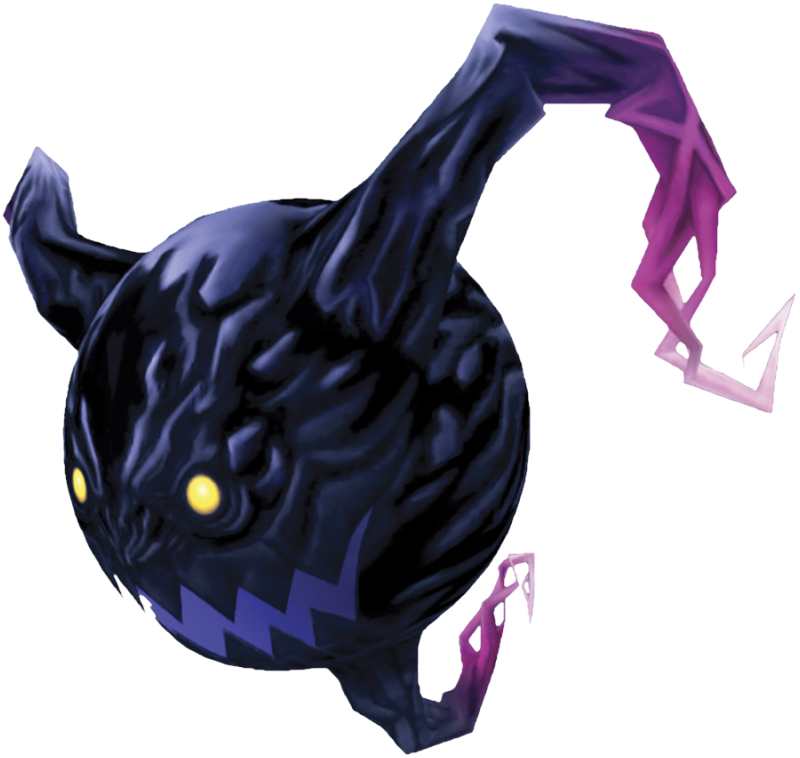 Like its predecessor, it's quite persistent and will chase its target around. 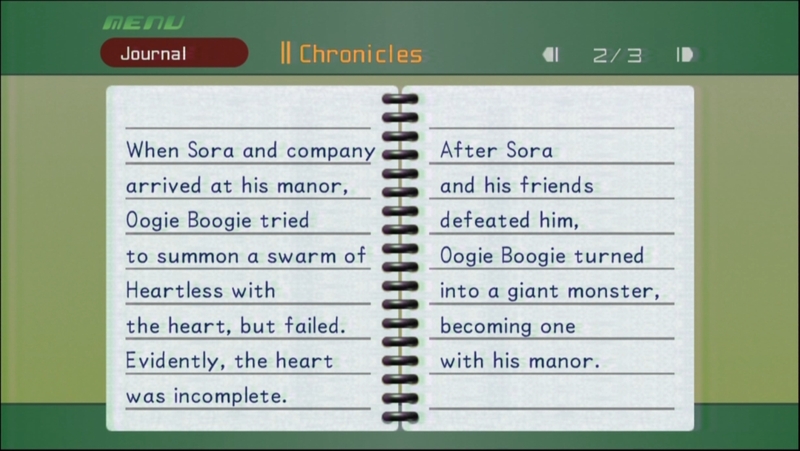 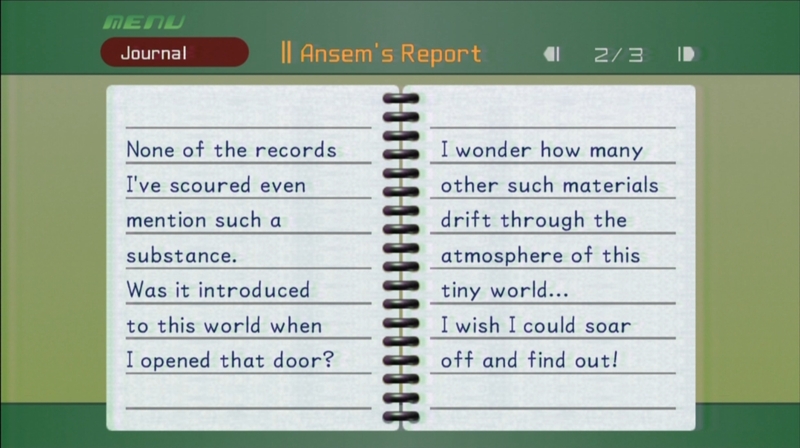 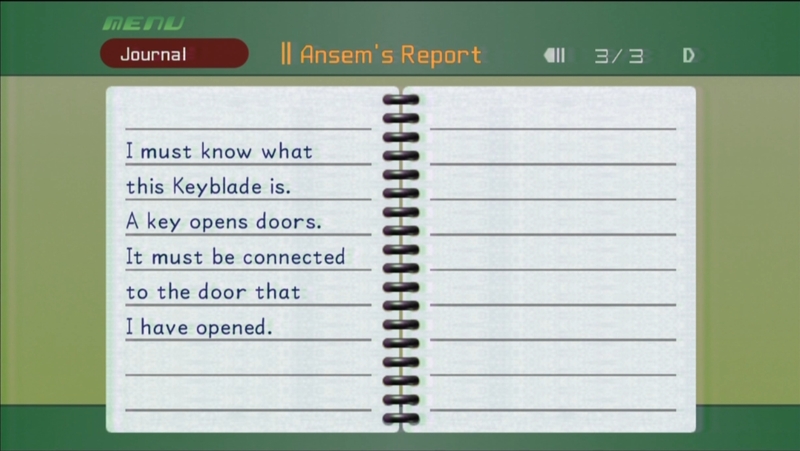 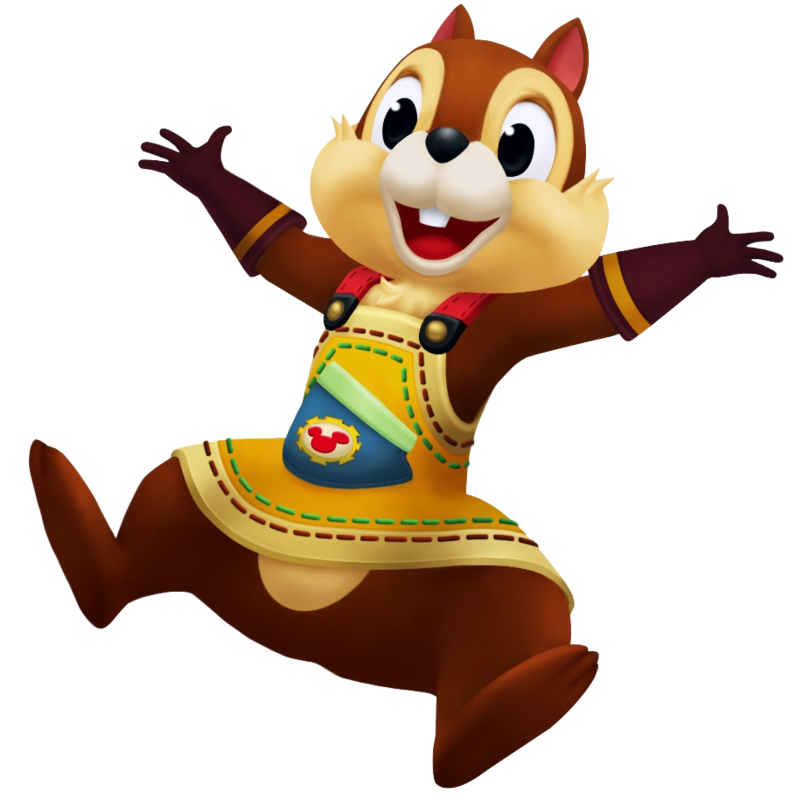 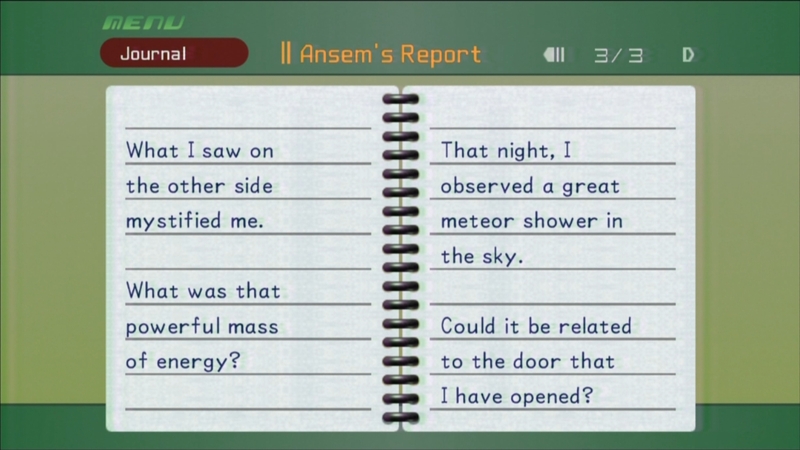 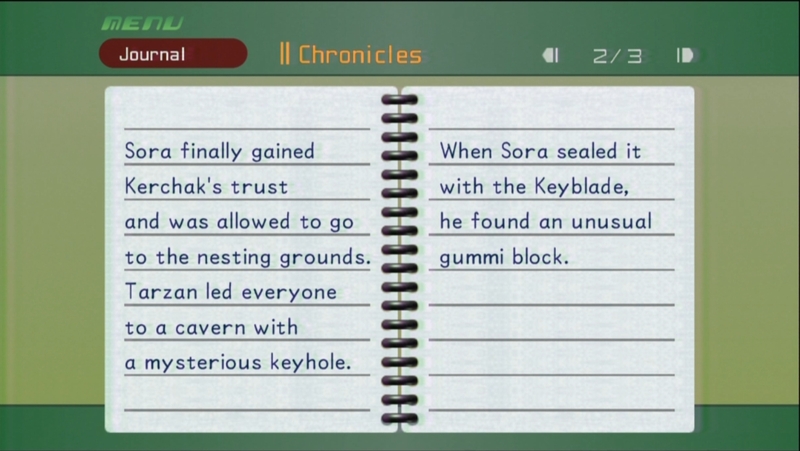 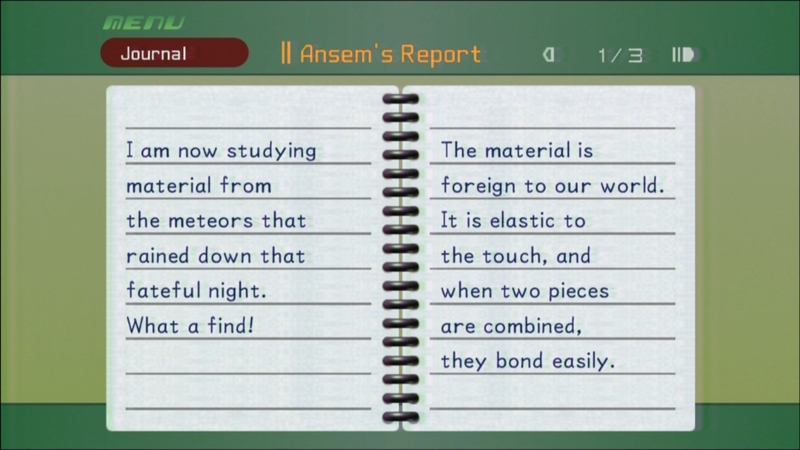 If it just does the littlest amount of damage to Sora, it will fade out of sheer happiness. 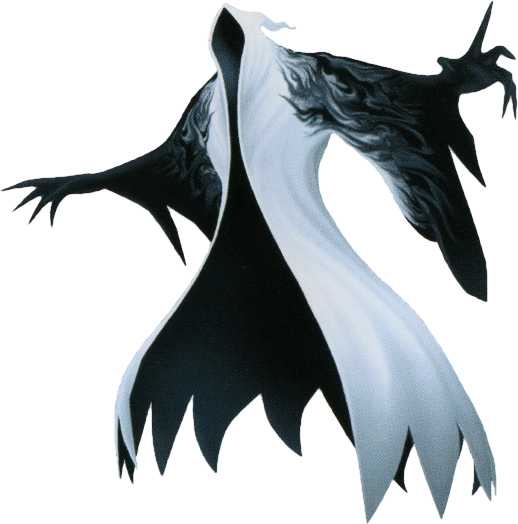 A colossal Heartless called forth by euphoric White Mushrooms. 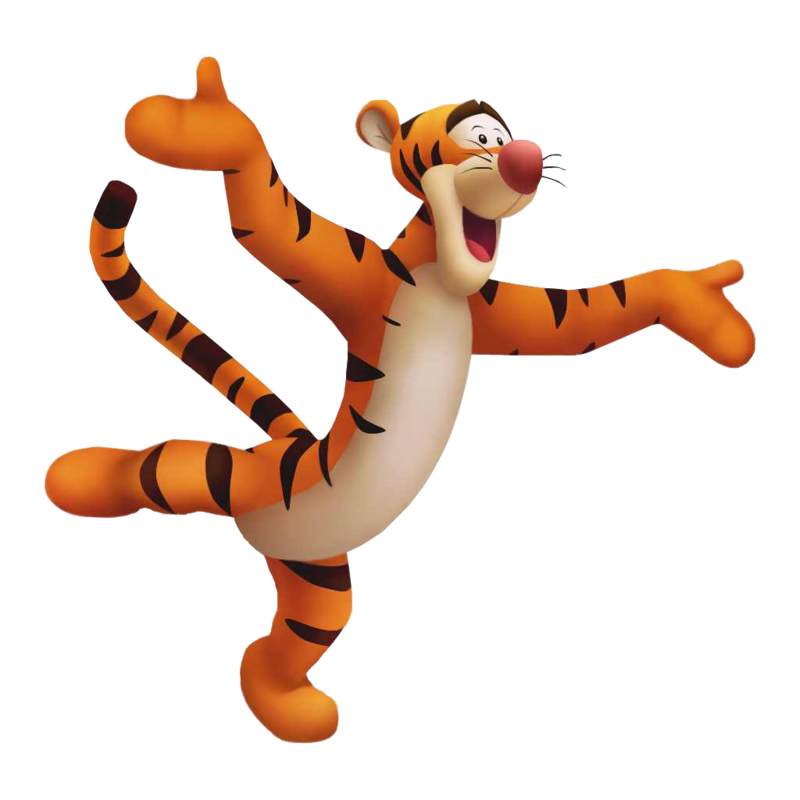 A dancer by nature, once it starts dancing, it can't stop. 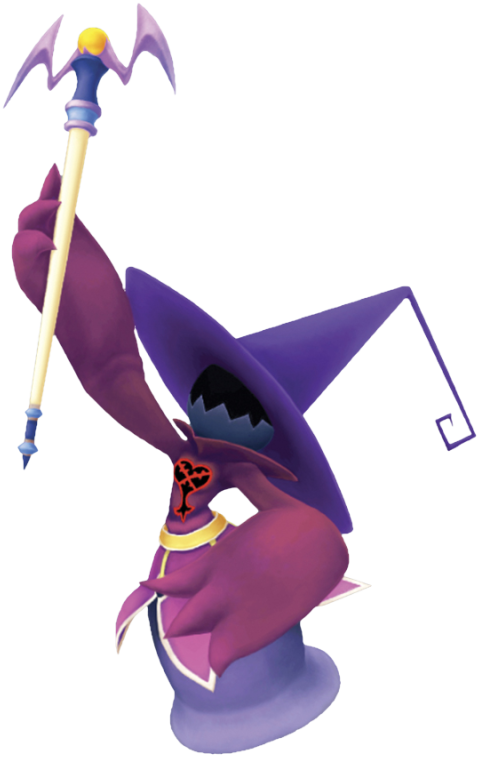 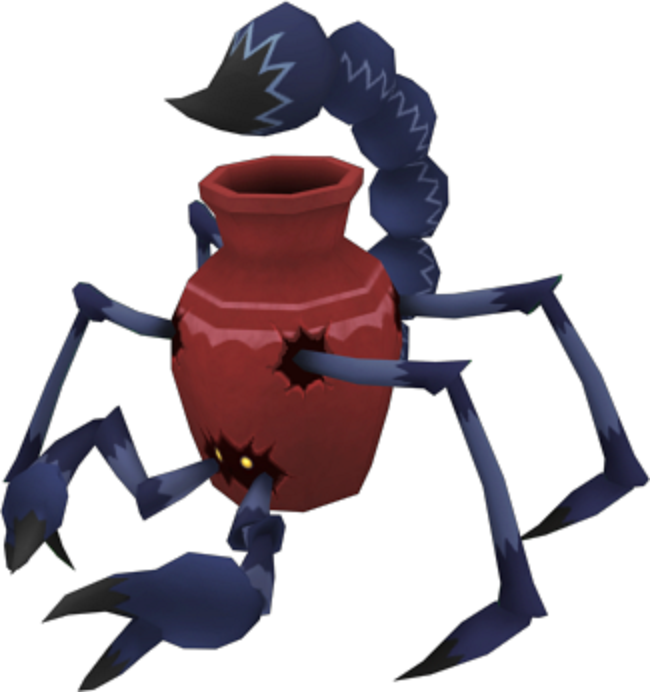 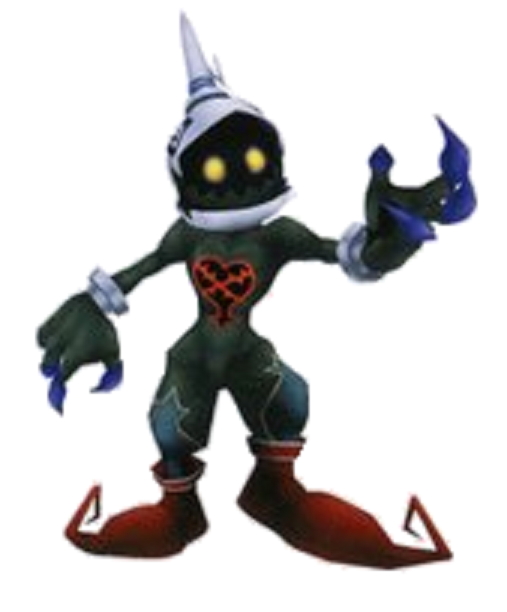 An ordinary pot turned Heartless by the power of Darkness. 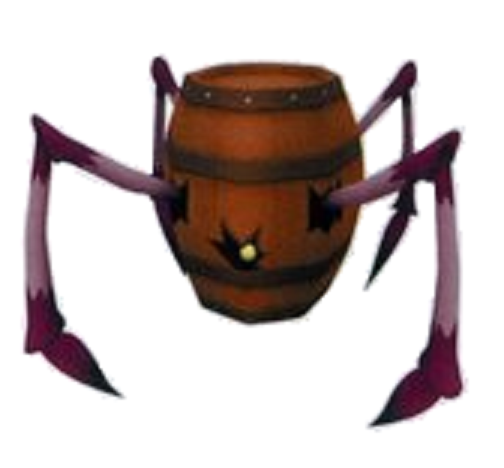 Unlike the Pot Spider, its pot is tough as nails. 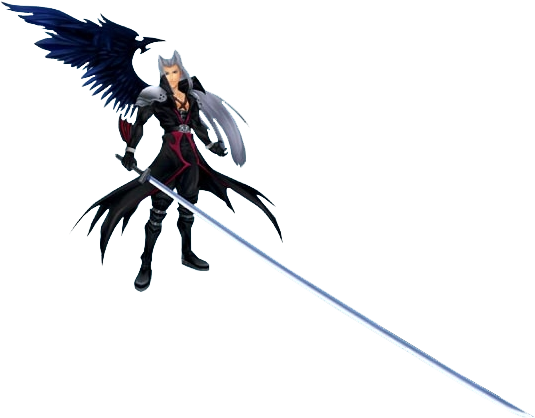 A simple attack won't be enough to make it cry for mercy. 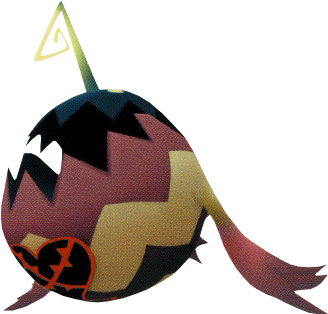 It emanates poisonous fumes as it attacks its prey. 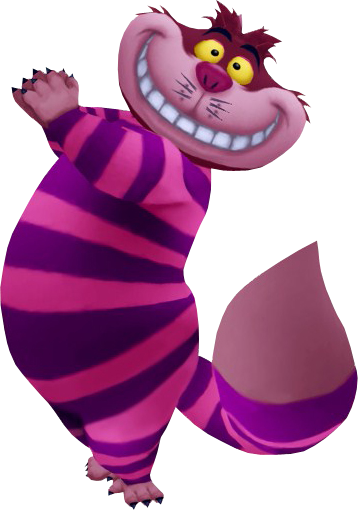 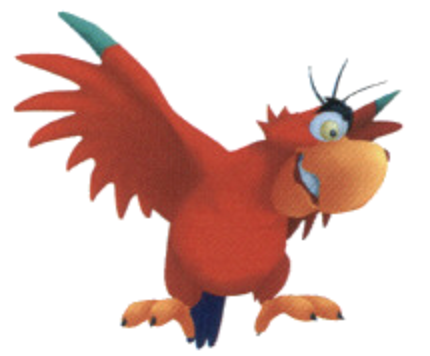 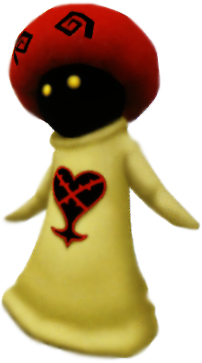 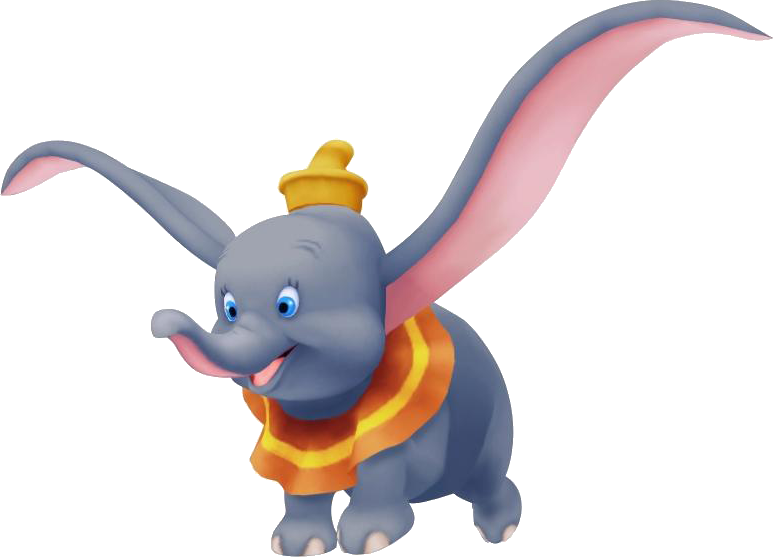 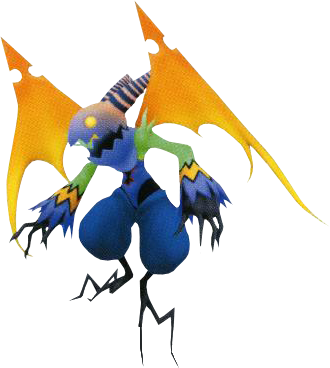 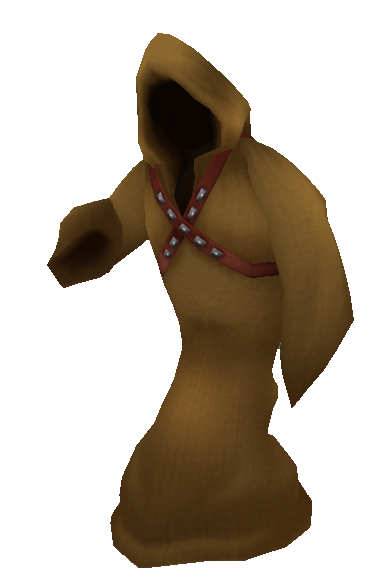 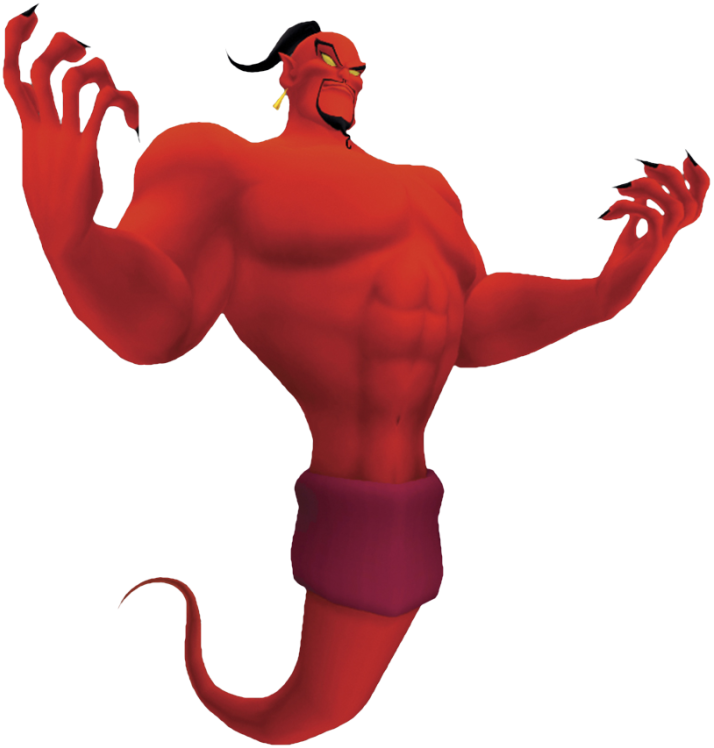 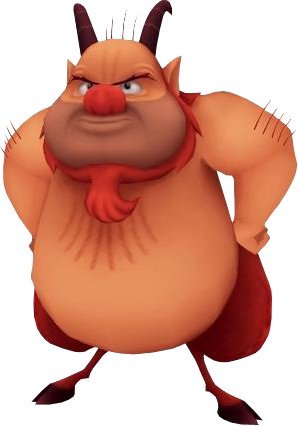 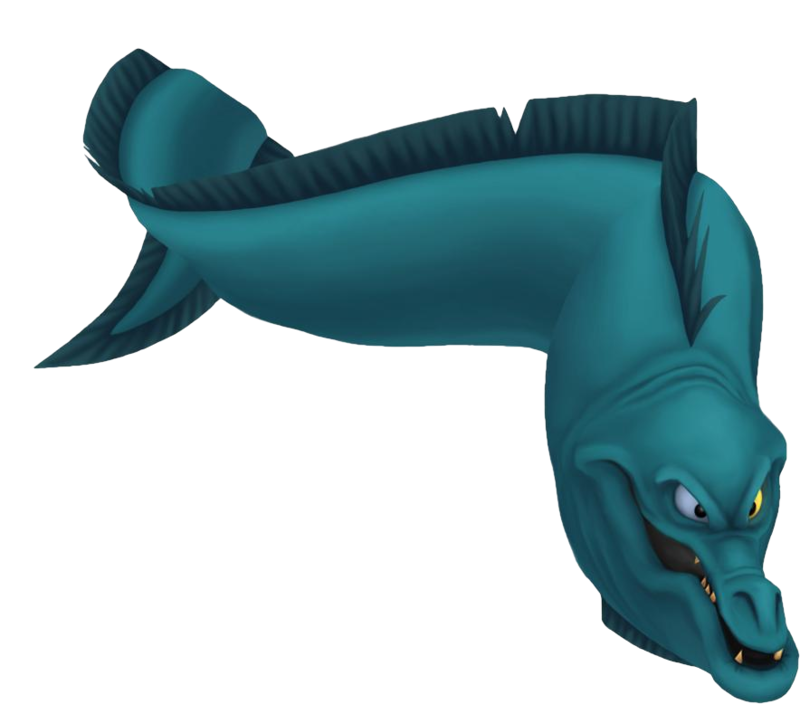 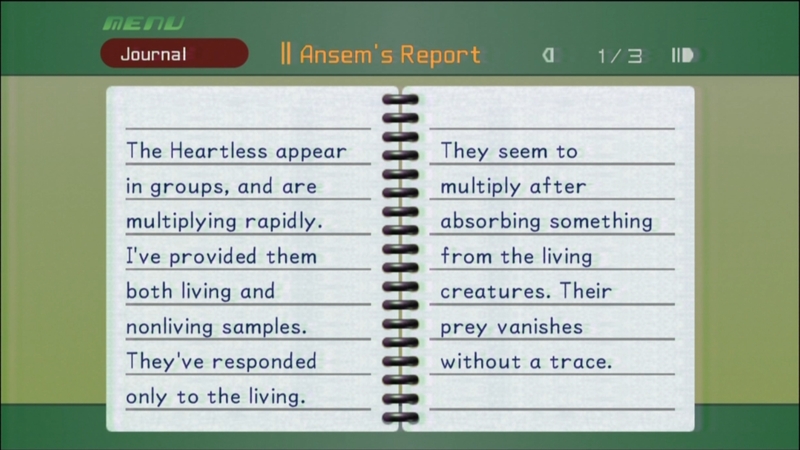 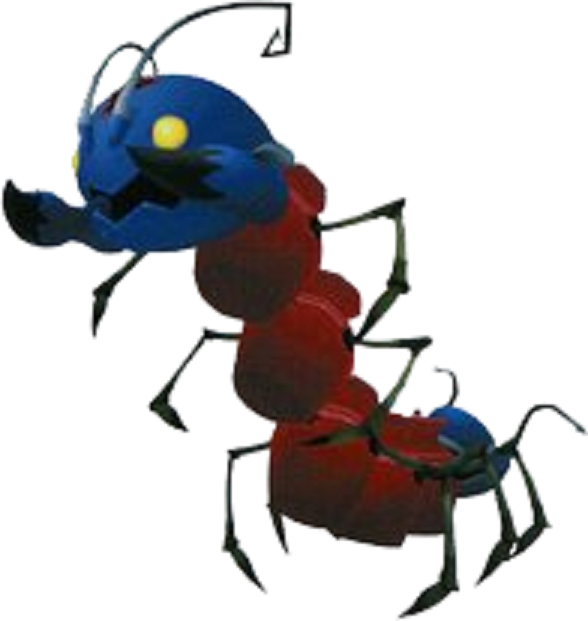 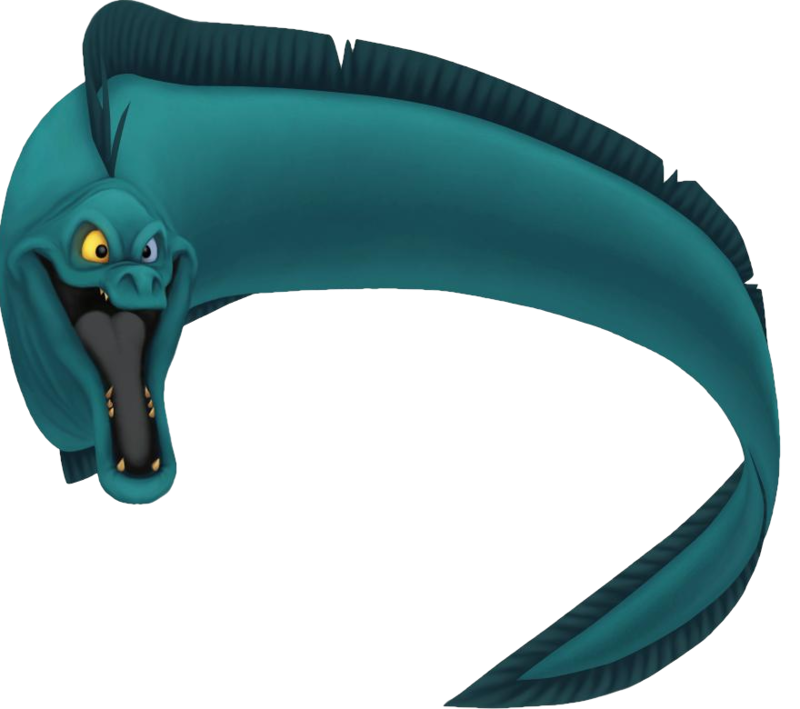 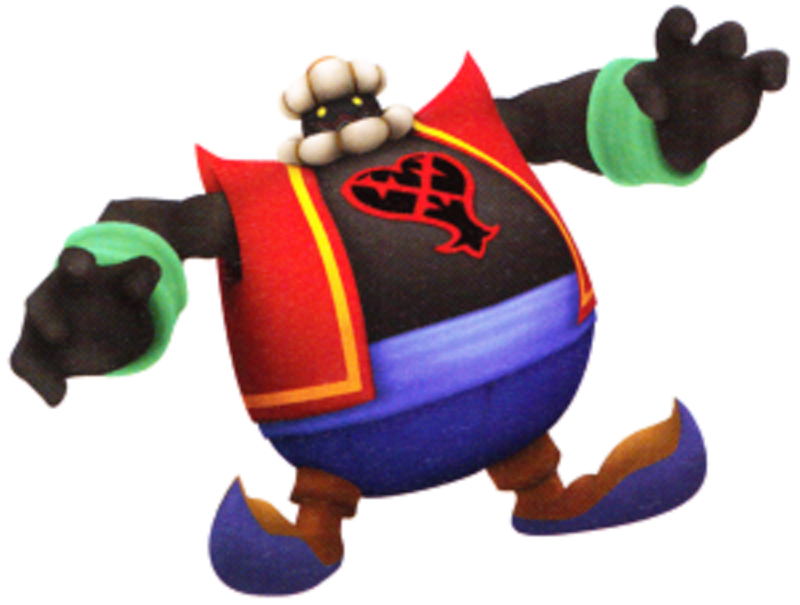 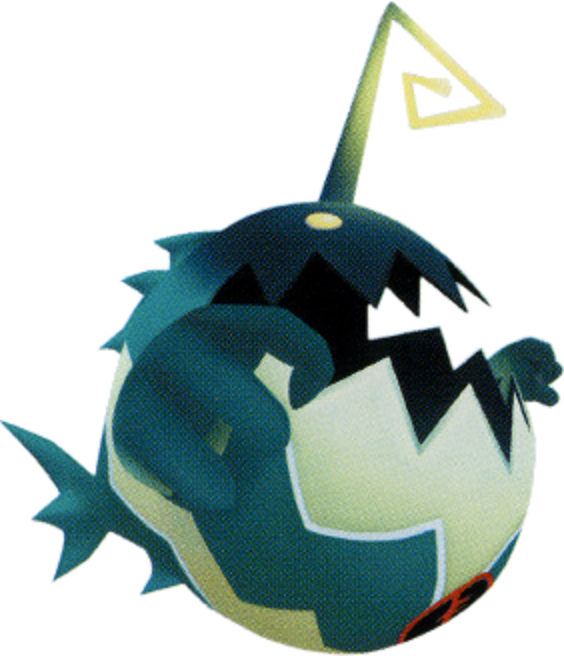 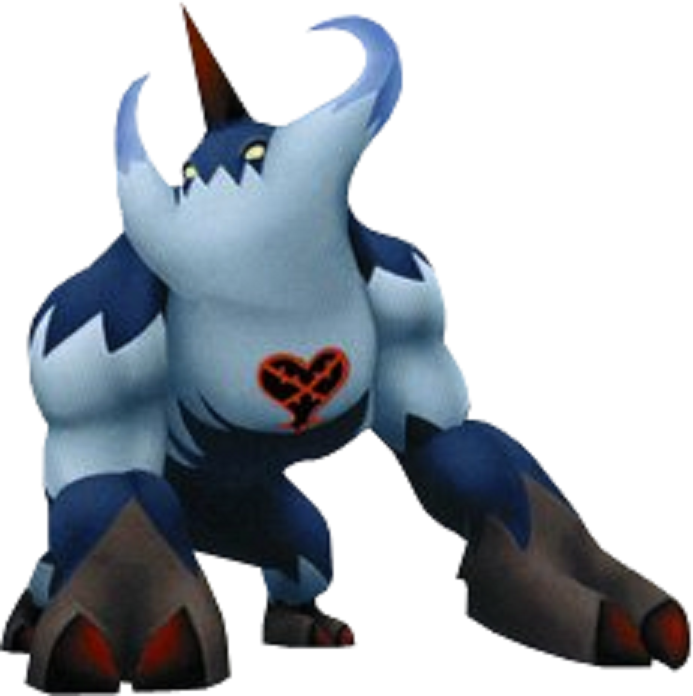 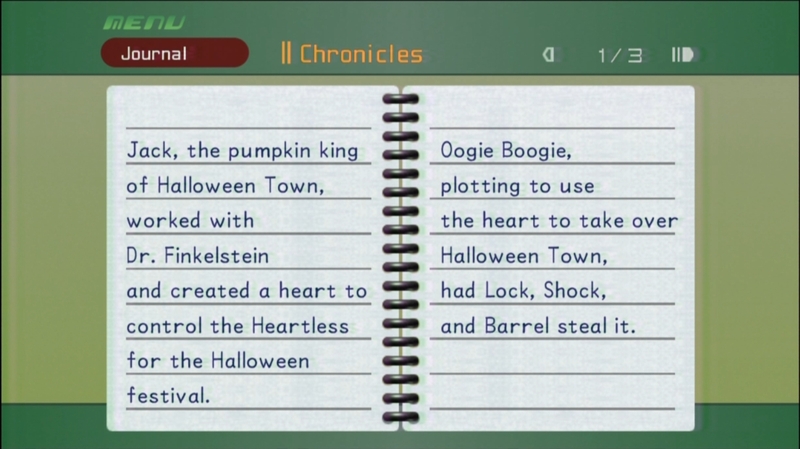 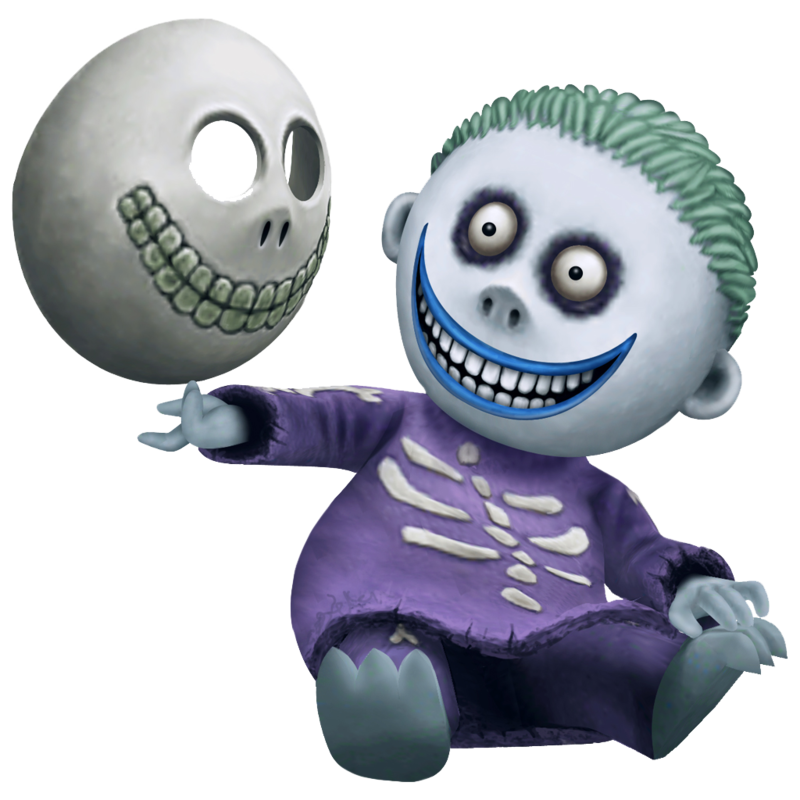 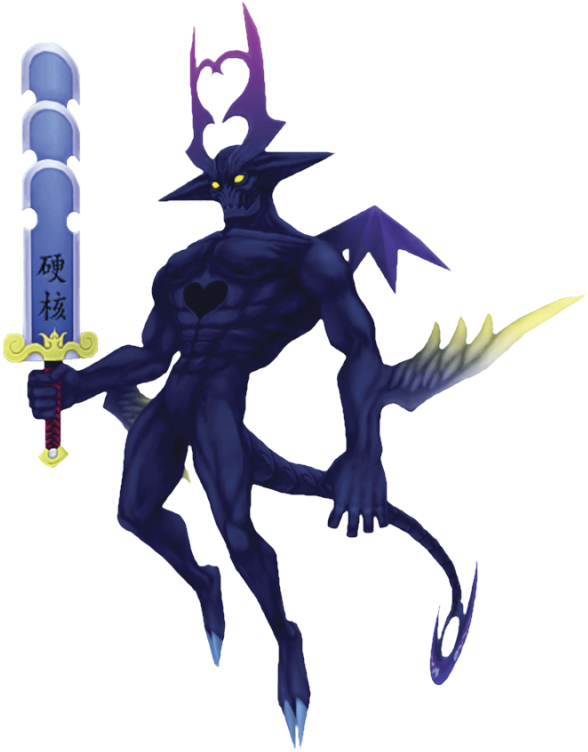 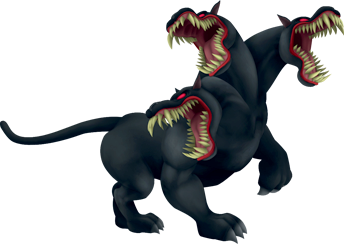 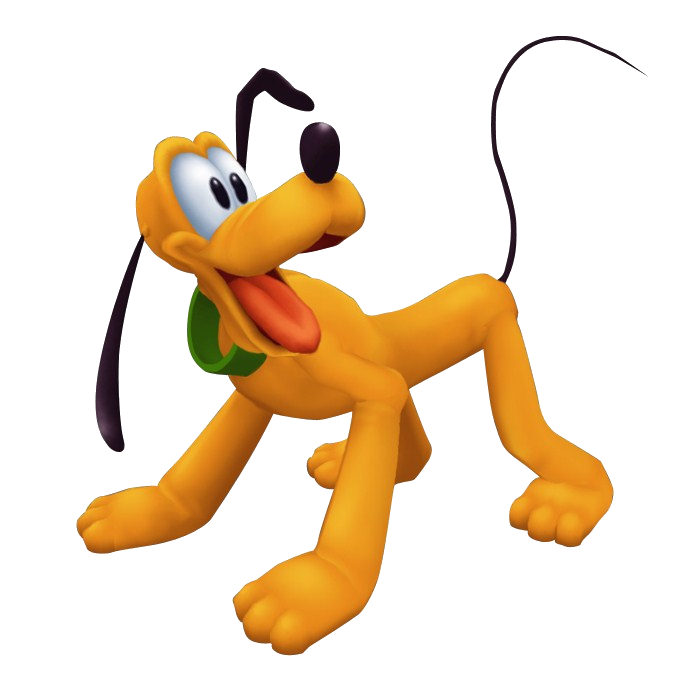 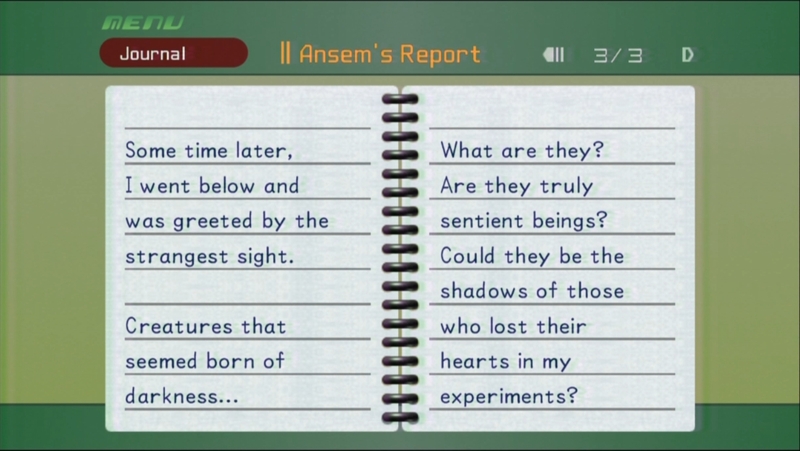 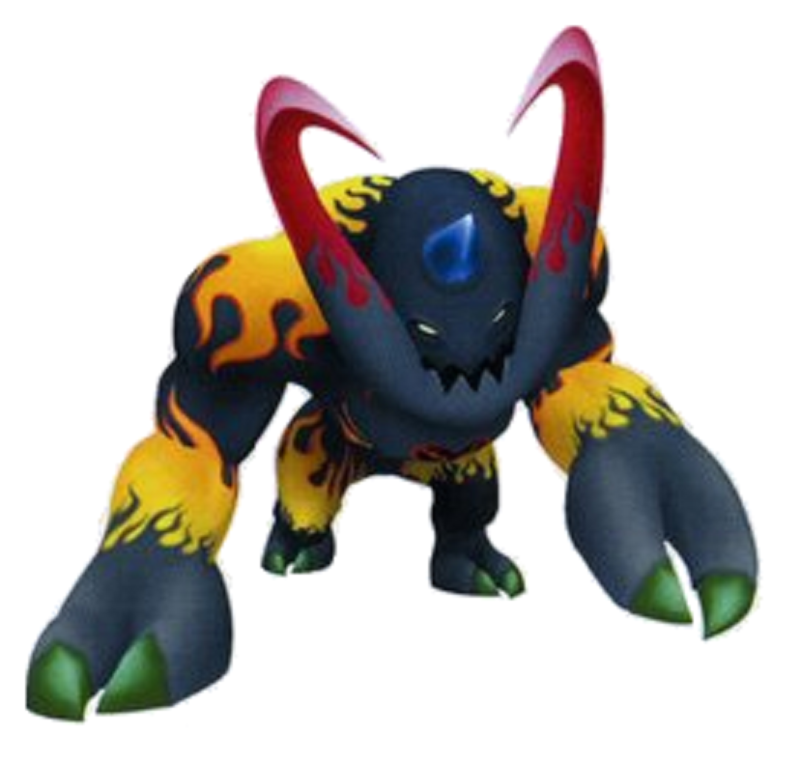 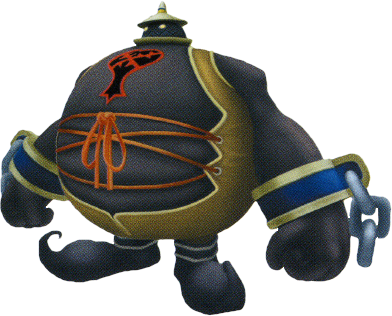 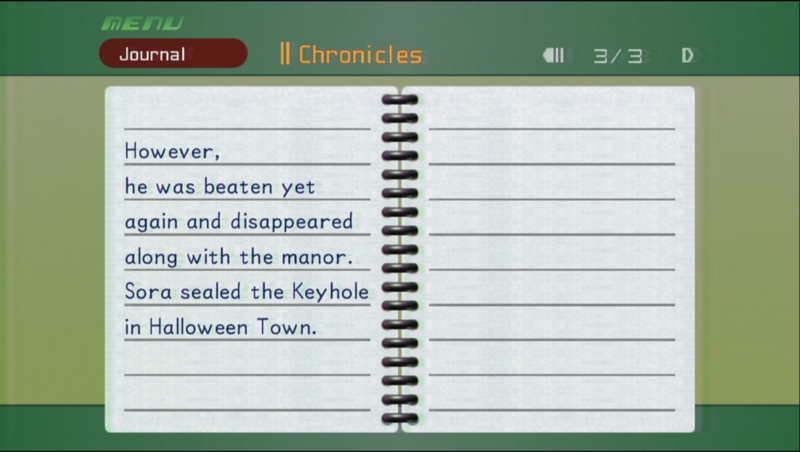 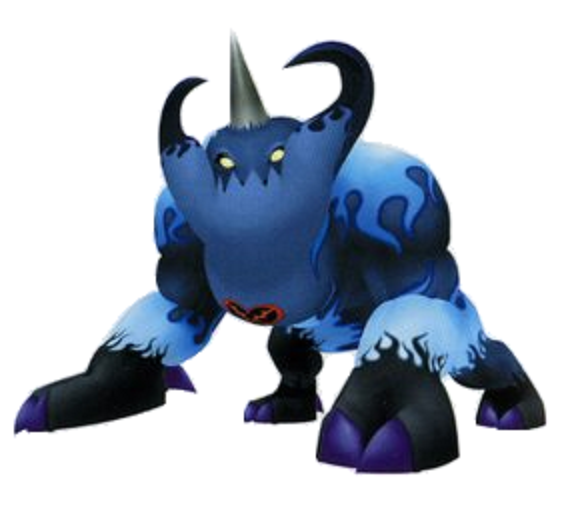 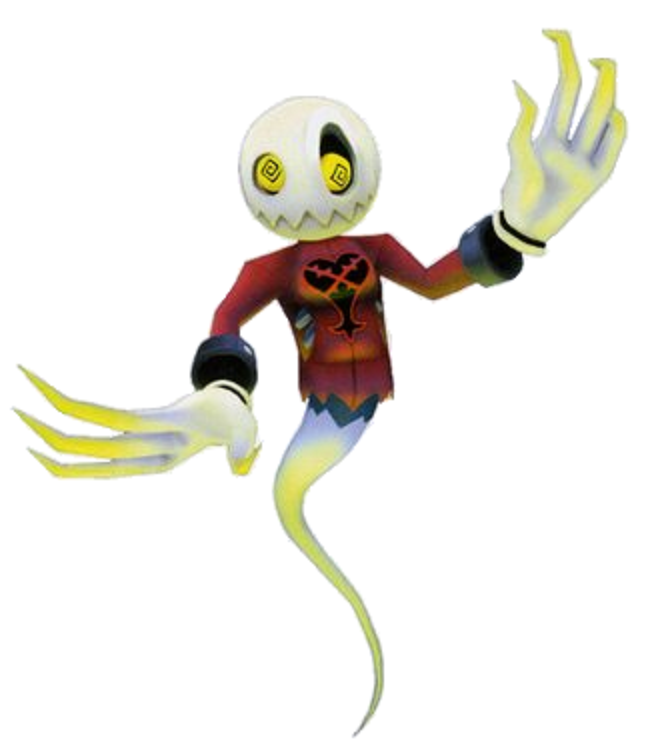 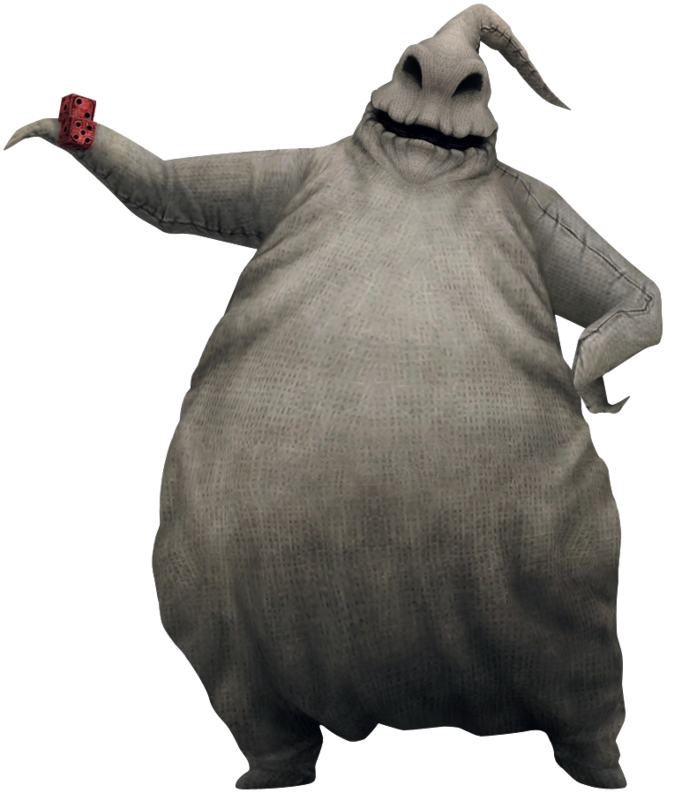 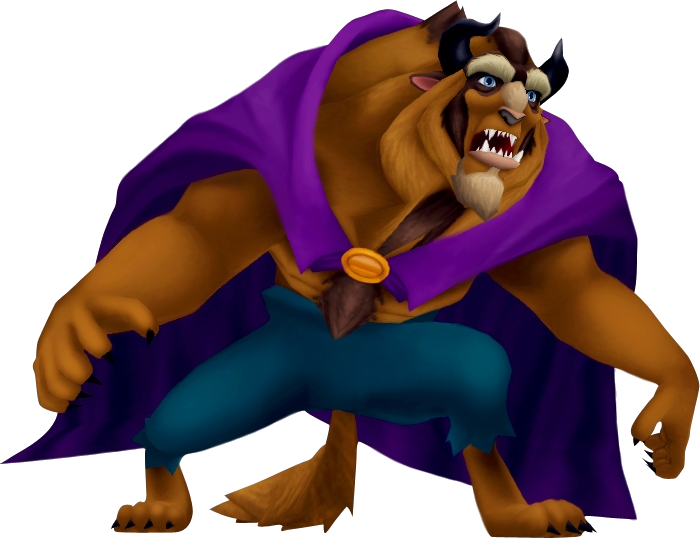 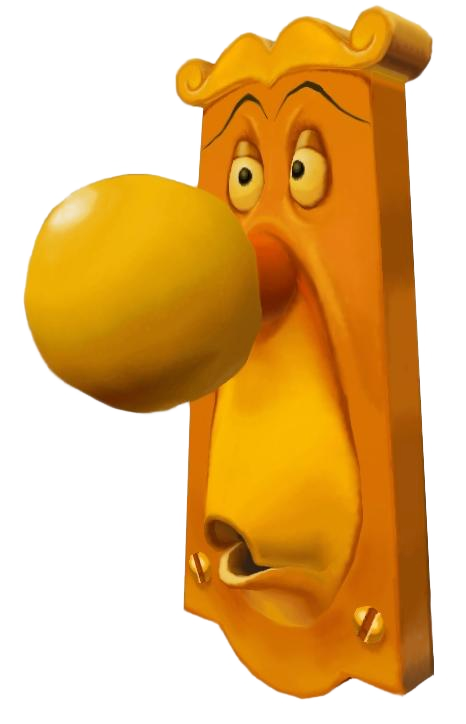 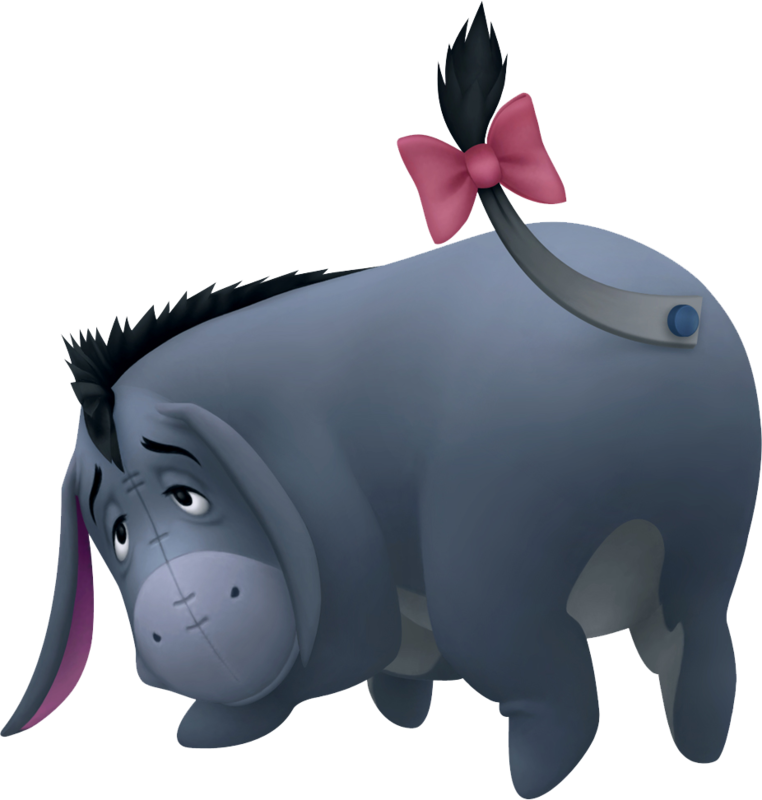 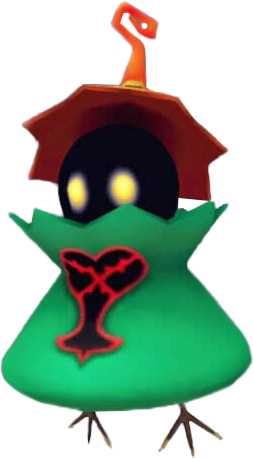 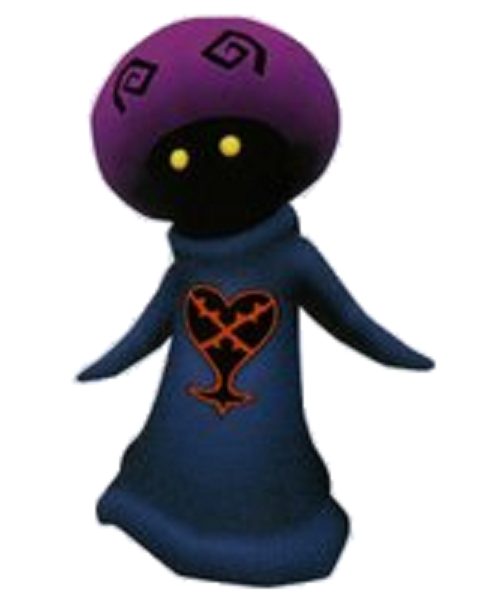 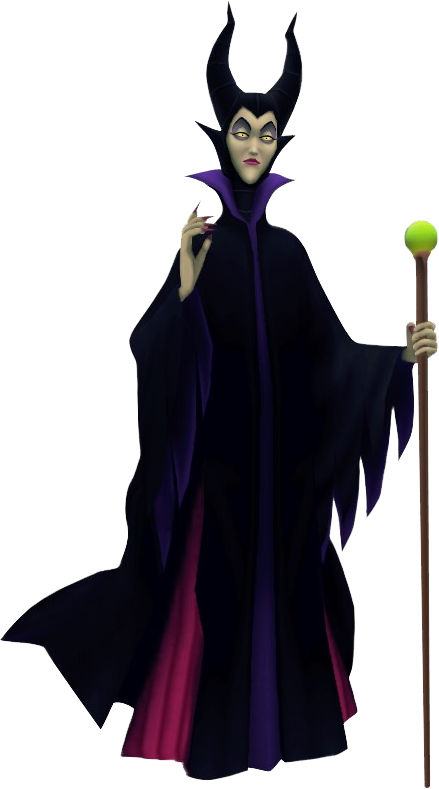 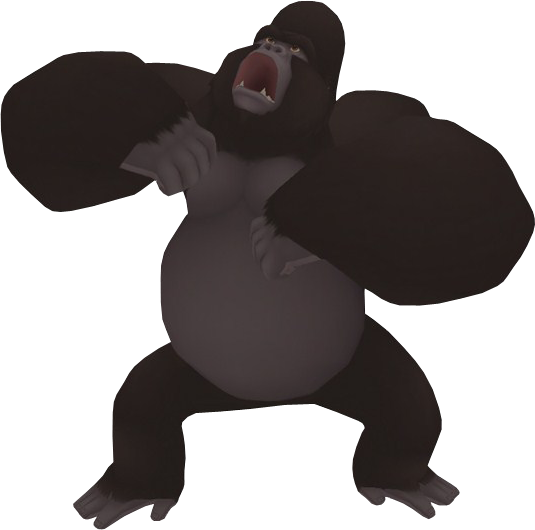 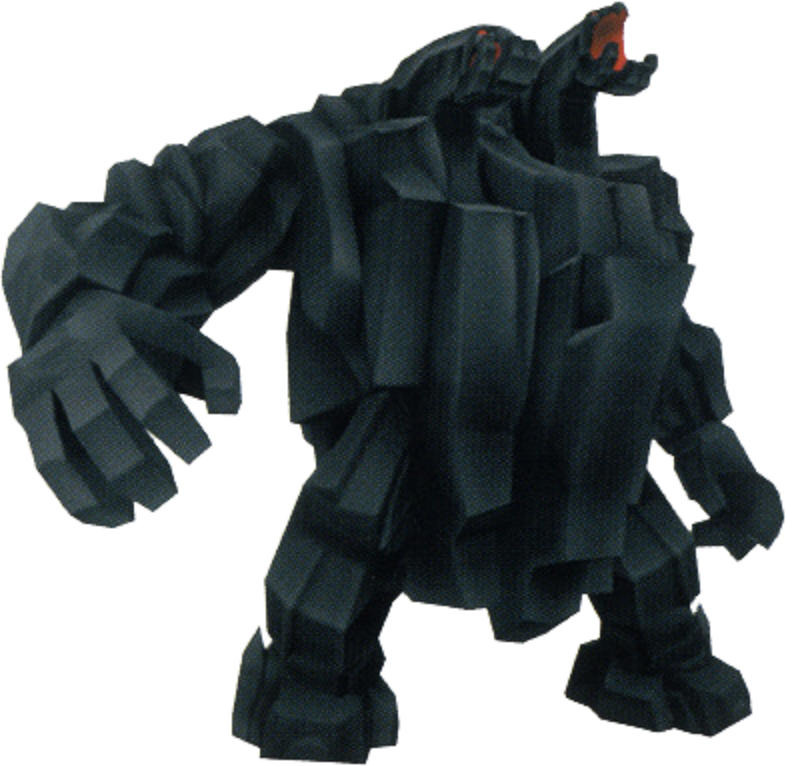 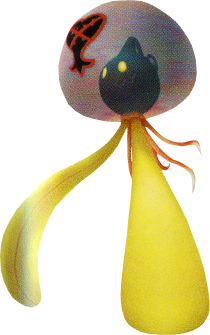 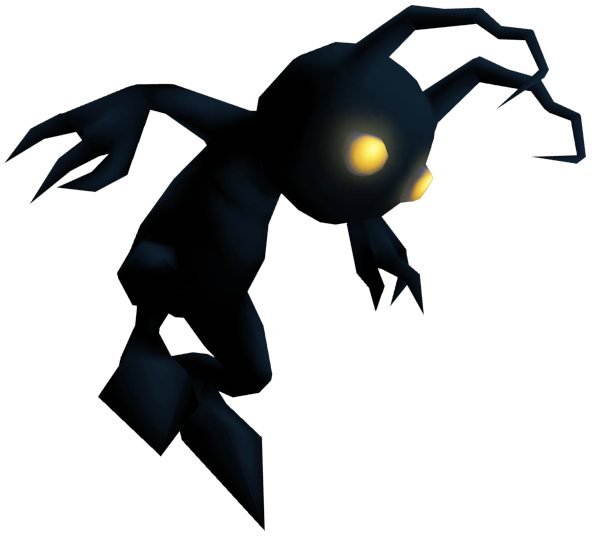 A Heartless similar to the Search Ghost, often spotted within Monstro. 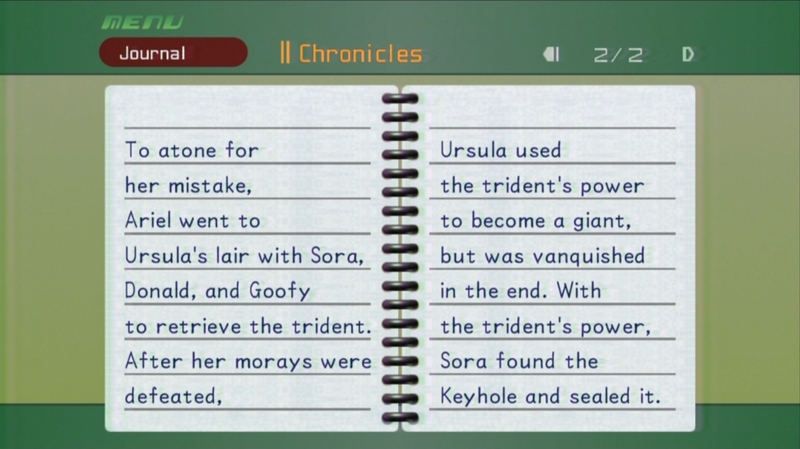 Weapon attacks do no damage, only causing it to drop items. 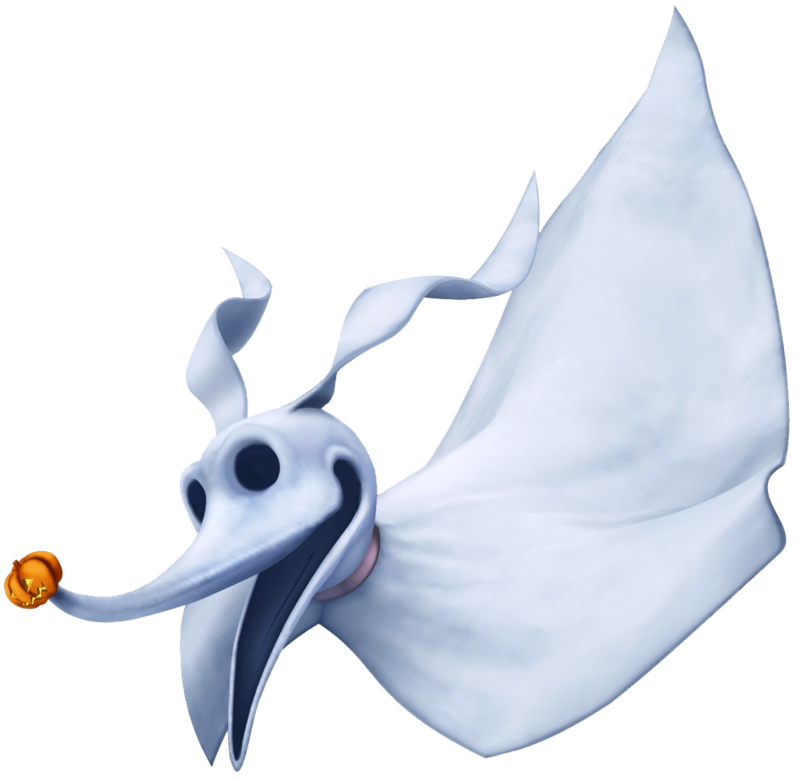 Approach the phantom and use said items for a startling discovery. 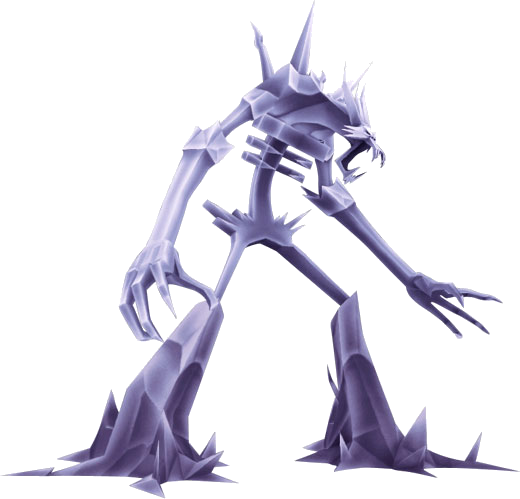 Drops: A number of Frost Stones depending on which healing items you use on it. 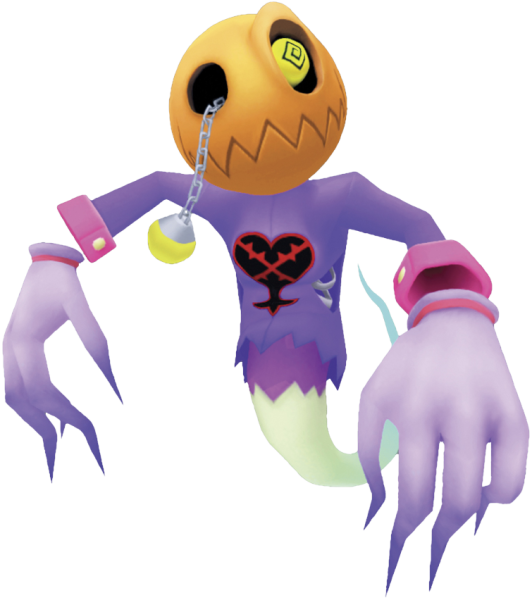 A Heartless wandering the streets of Halloween Town. 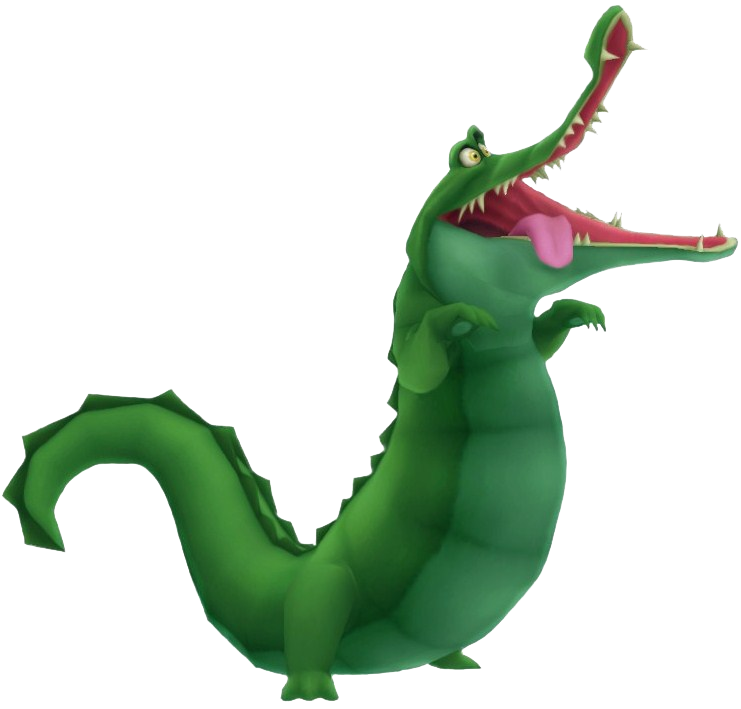 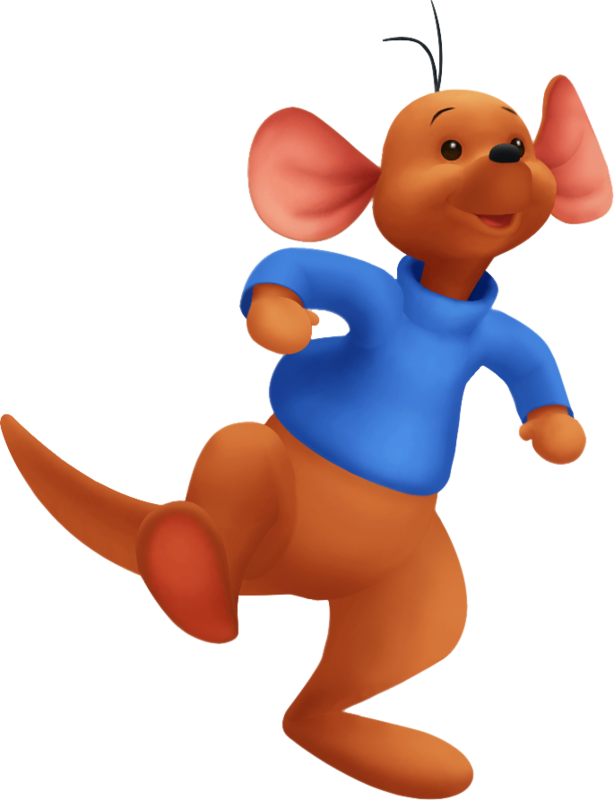 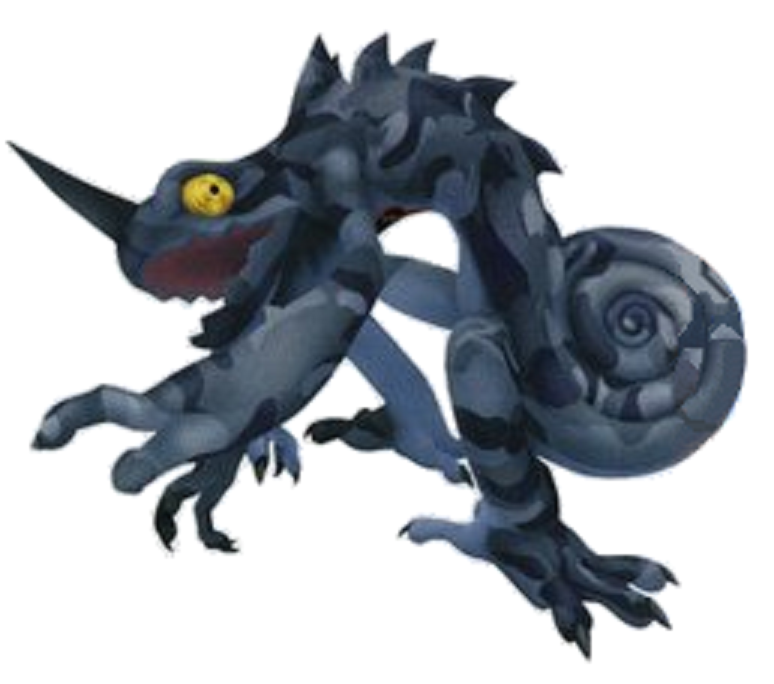 Generally a slow-paced creature, it attacks quickly and relentlessly when angered. 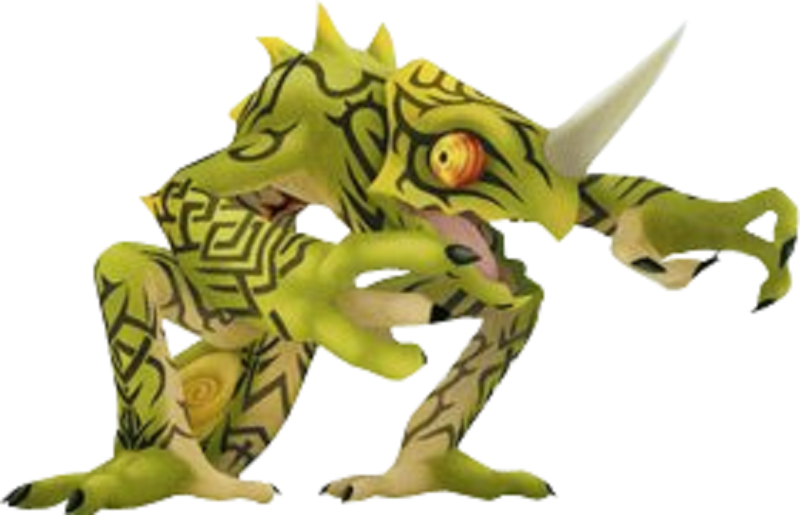 Armed with various abilities such as summoning Gargoyles, one must use this creature's own tricks against it. 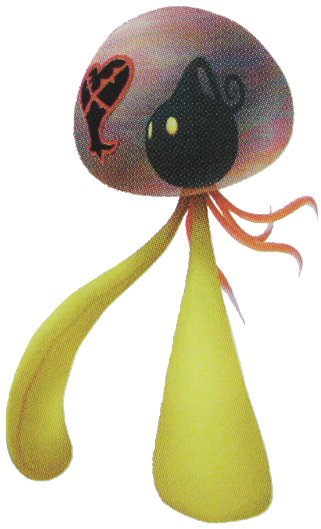 Drops: A number of Blazing Stones depending on the amount of times you reflect the heads it shoots out when it is passed out. 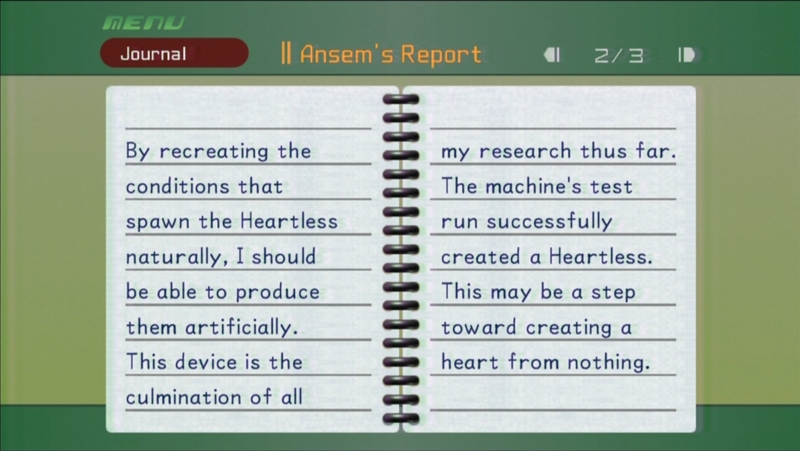 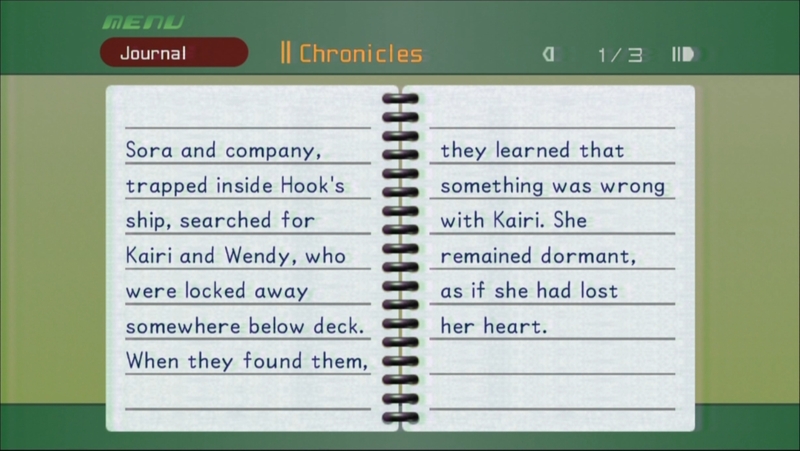 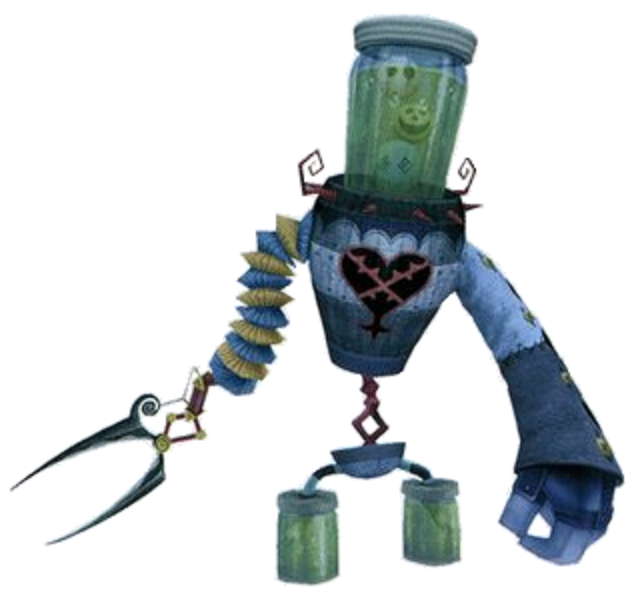 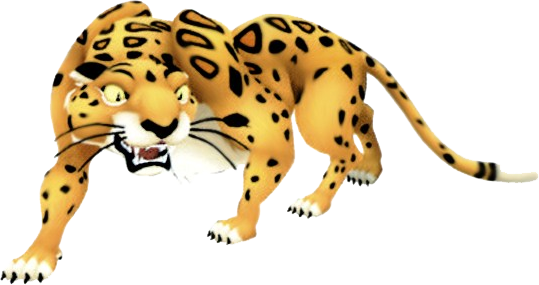 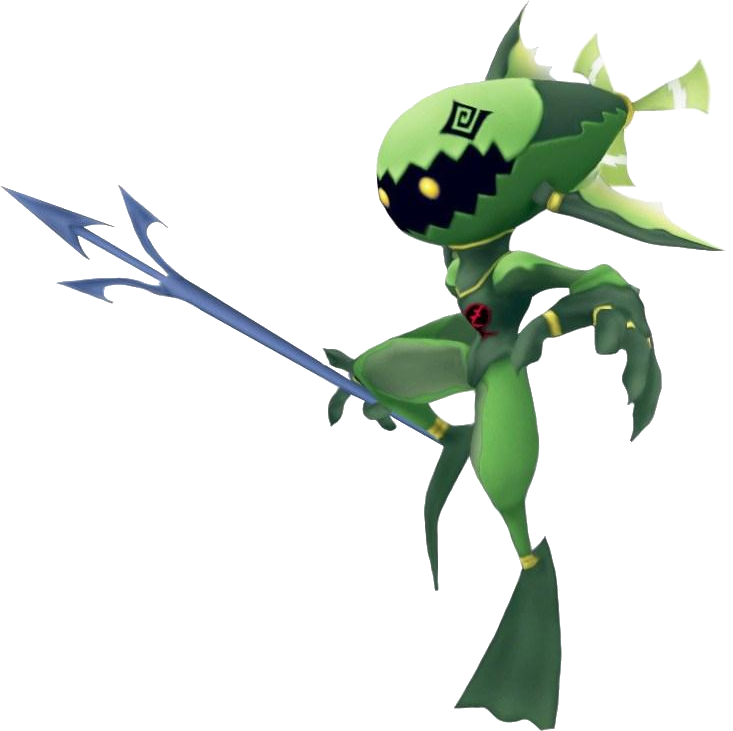 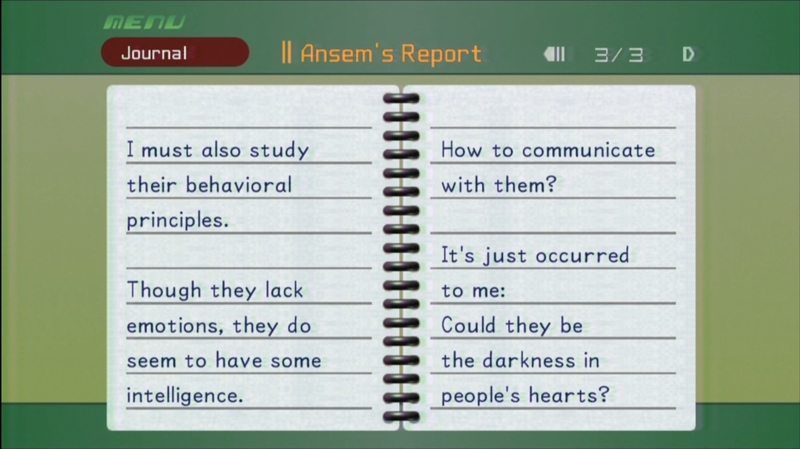 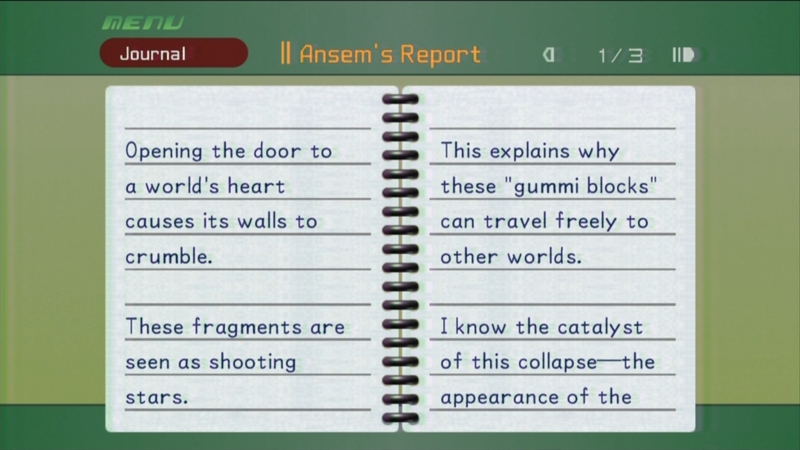 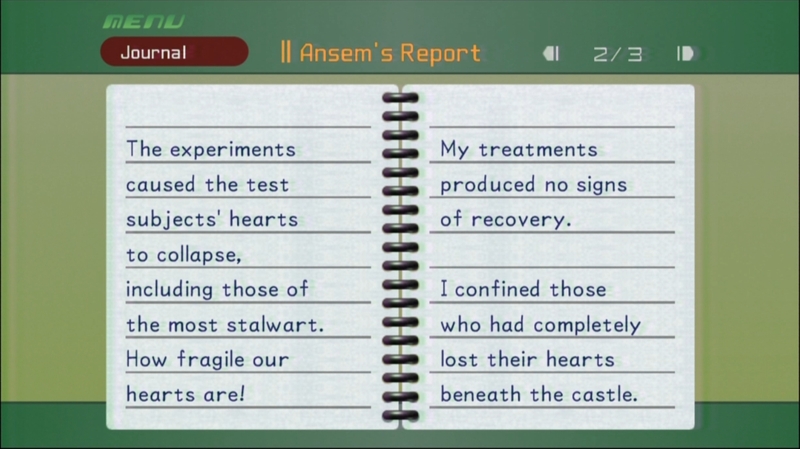 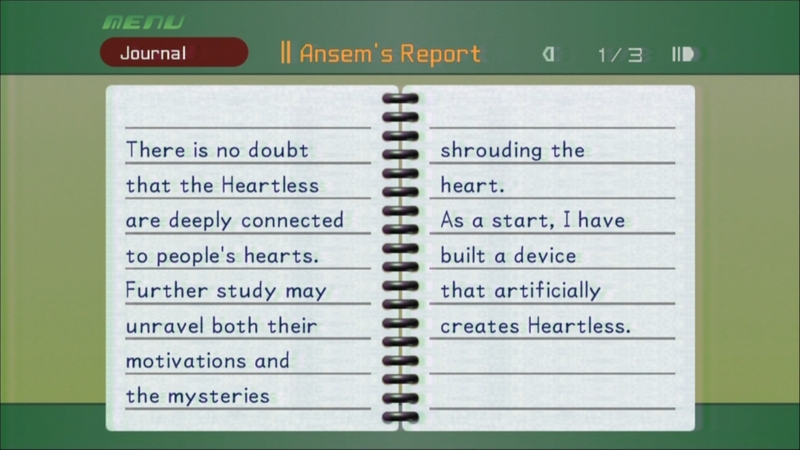 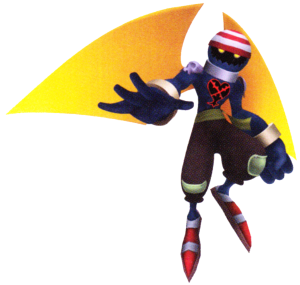 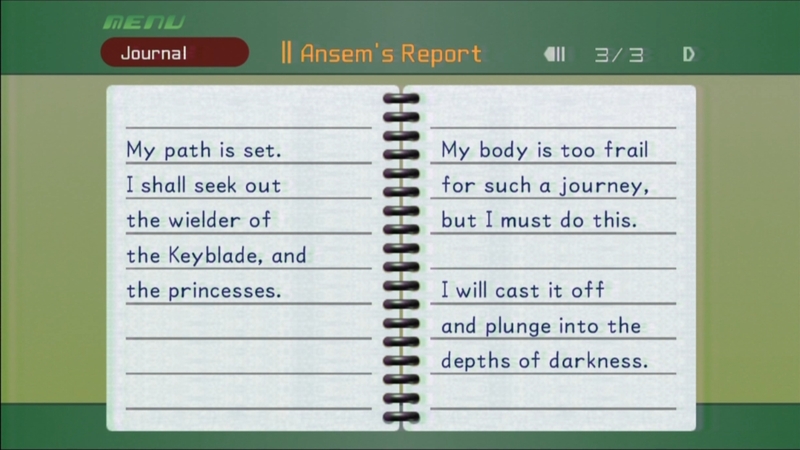 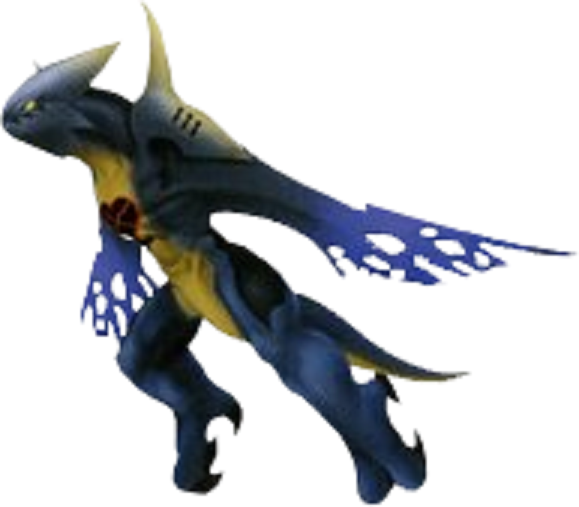 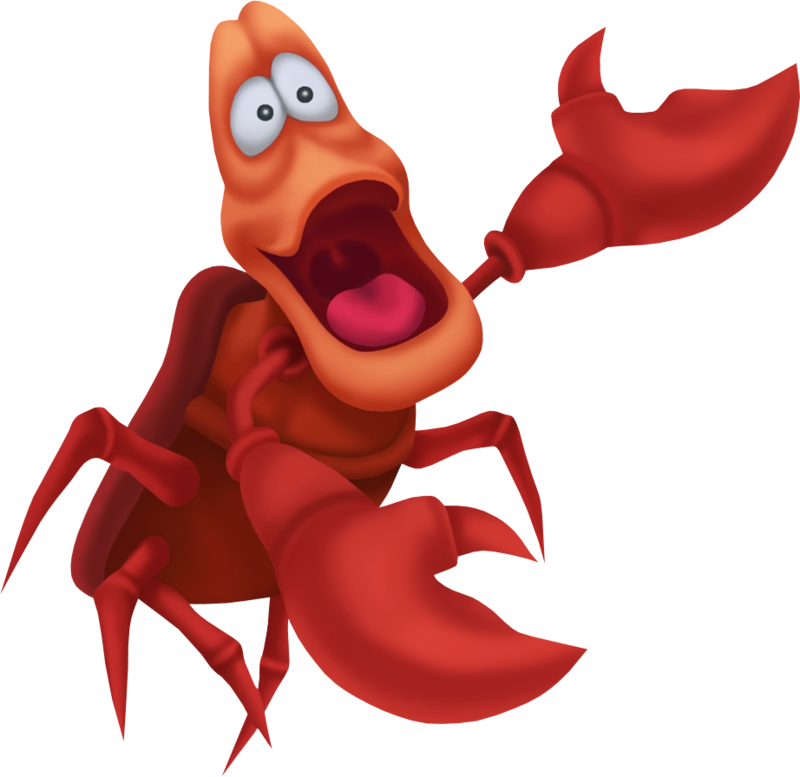 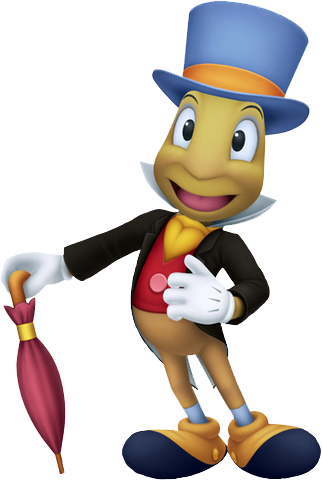 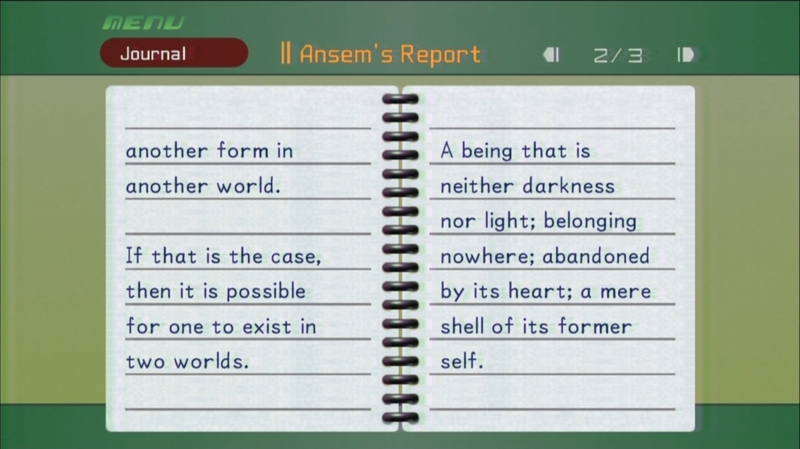 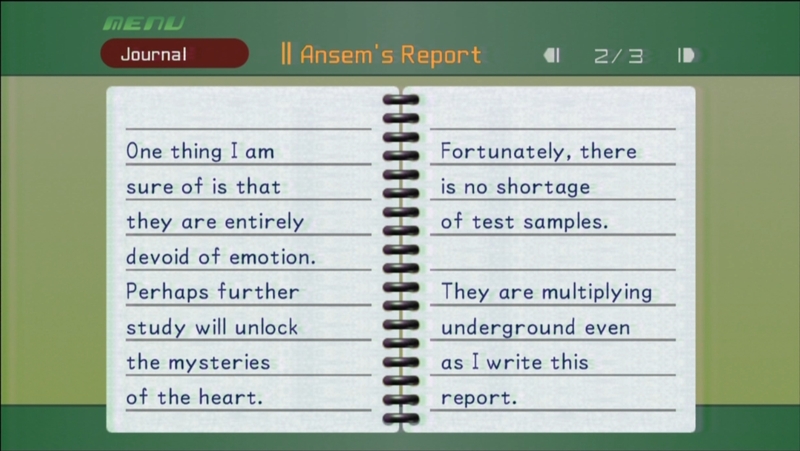 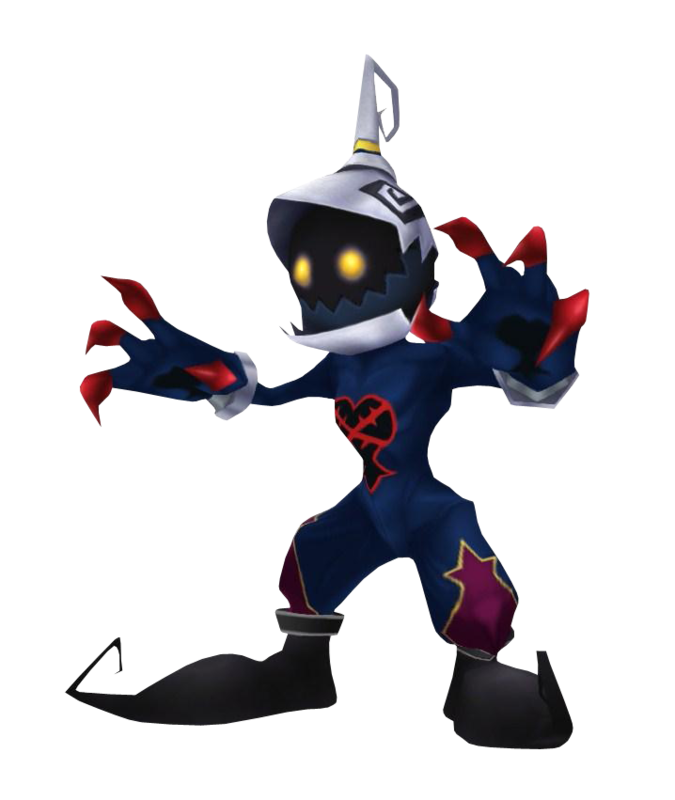 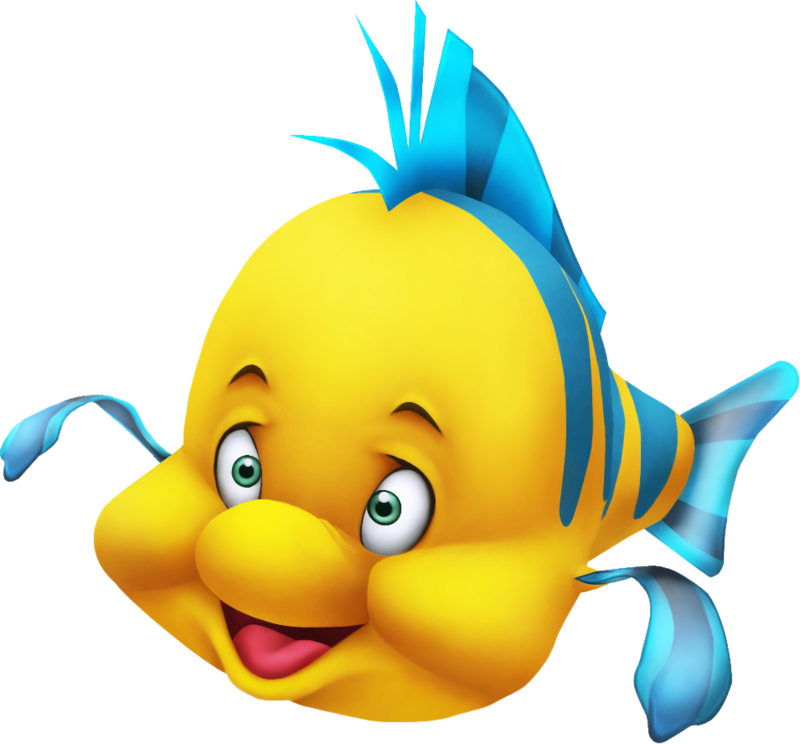 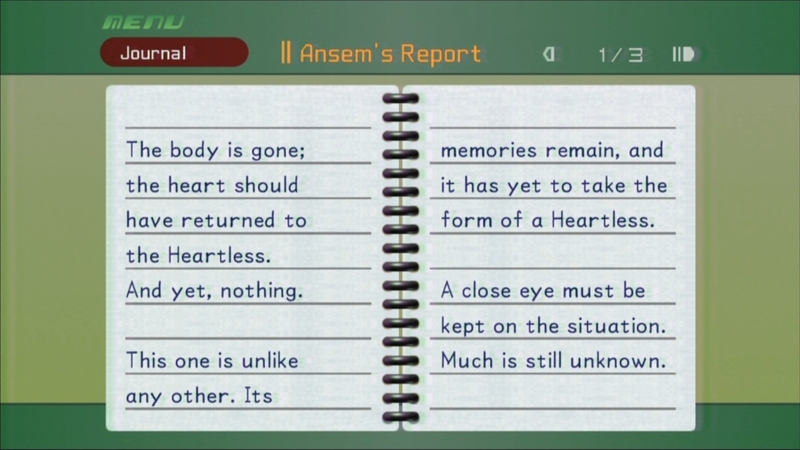 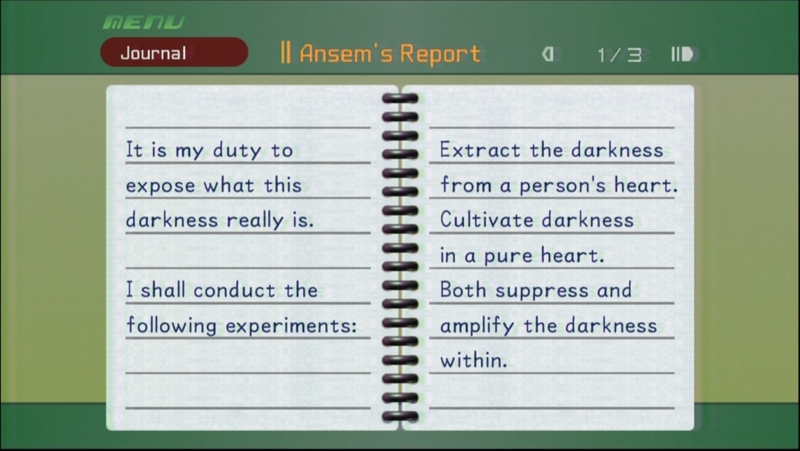 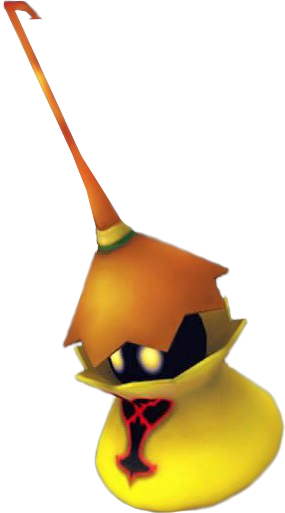 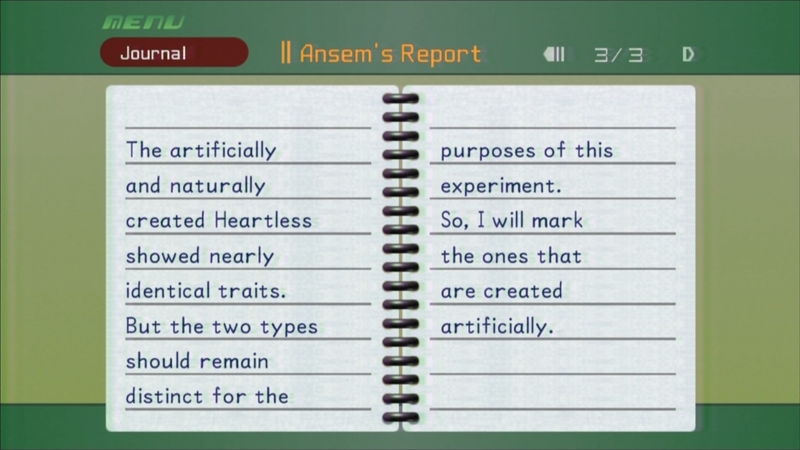 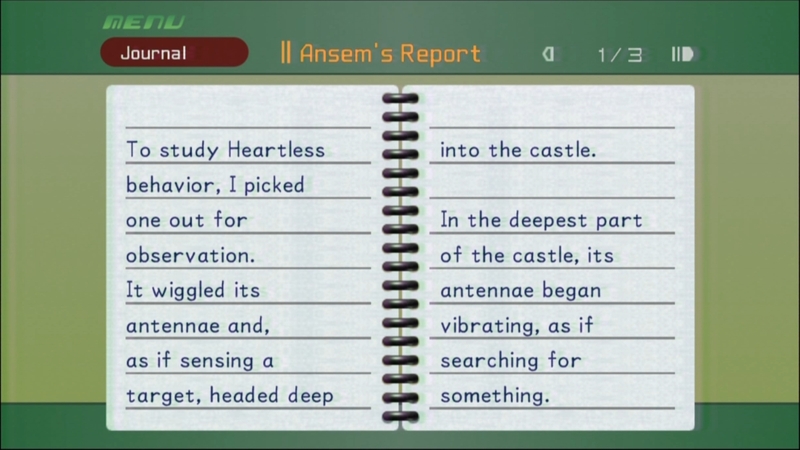 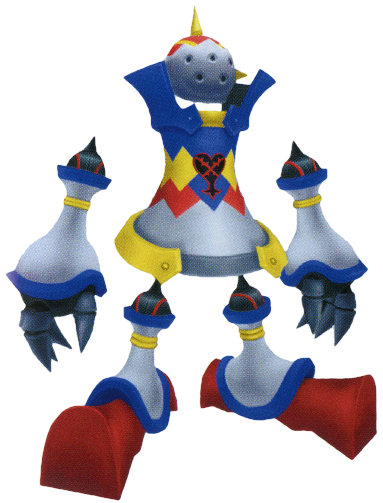 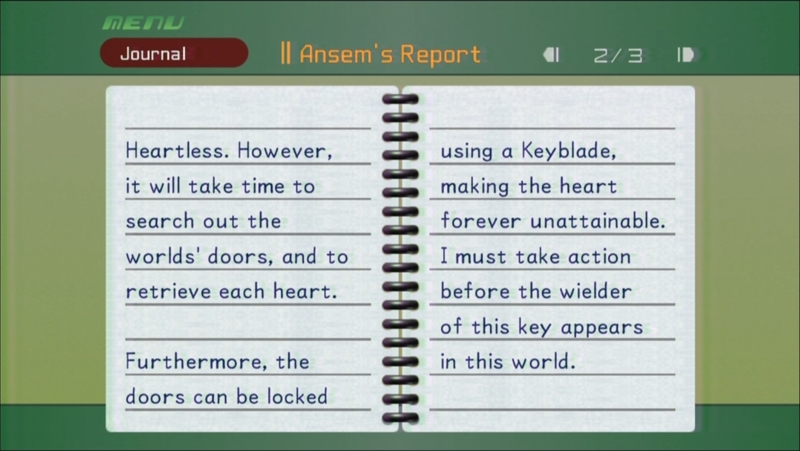 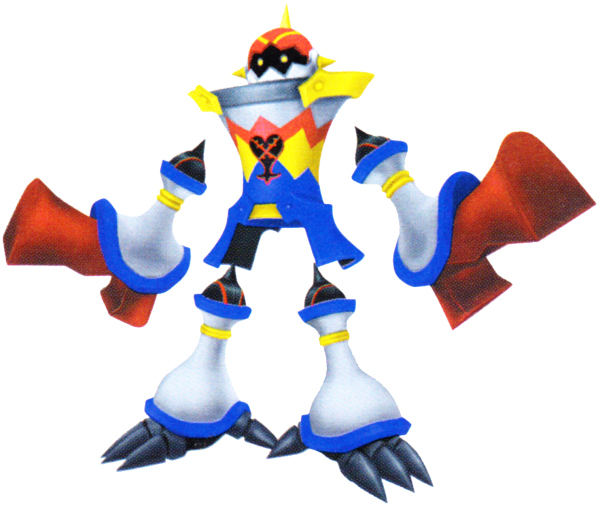 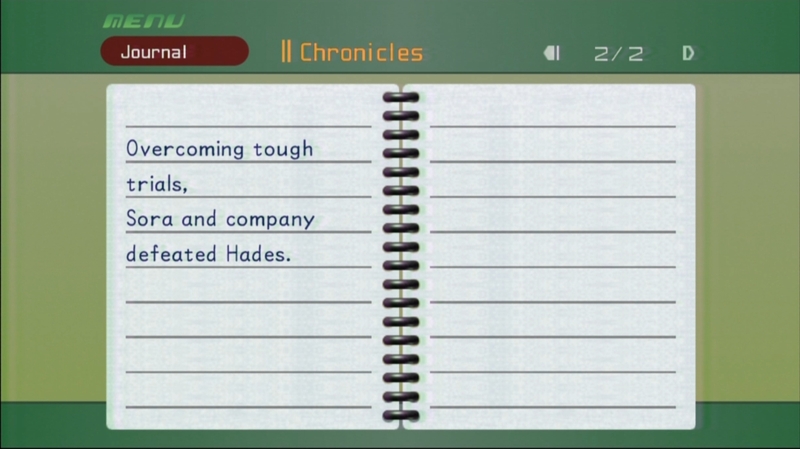 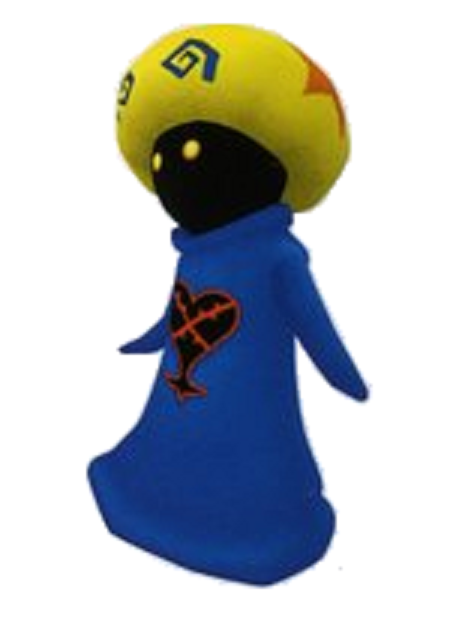 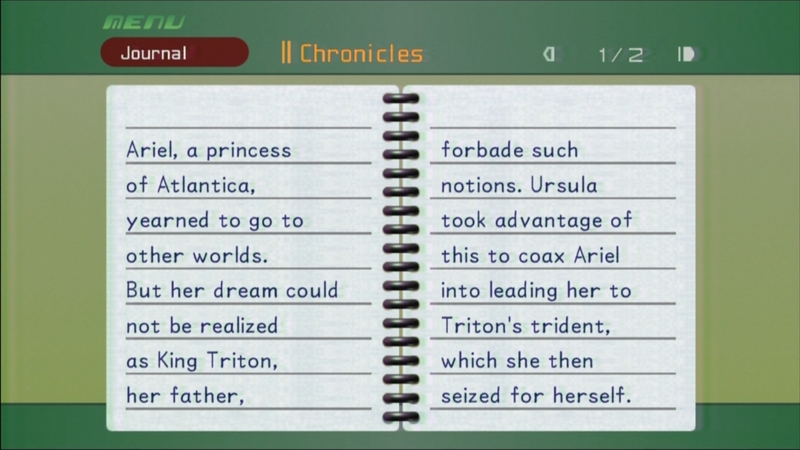 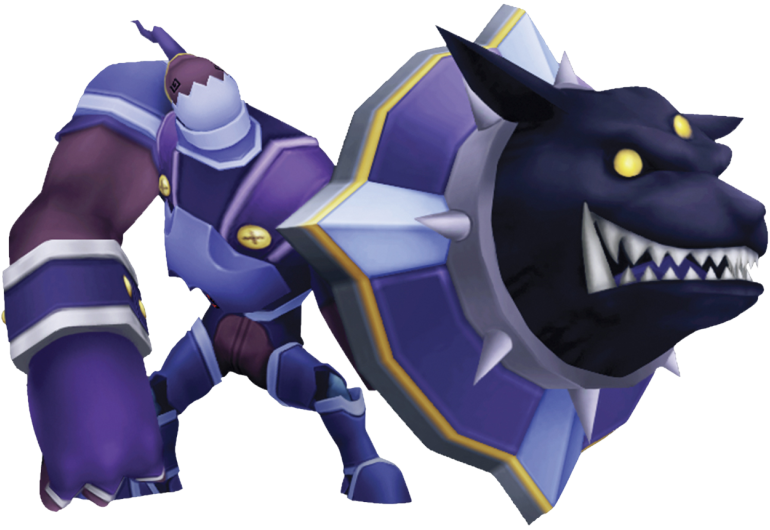 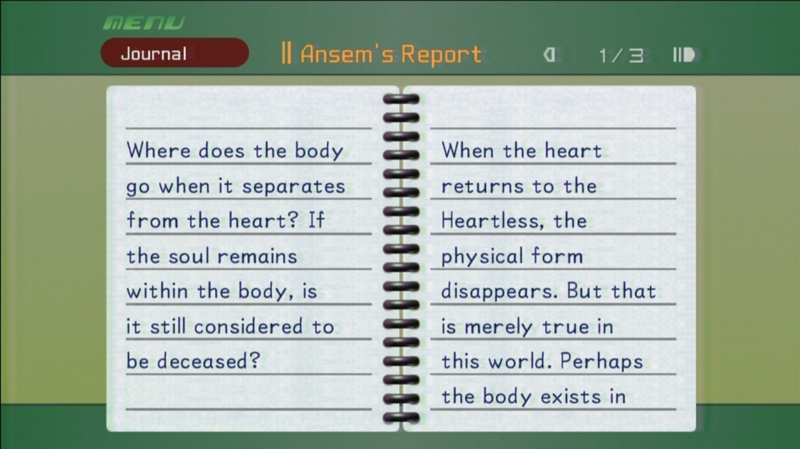 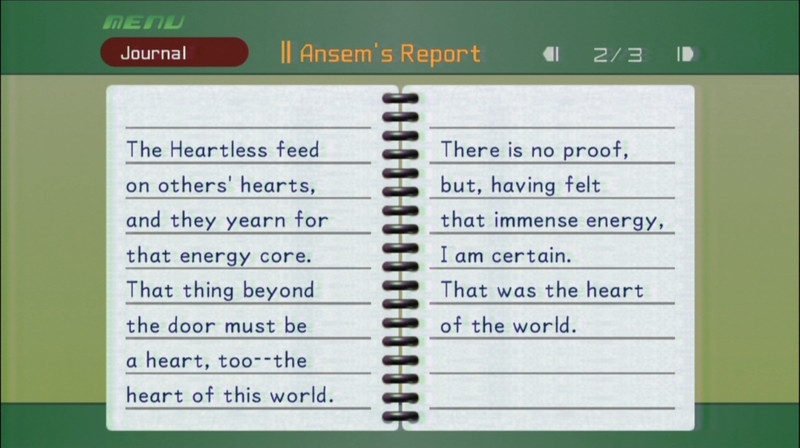 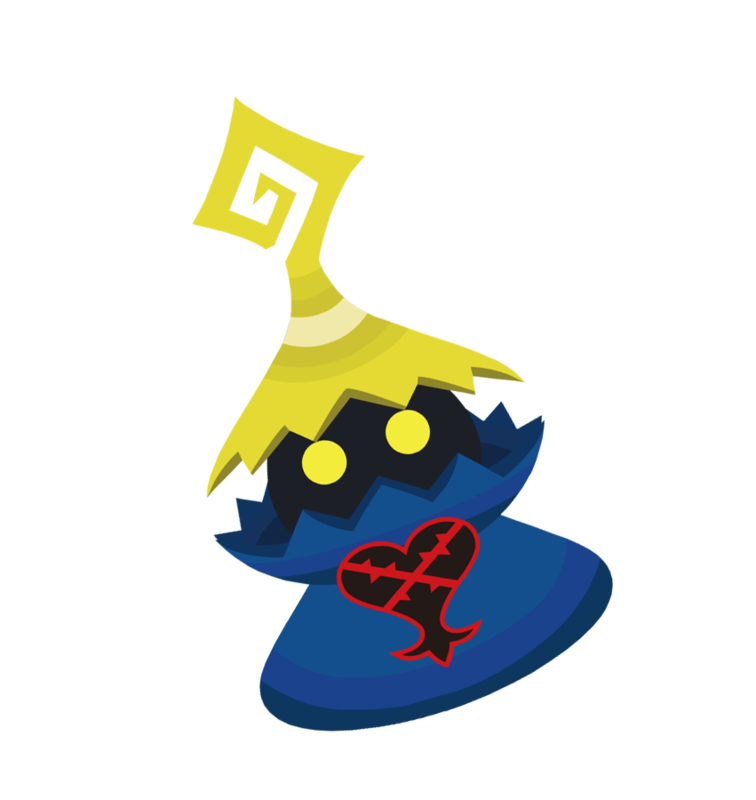 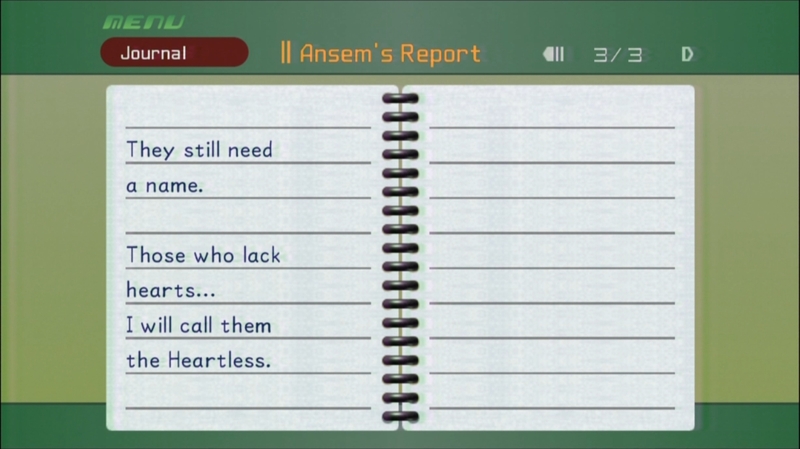 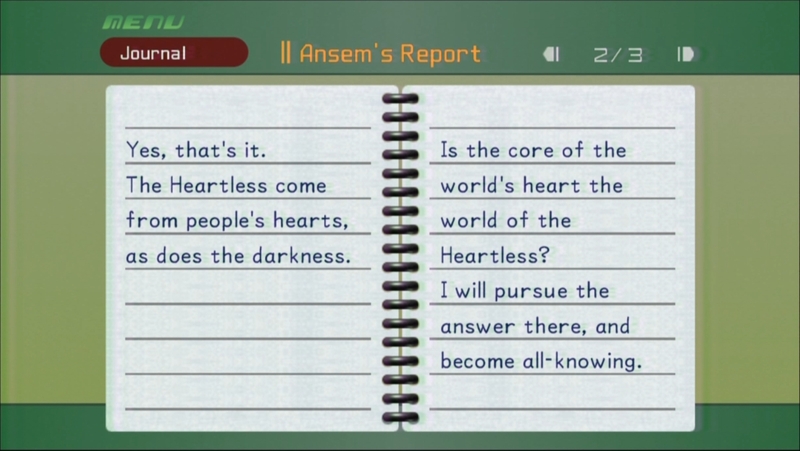 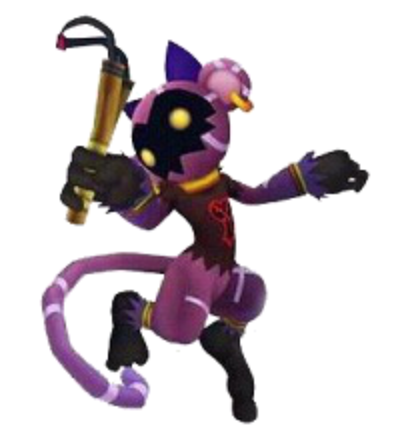 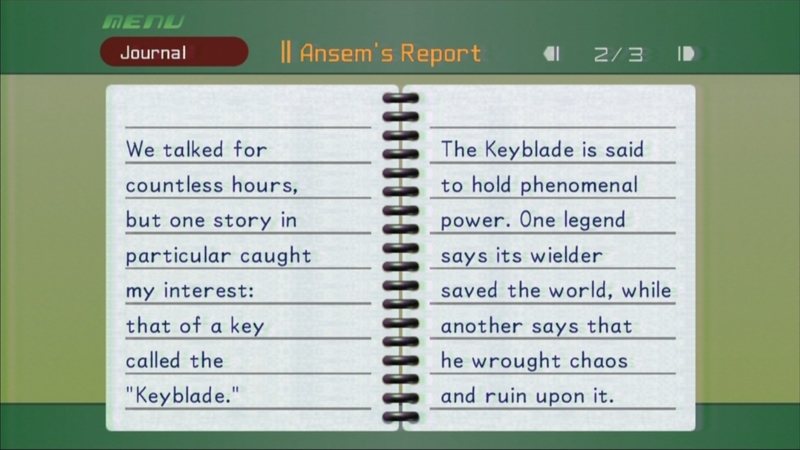 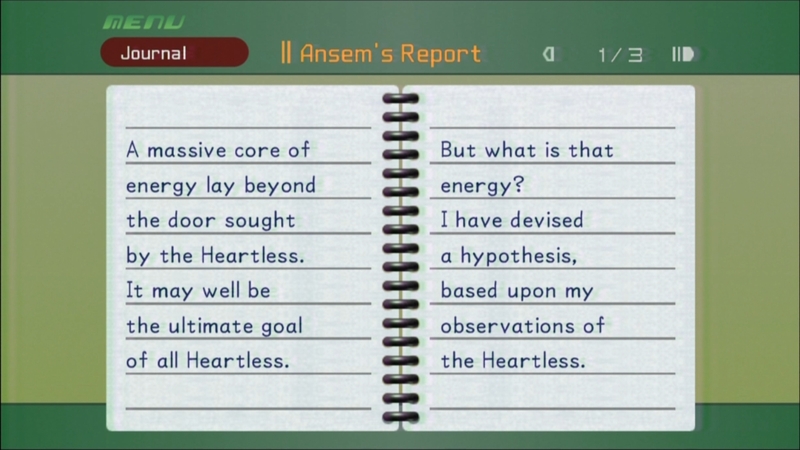 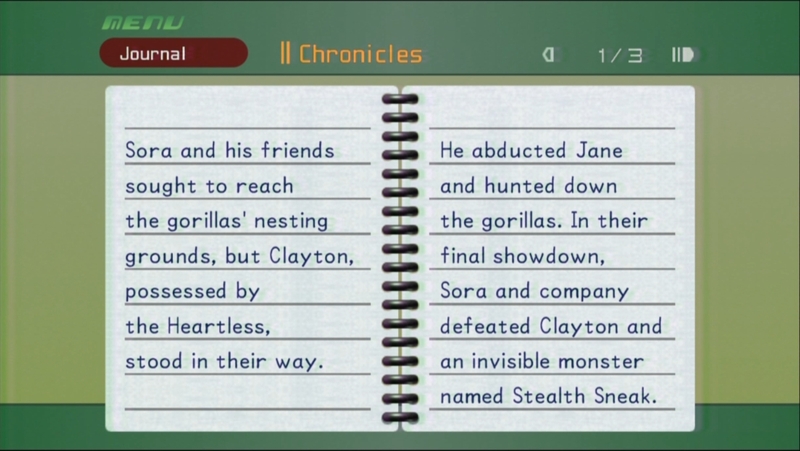 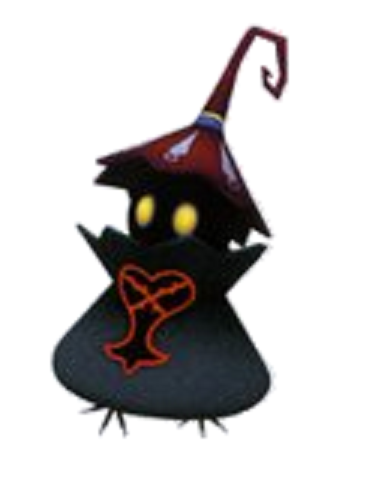 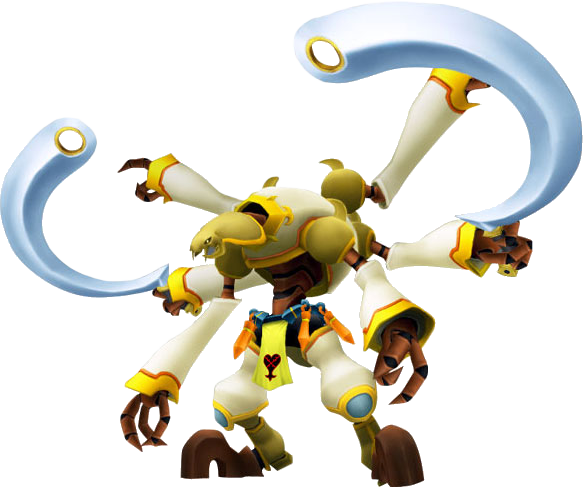 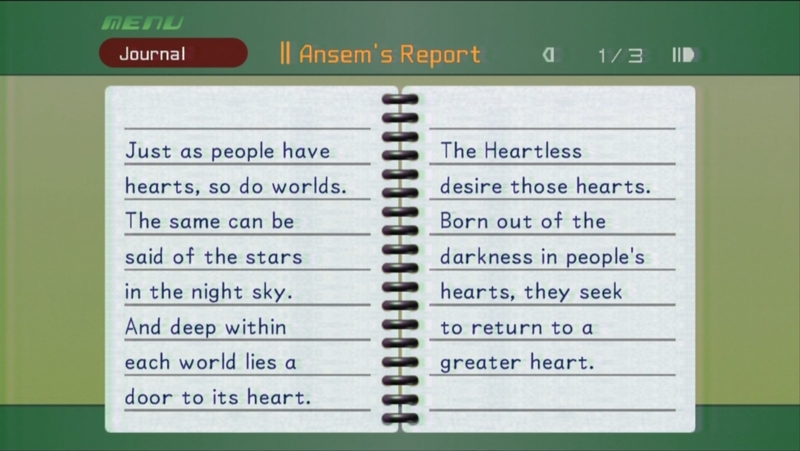 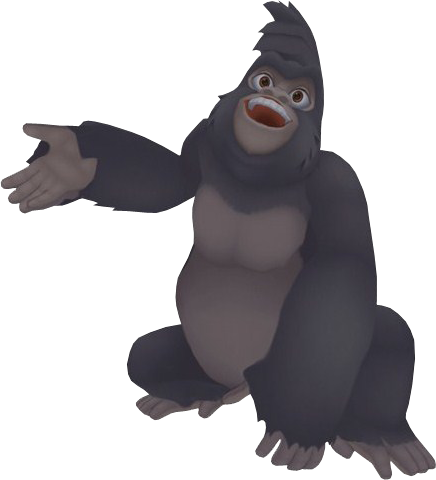 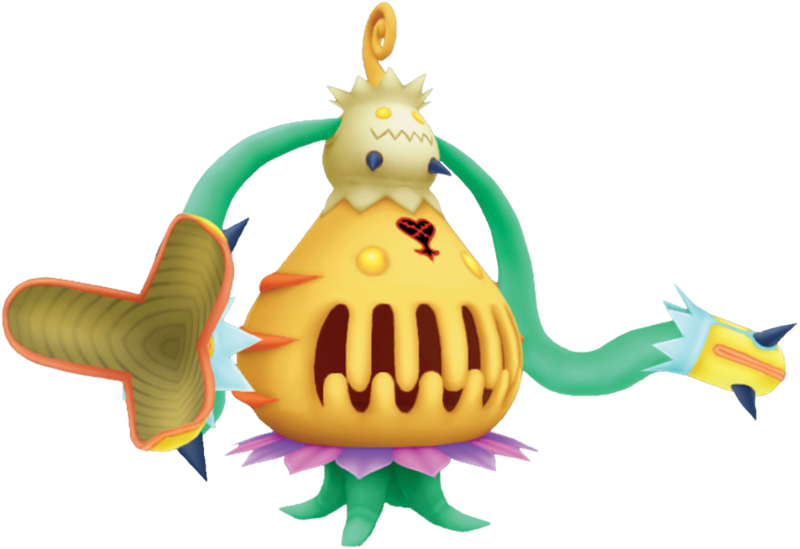 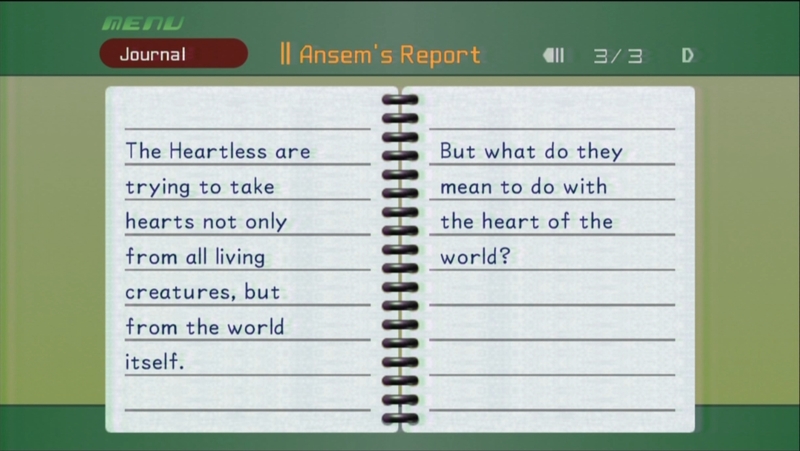 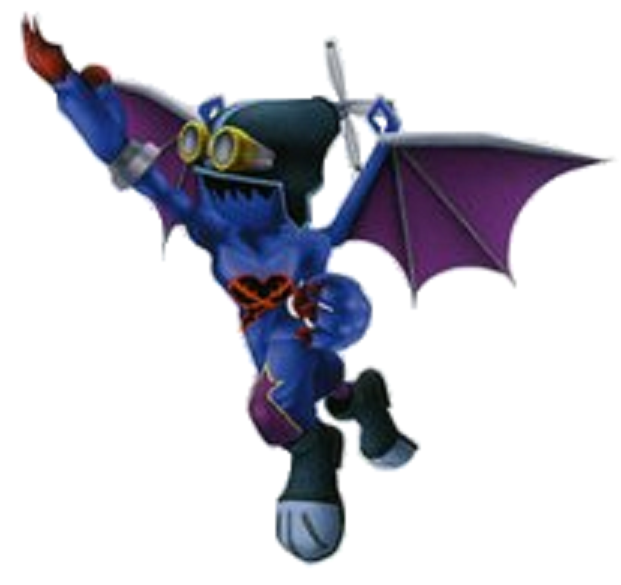 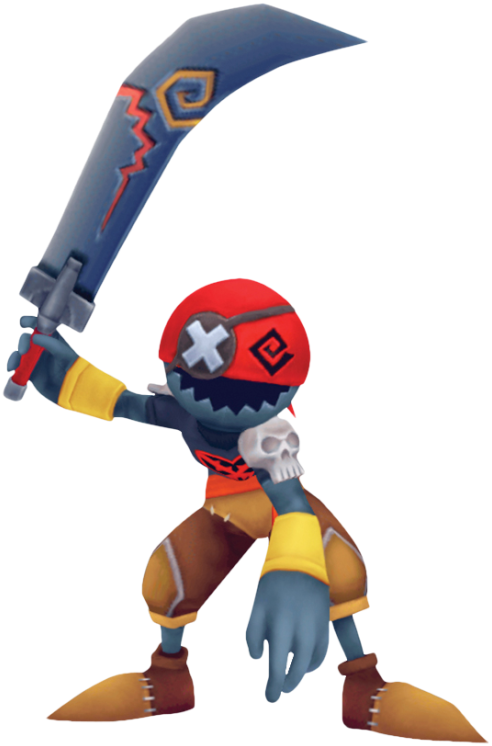 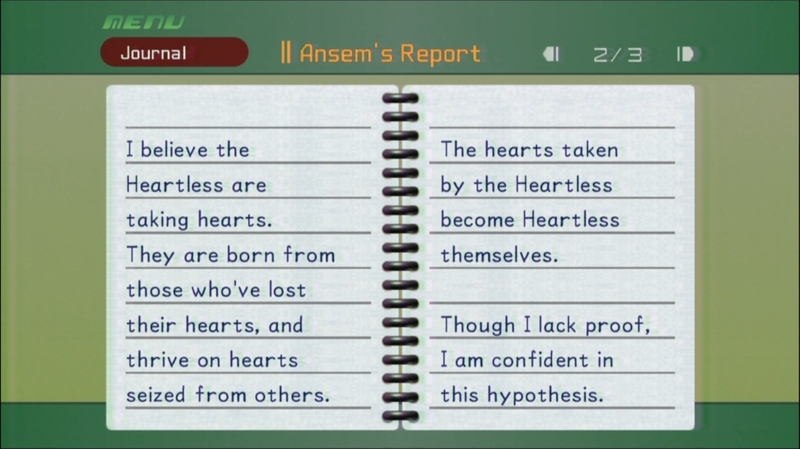 A Heartless similar to the Aquatank. 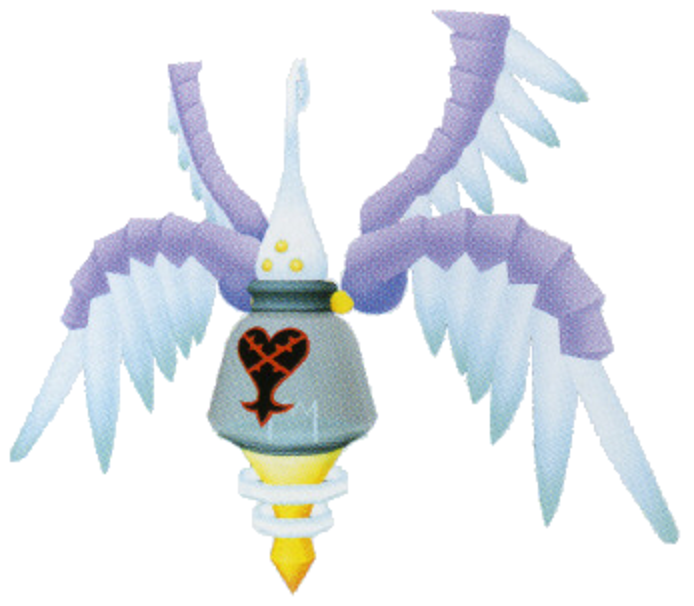 It flies through the air with tremendous speed. 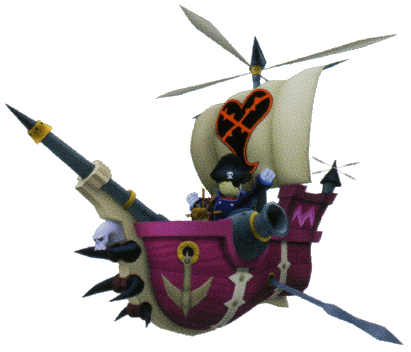 Chasing it will lead to a perilous aerial battle as it unloads its Missile Driver attack, an attack similar to the Screwdriver. 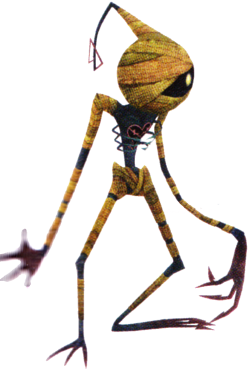 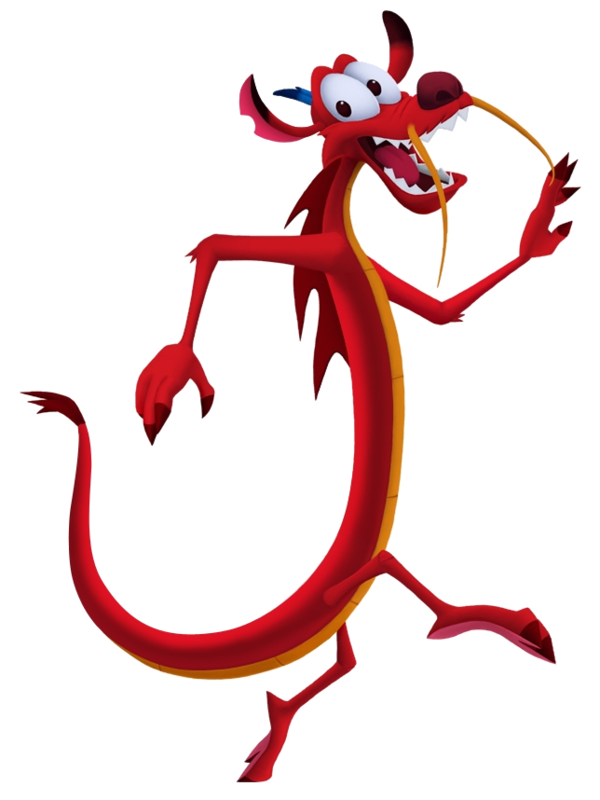 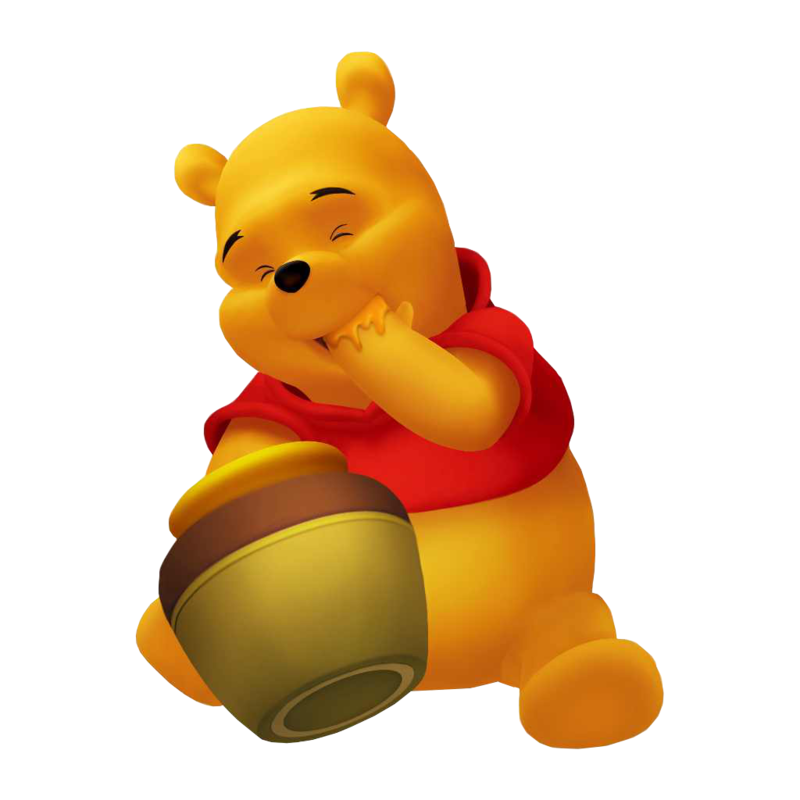 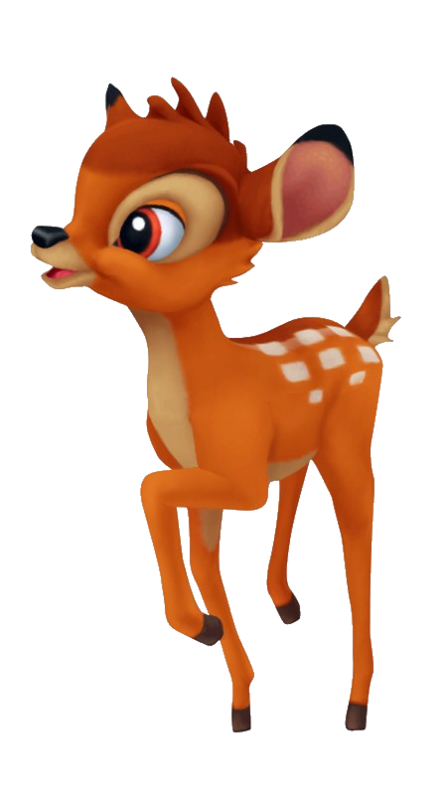 Its heinous nature attracts them to prey who carry lots of munny.